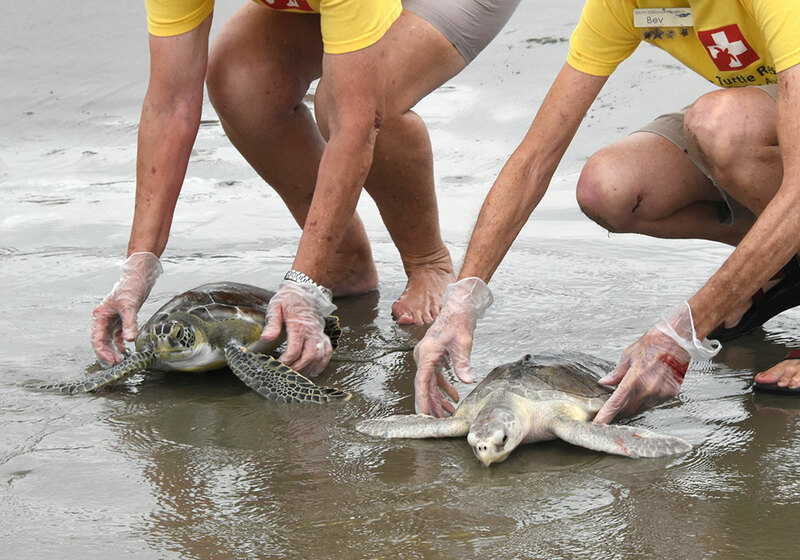 On Tuesday the Sea Turtle Hospital loaded up three small, beautiful green sea turtles and made a 5 hour drive to release these little guys in the ocean at St. Augustine, Florida. 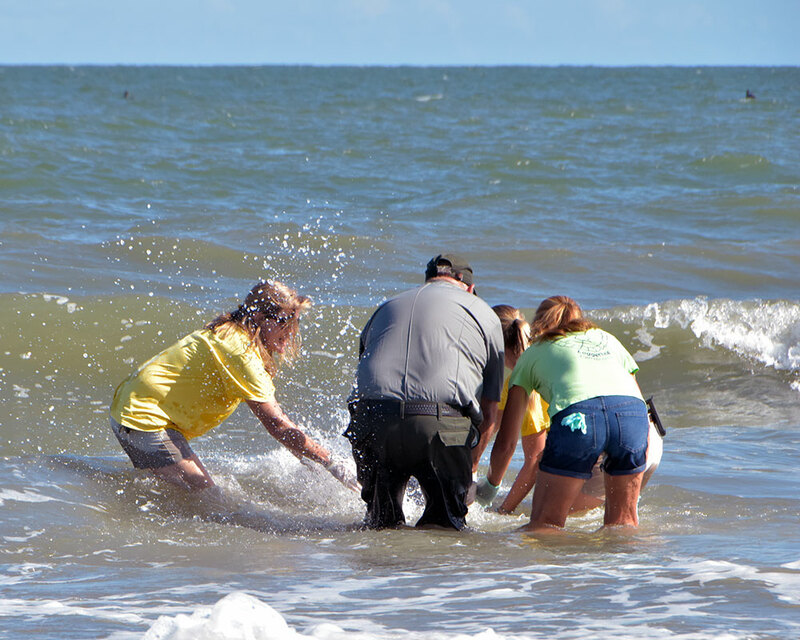 This trip was necessary because the ocean temperature in South Carolina is still too cold. 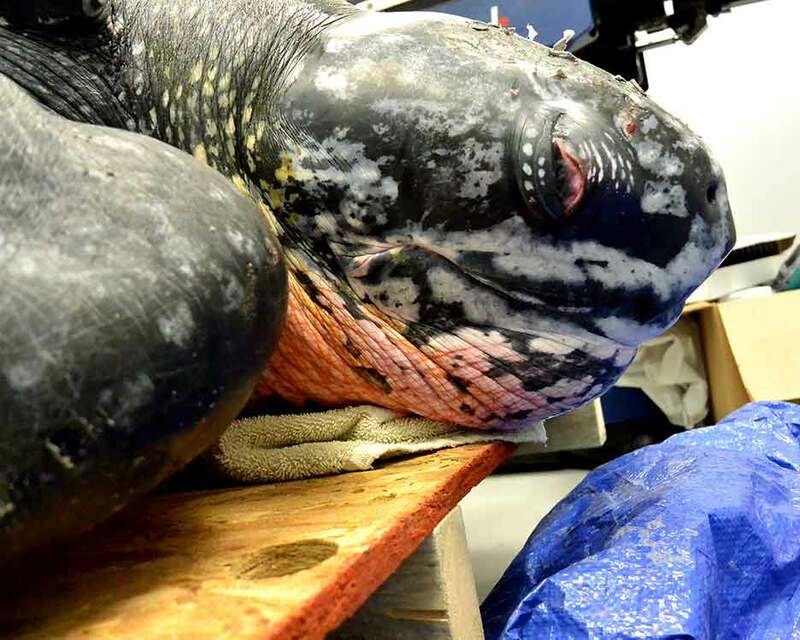 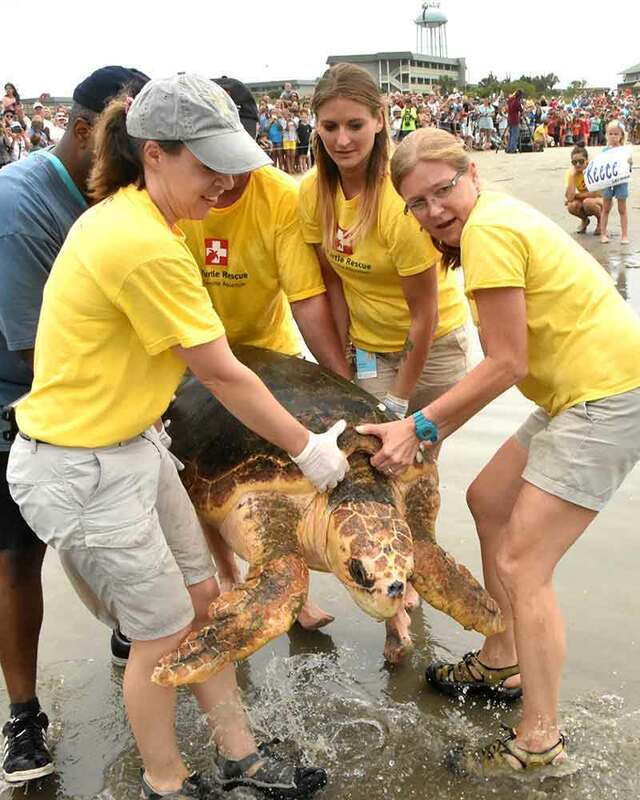 In case there is any doubt what kind of work the SC Aquarium Sea Turtle Rehabilitation Program is capable of, take a look at Moon on the day he arrived at the hospital and what he looked like on the beach at Isle of Palms. 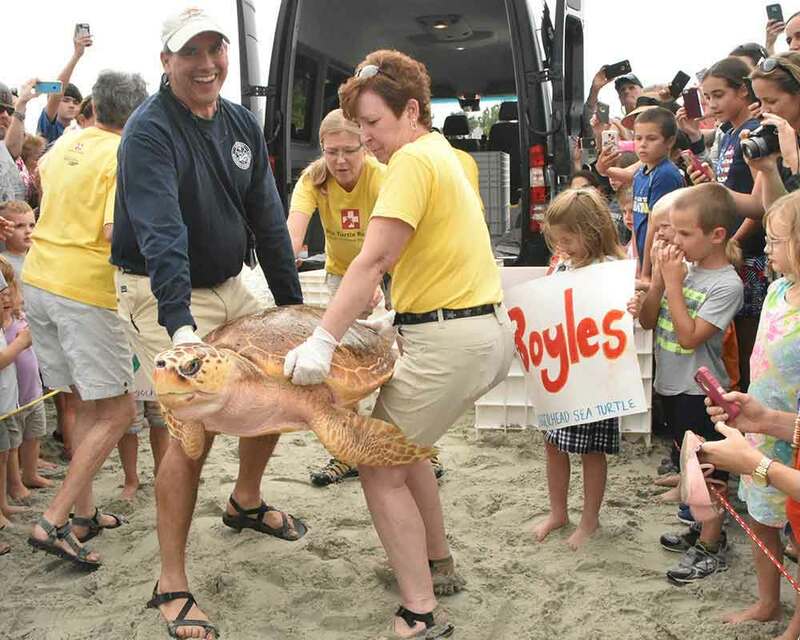 Robert Boyles and Barb Gobien get "Boyles" ready for his trip down the beach. 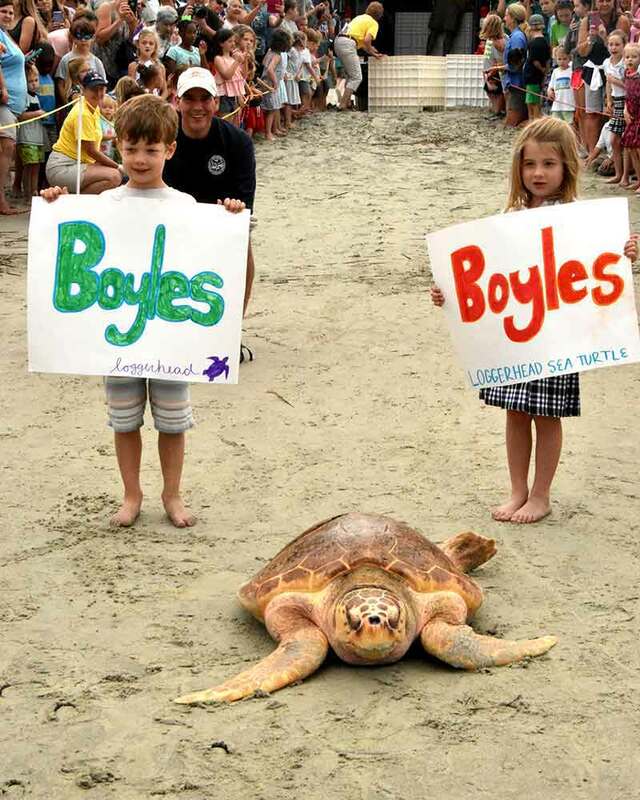 Boyles came in the middle of July 2014. 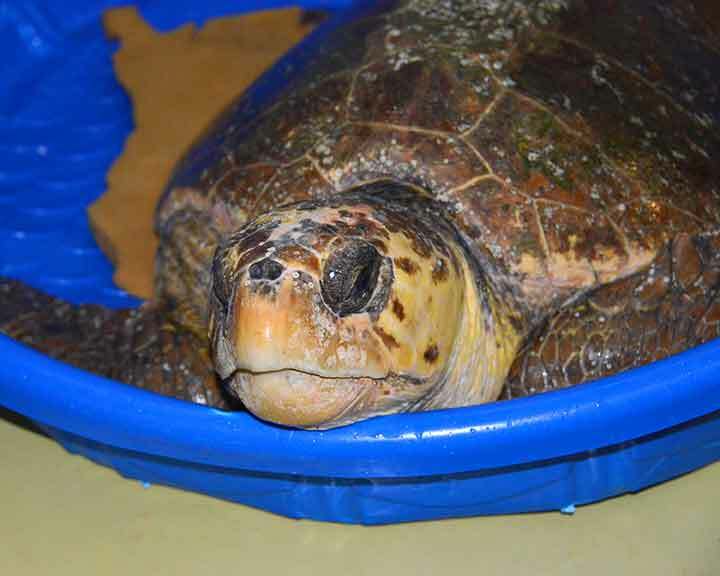 He needed cataract surgery and even after that he couldn't see well enough to see his food. 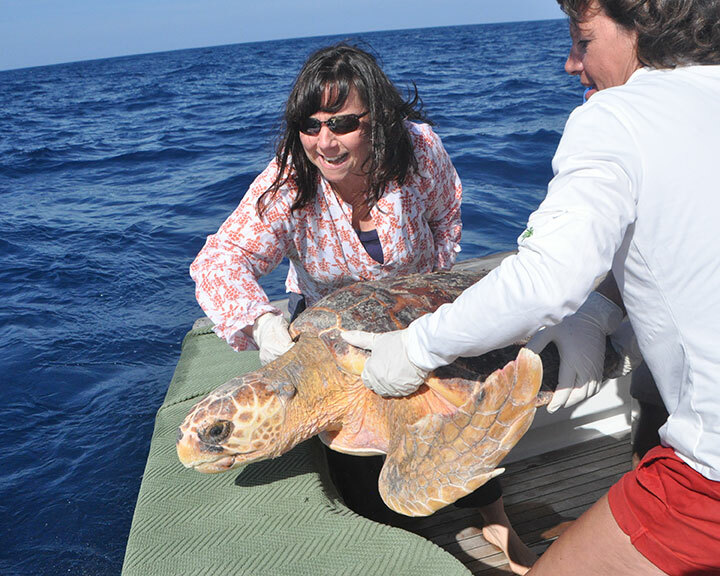 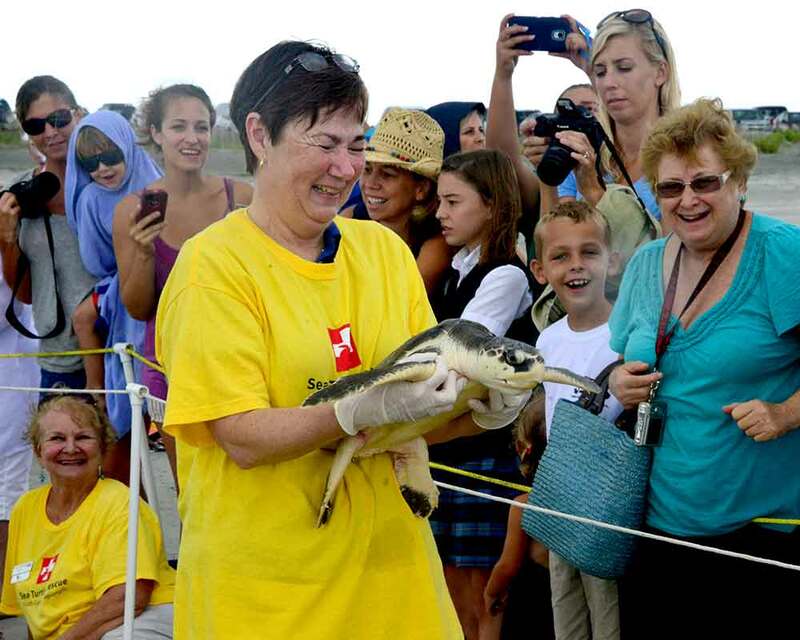 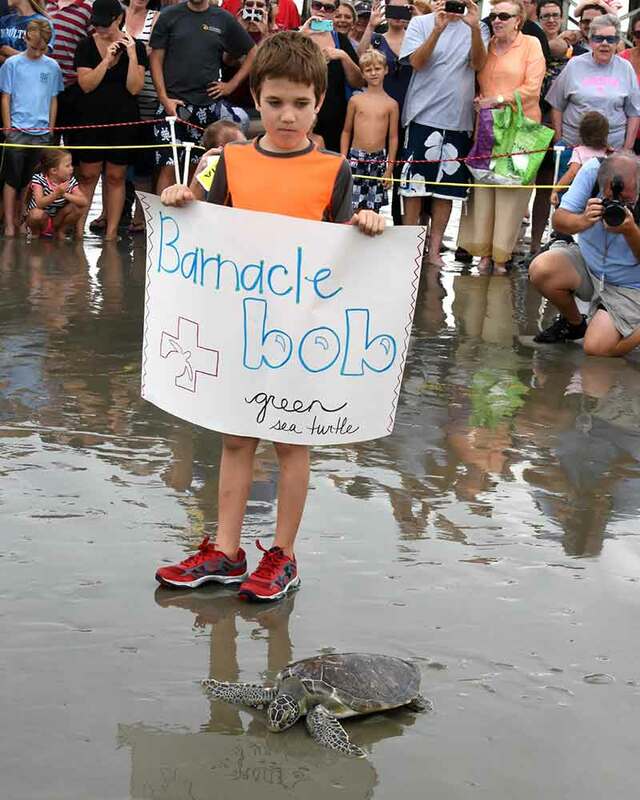 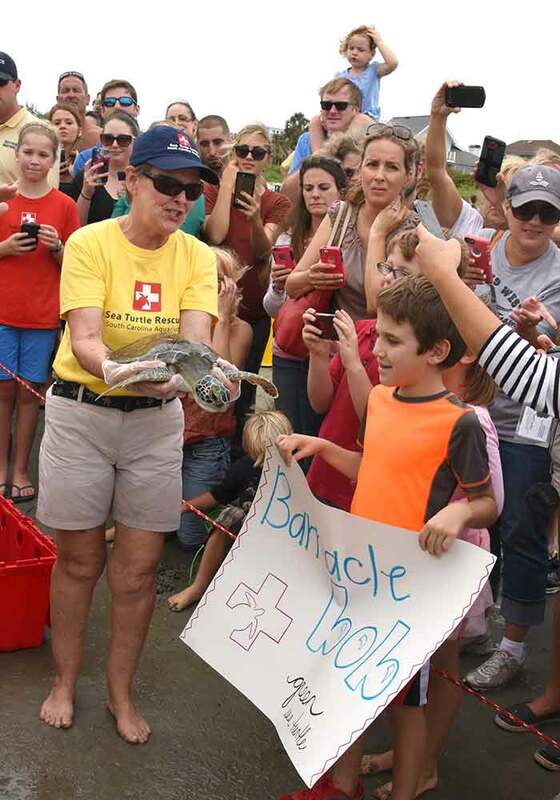 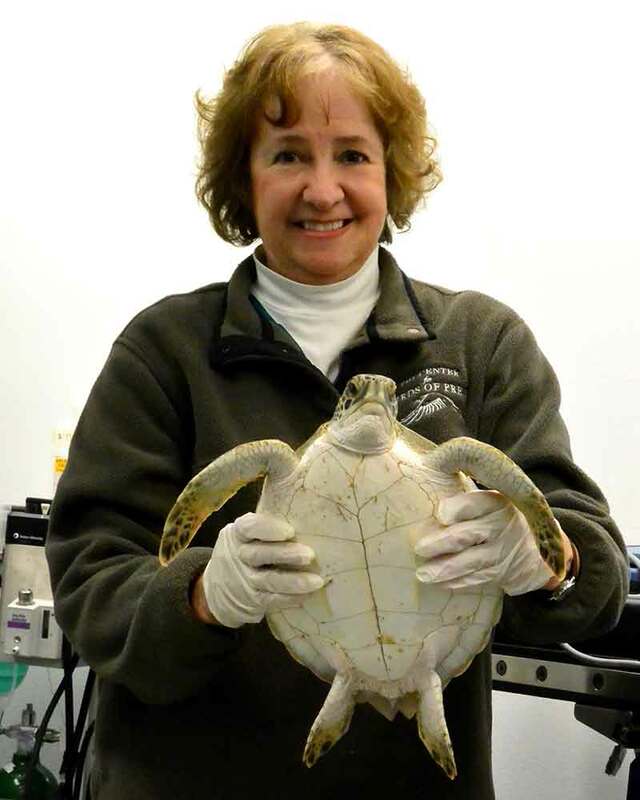 Barb Gobien, Sea Turtle Hospital Volunteer, worked for months with this turtle. 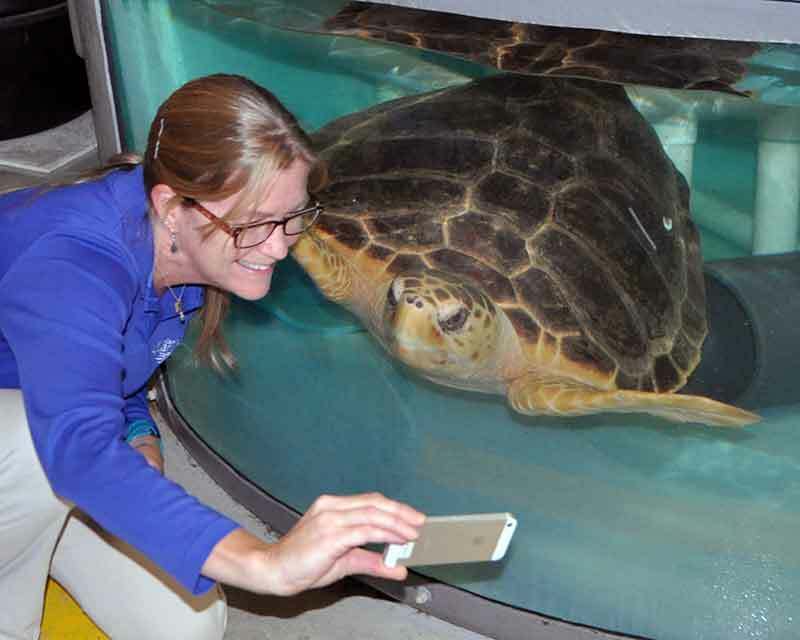 Barb came in daily to feed this turtle and her work paid off....Boyles was able to find food and chase live crabs in his tank. 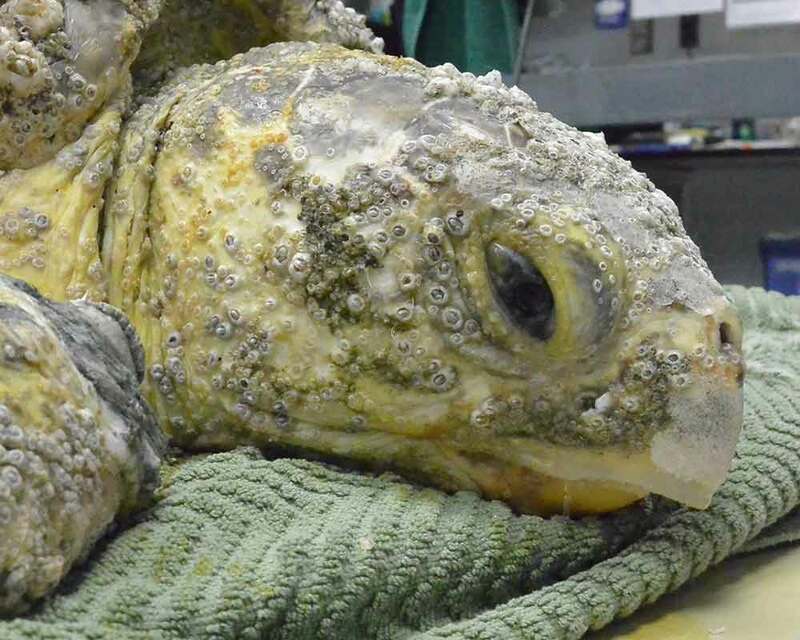 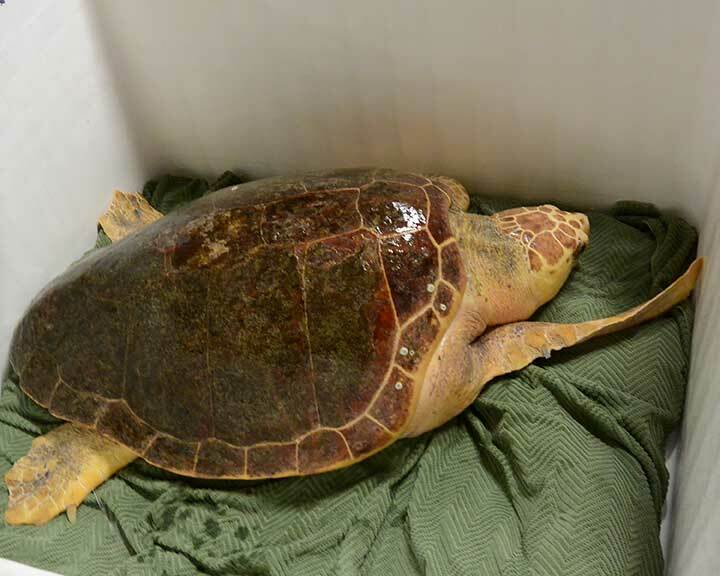 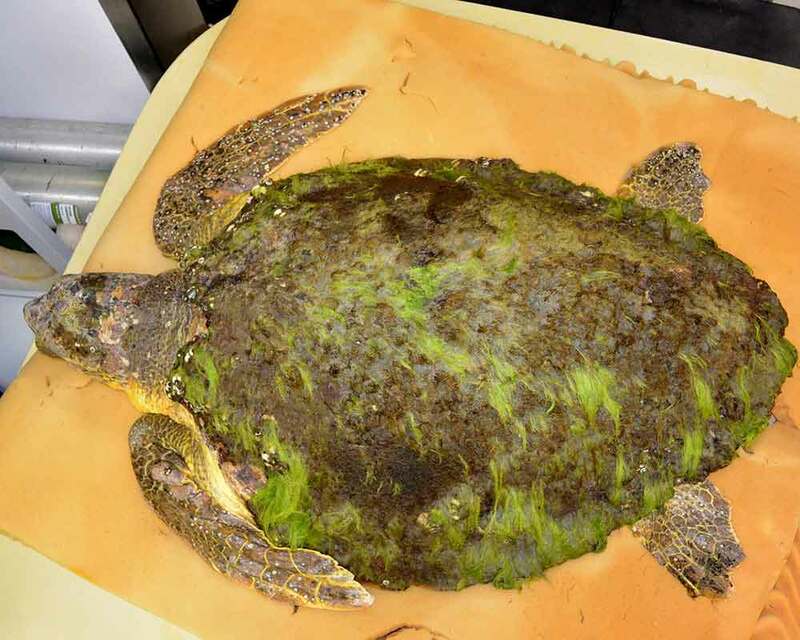 This cold-stunned loggerhead was found stranded in Brewster, Massachusetts and taken to New England Aquarium (NEAq) for treatment of hypothermia. 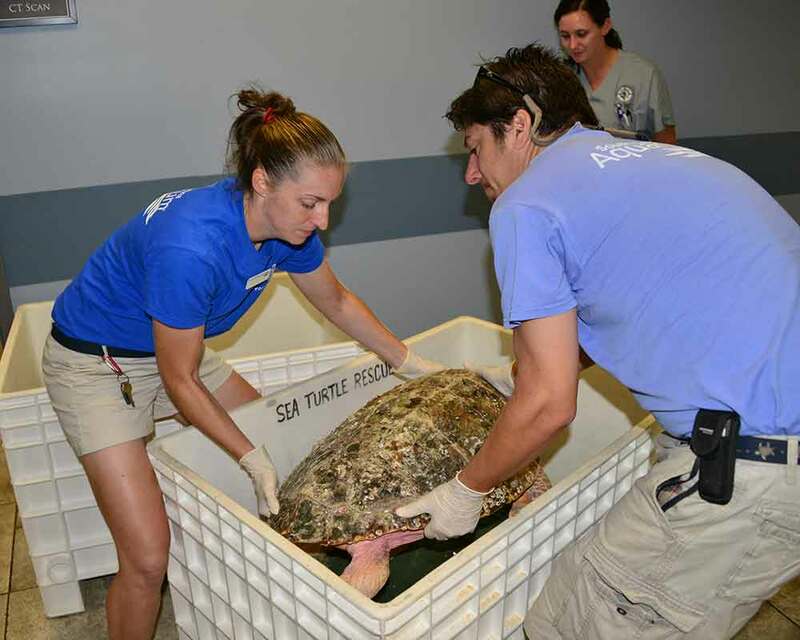 After a week of supportive care, this turtle was deemed stable enough to be transferred here to the SC Aquarium (SCA) to complete his/her rehabilitation. 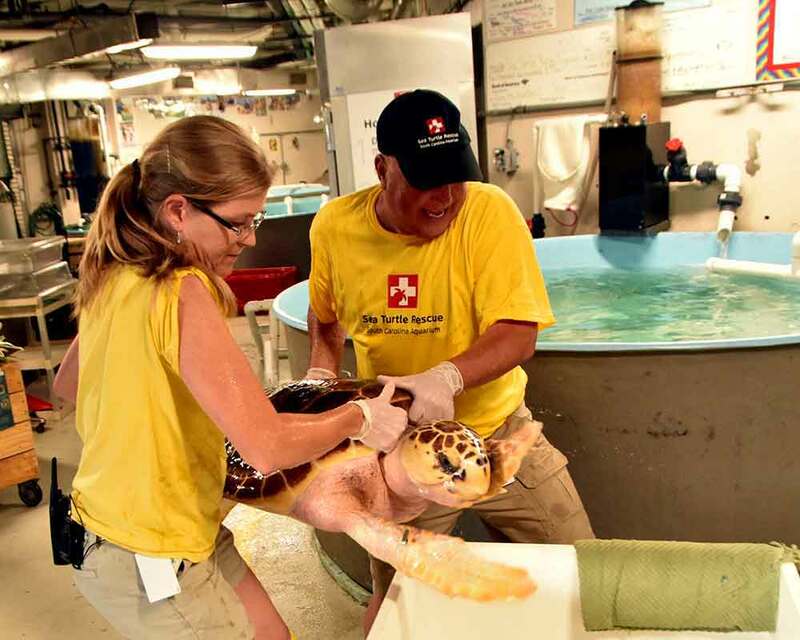 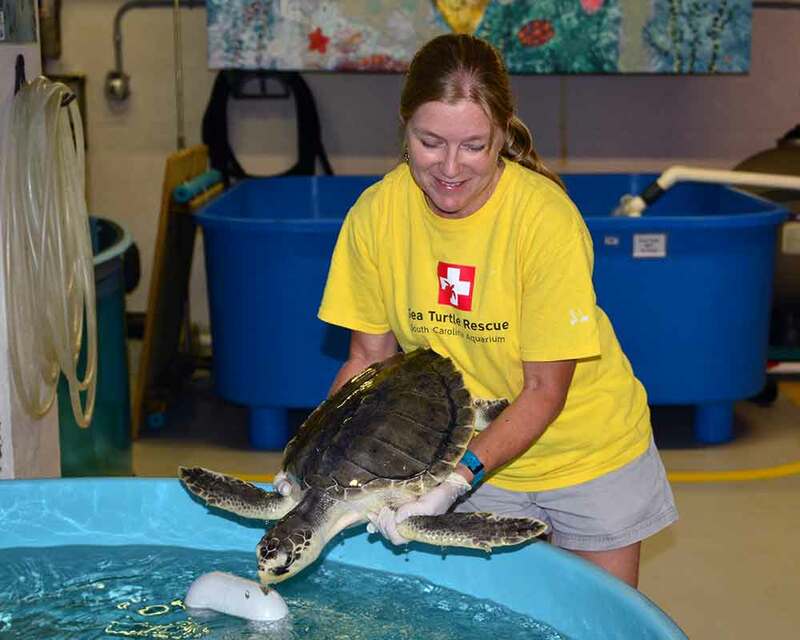 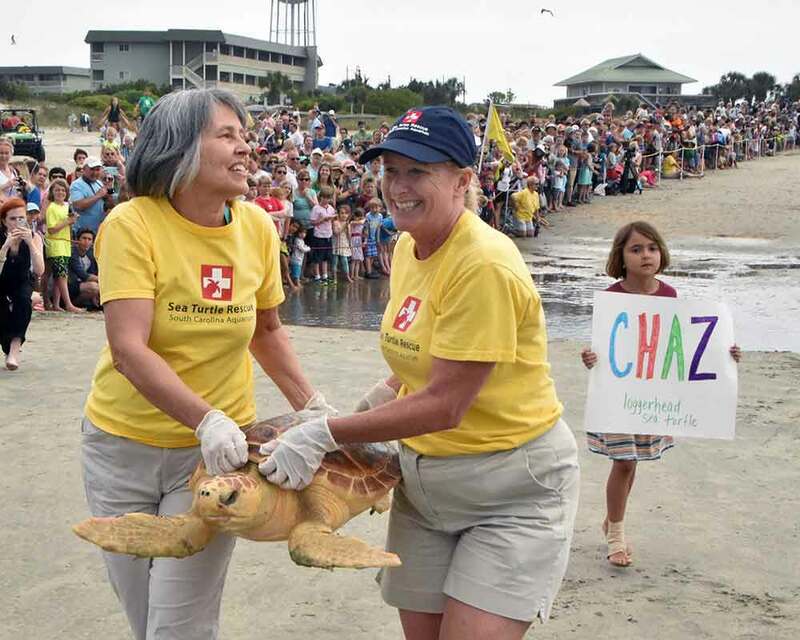 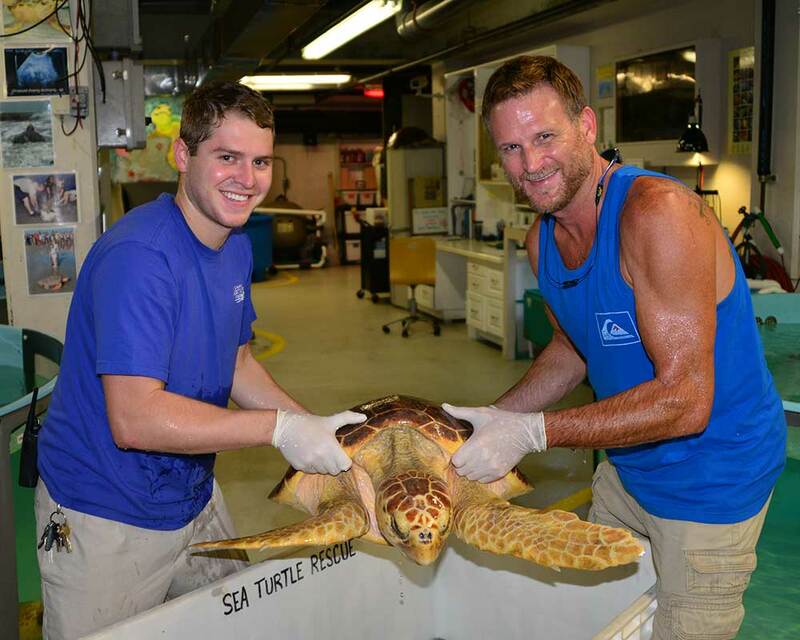 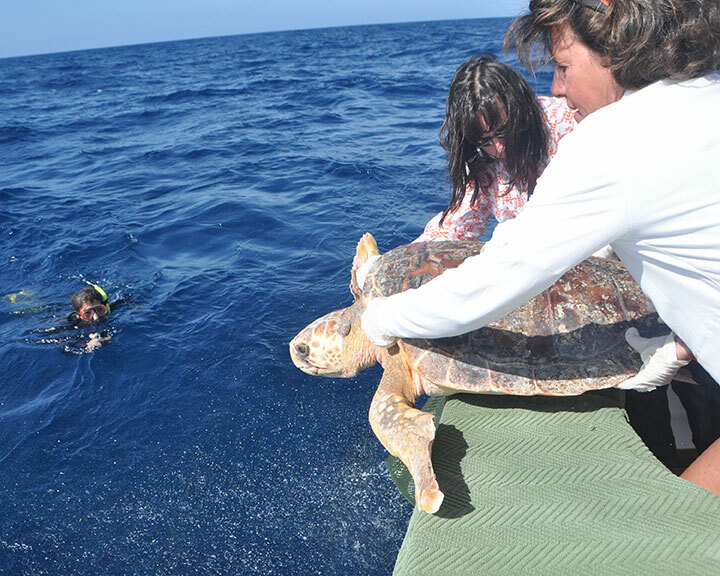 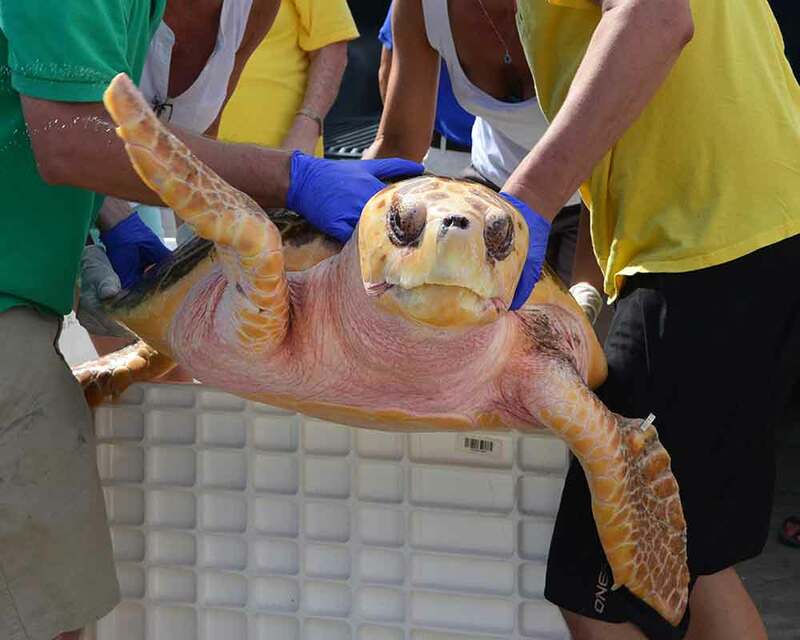 Chaz is one of five loggerheads that was transported to South Carolina via a charter flight, generously donated by Worcester Airport. 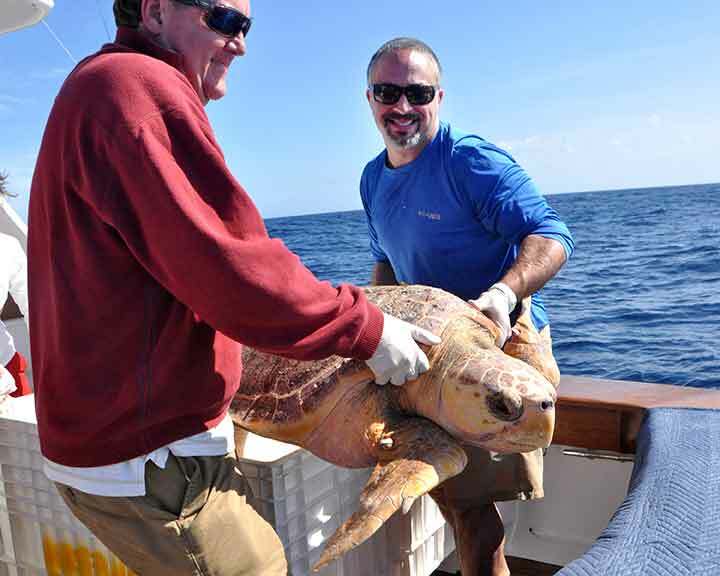 This small juvenile loggerhead was incidentally caught in a trawl net in the Charleston Harbor and brought on board an education vessel operated by the SCDNR, the E/V Discovery. 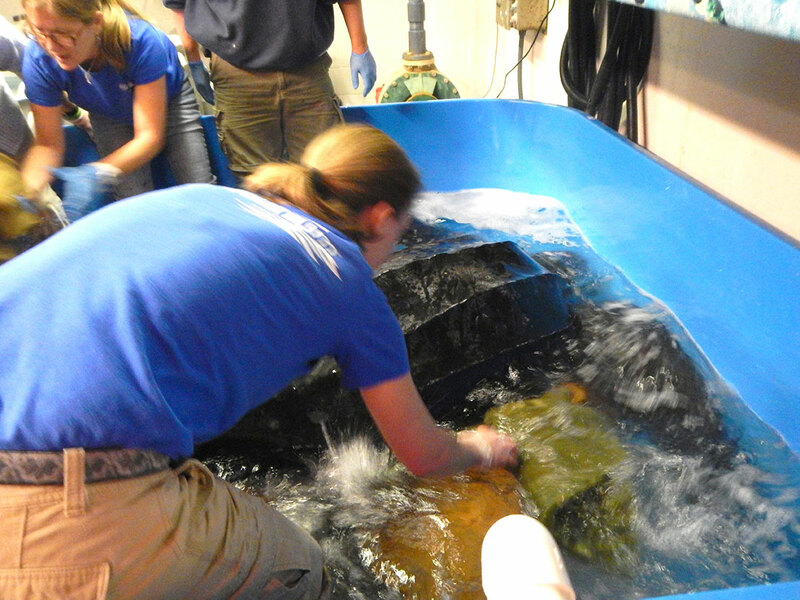 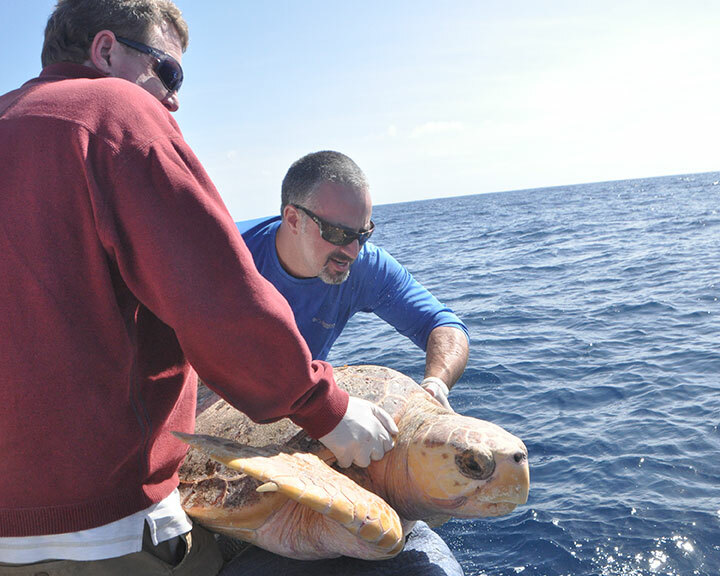 Once onboard, Discovery biologists took one look at this sub adult loggerhead and immediately knew something was wrong. 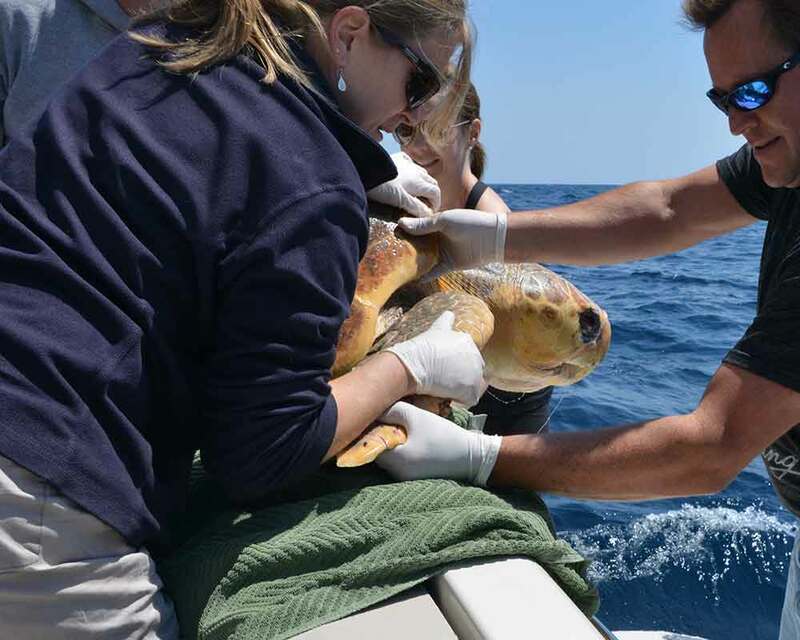 The loggerhead we’ve named Discovery was thin, lethargic, and had old wounds to the marginal scutes (the sides of the shell). 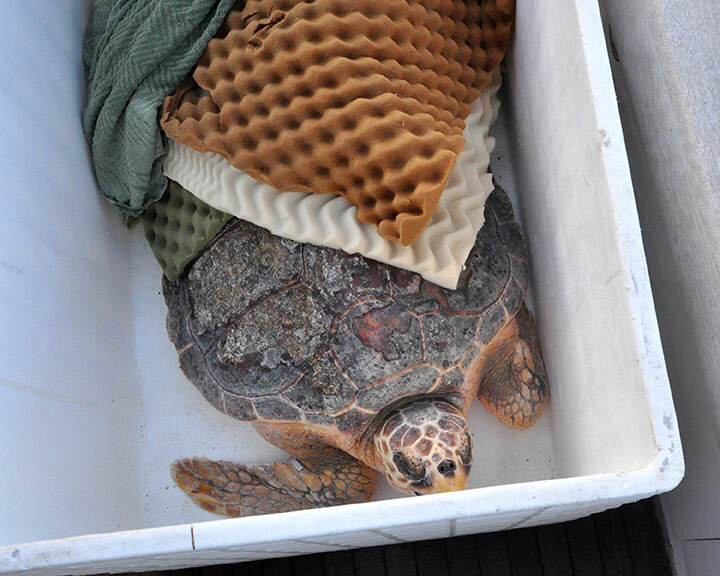 These concerns warranted transporting this turtle from SCDNR’s nearby boat landing to our sea turtle hospital. 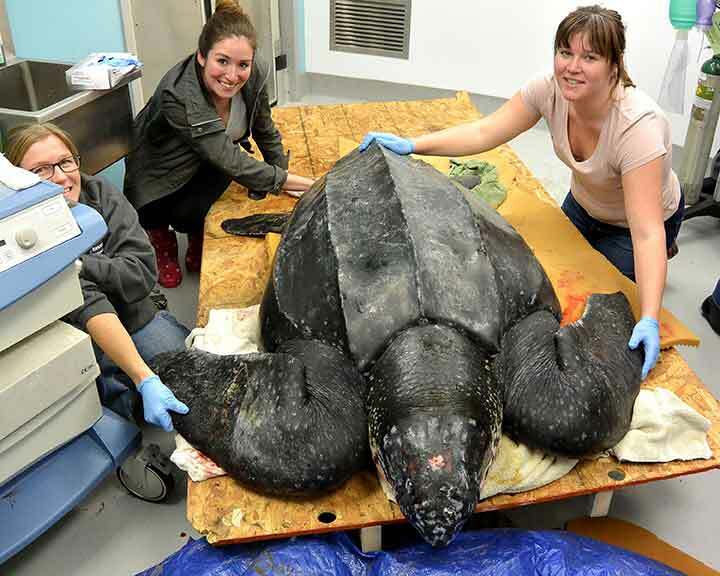 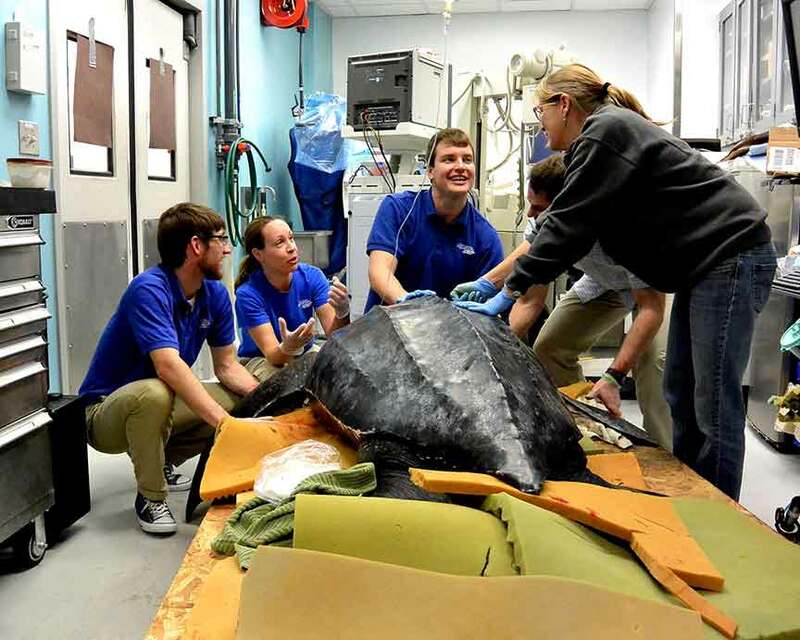 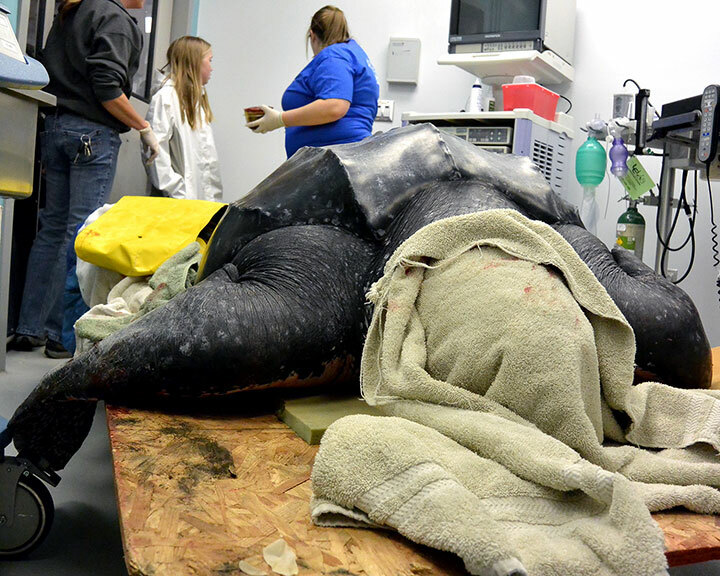 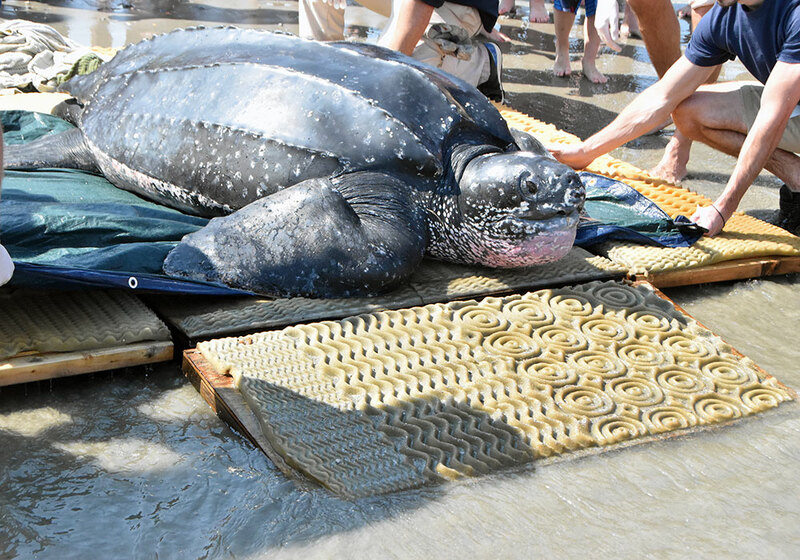 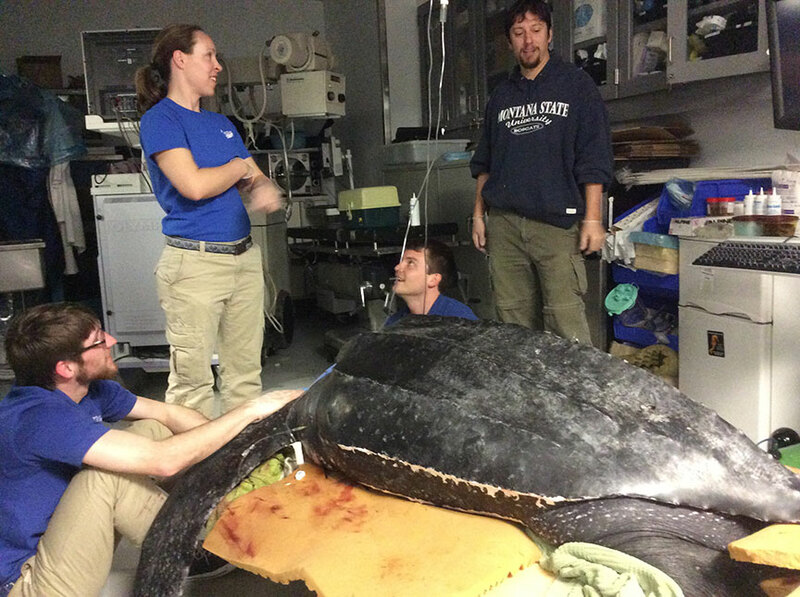 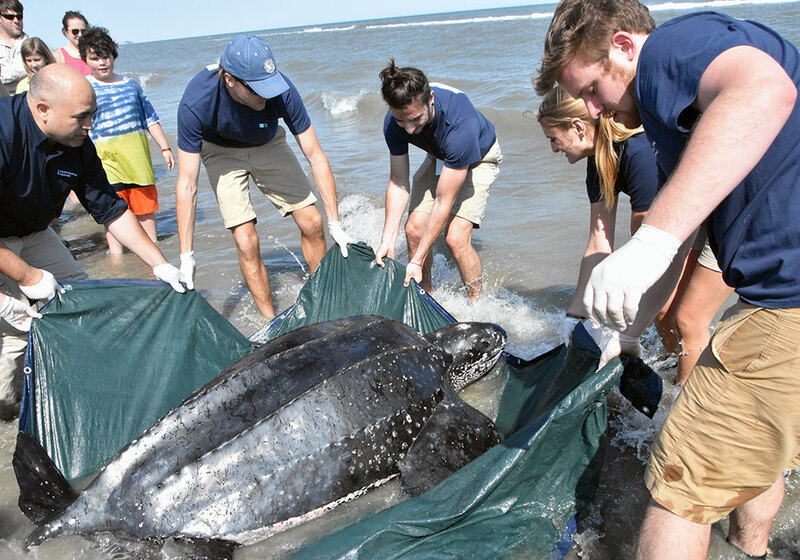 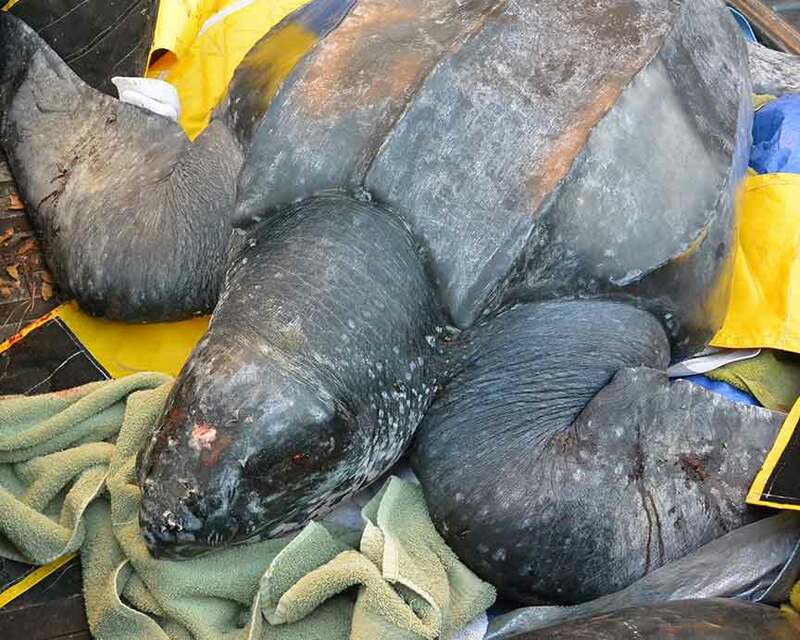 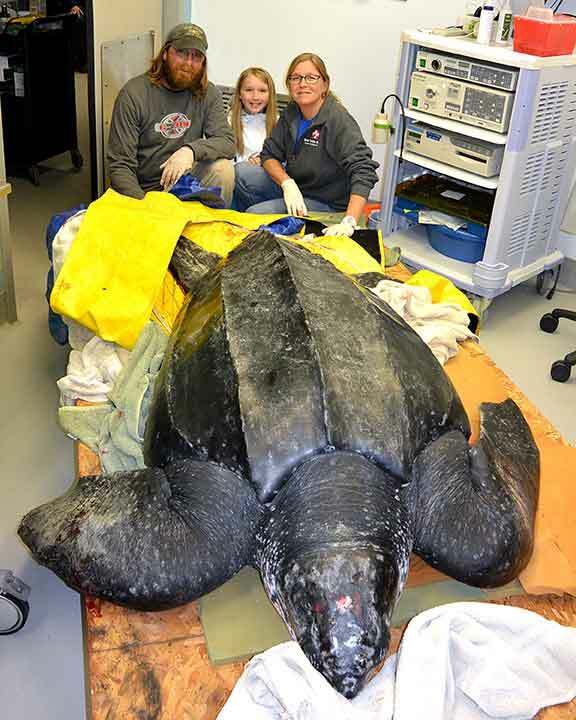 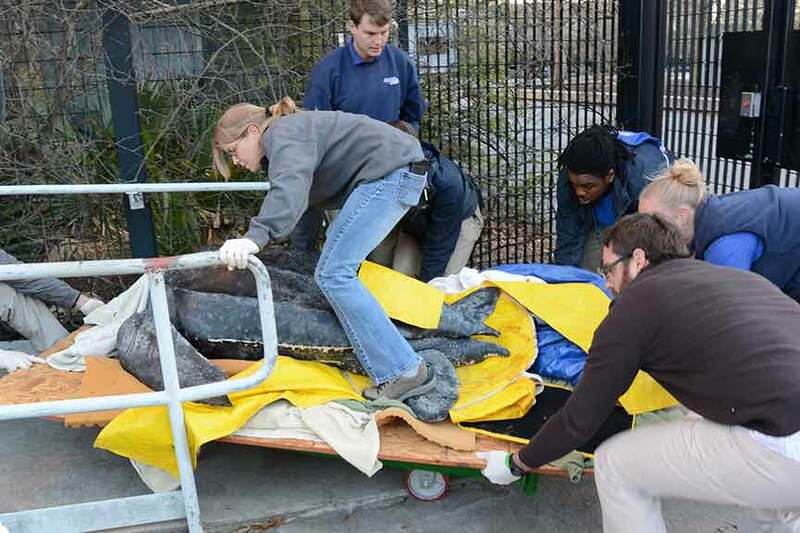 The DNR delivered a stranded Leatherback to the SC Aquarium Sea Turtle Hospital Friday afternoon. 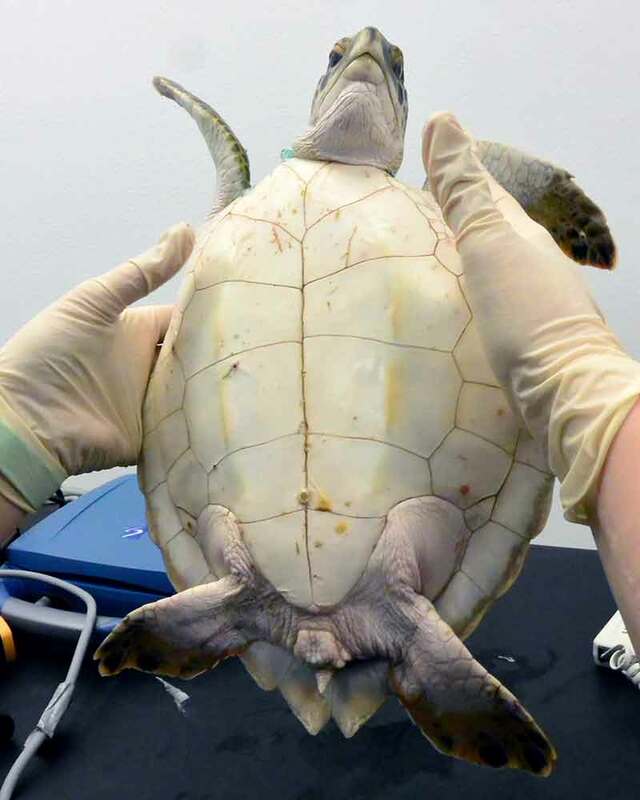 This turtle had no obvious injuries and after a check up, fluids, vitamins, antibiotics, and a blood test, it was decided the best thing for this animal was to get him/her back in the ocean. 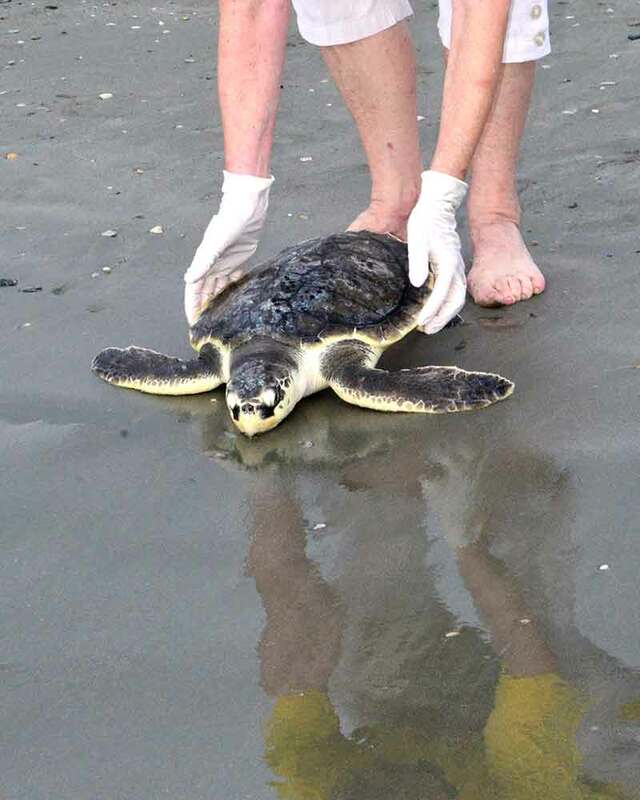 So this afternoon, after a huge effort to organize a release by the DNR and the SC Aquarium with the help of the County Park on Folly....Mariner was returned to the ocean. 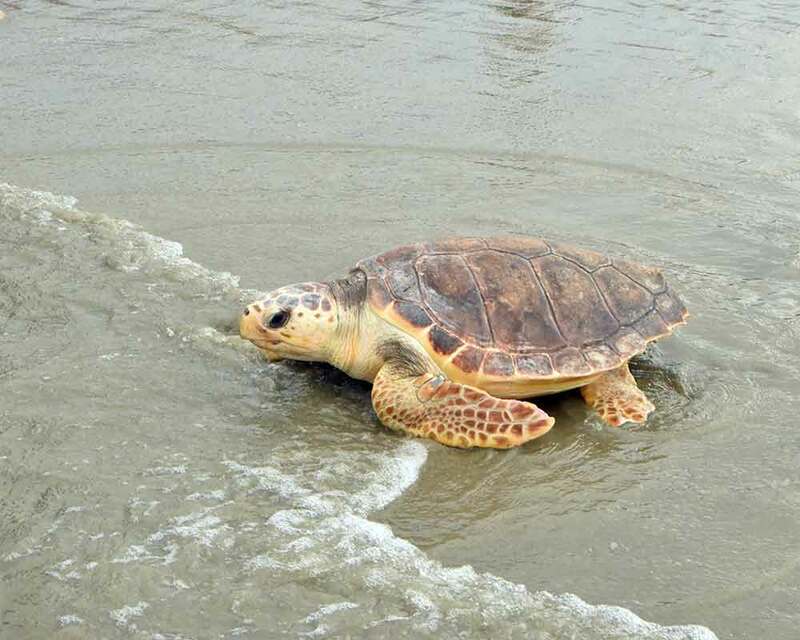 Belton came in from Hilton Head last June. 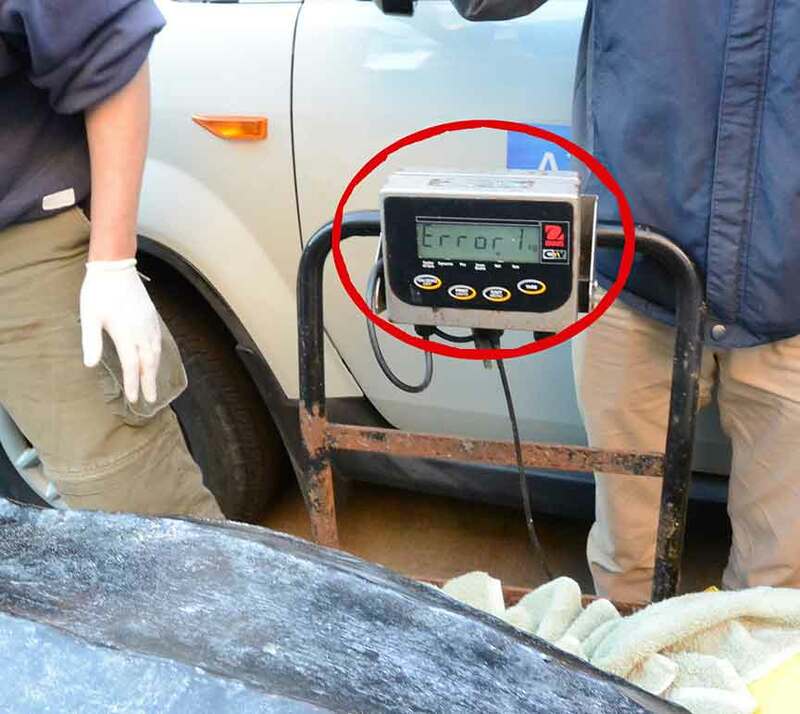 The right flipper was severely damaged. 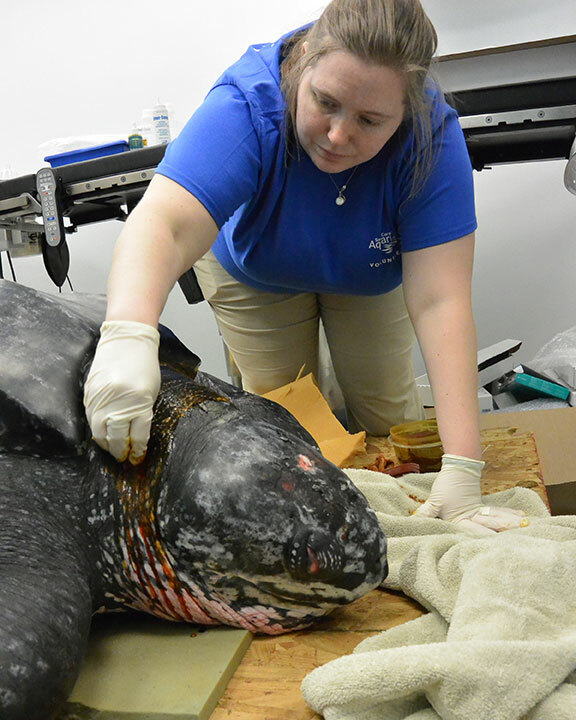 While most of the damaged flipper has disappeared Belton has fully regained his health and can function even without a complete front flipper on the right side. 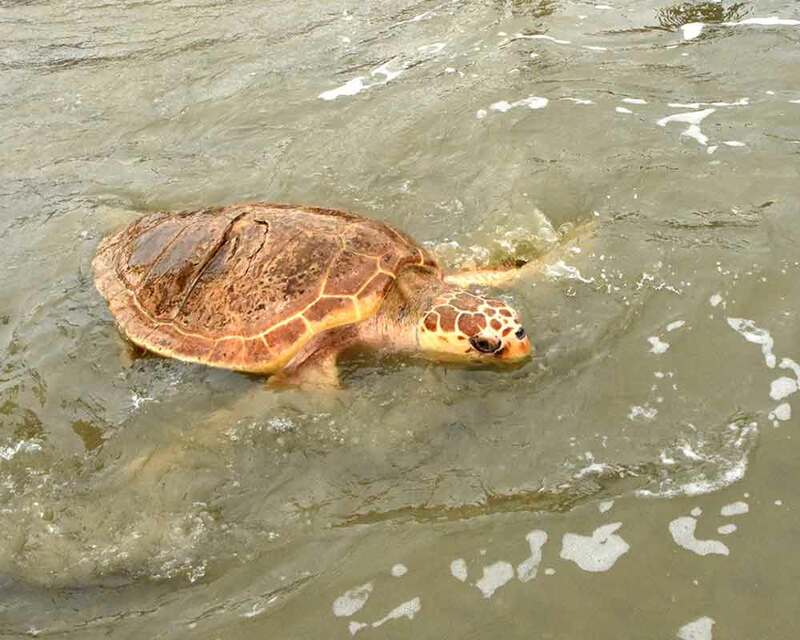 He quickly made his way off the beach in Florida. 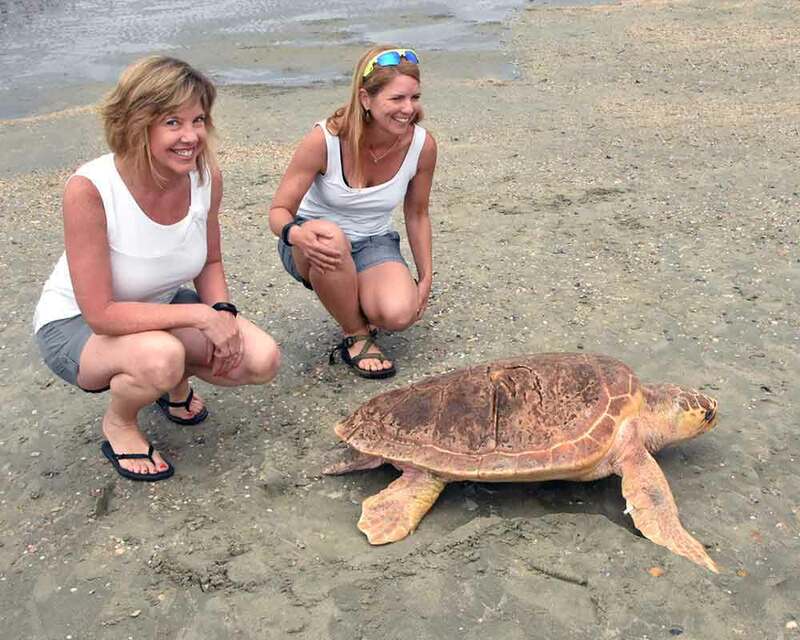 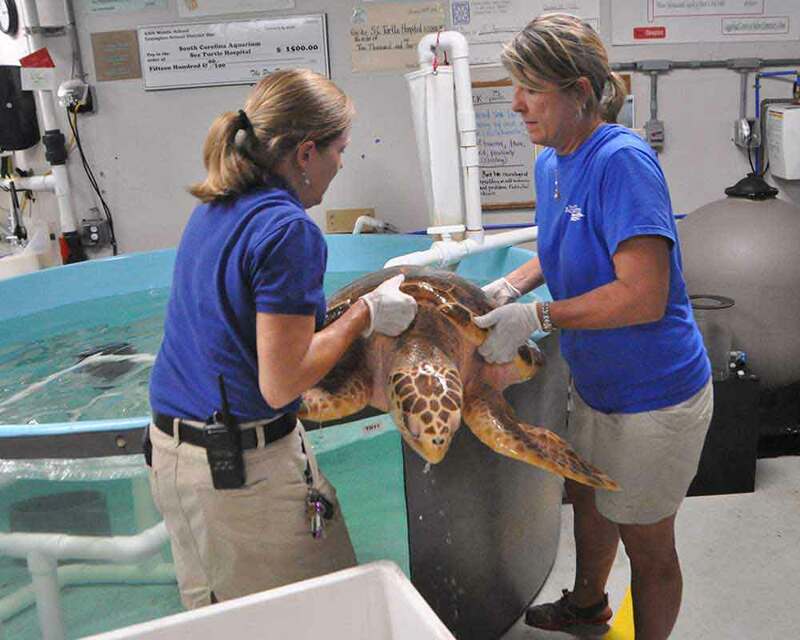 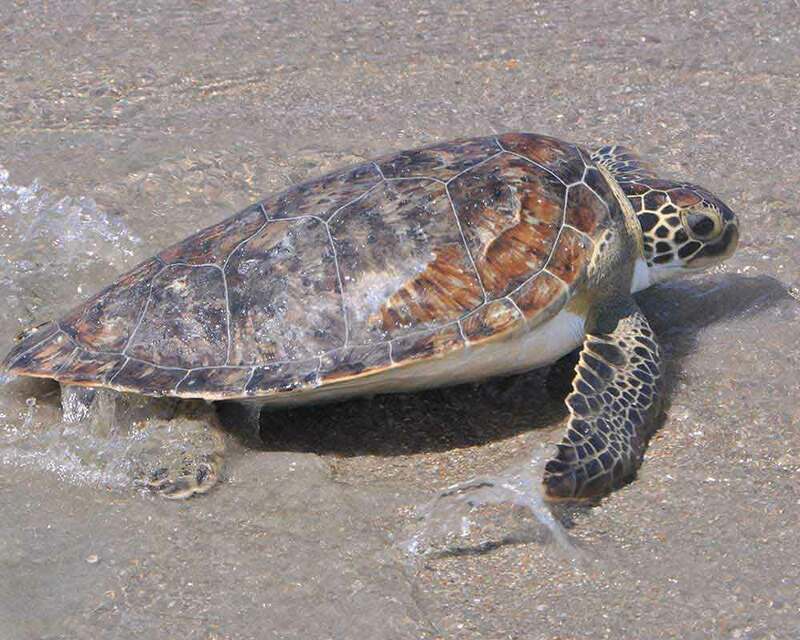 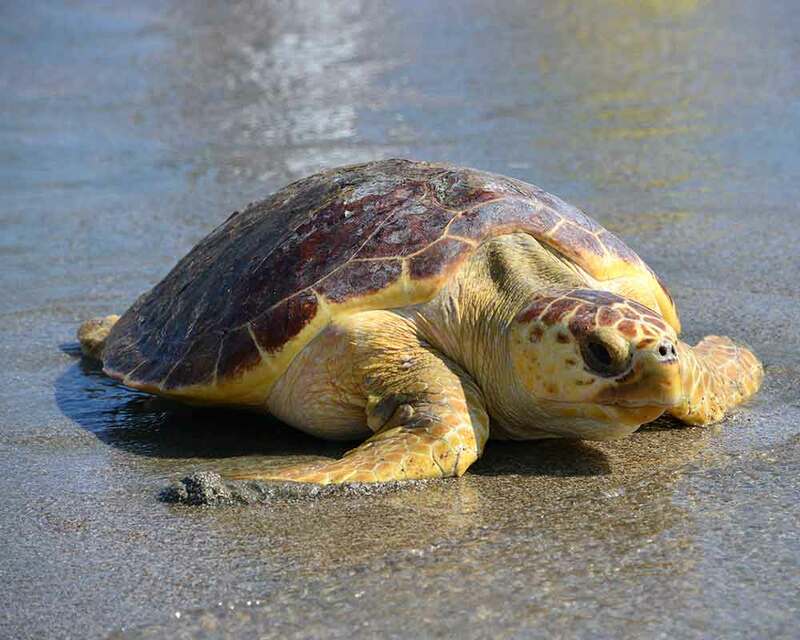 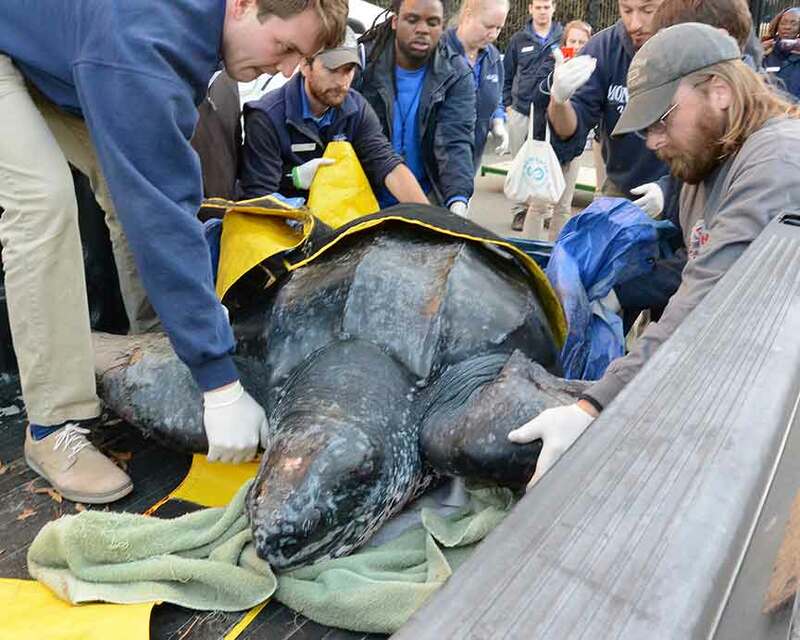 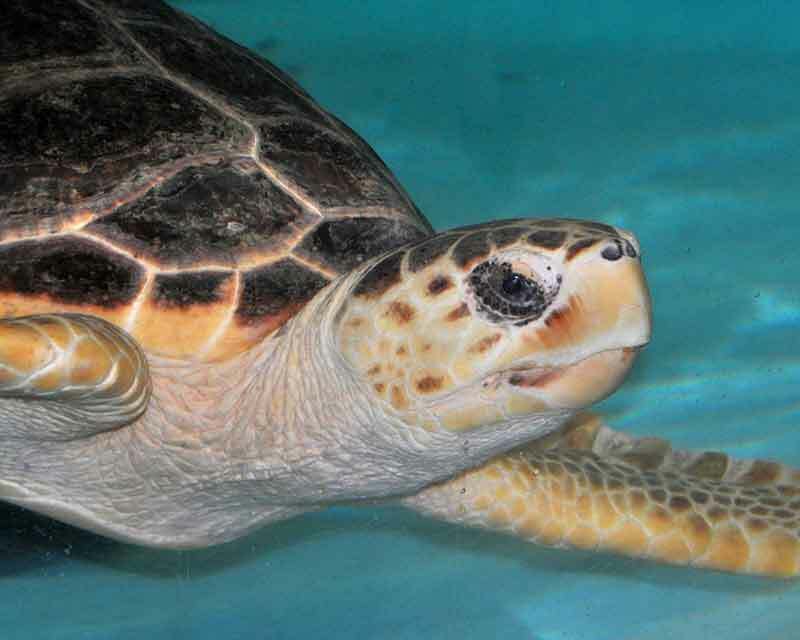 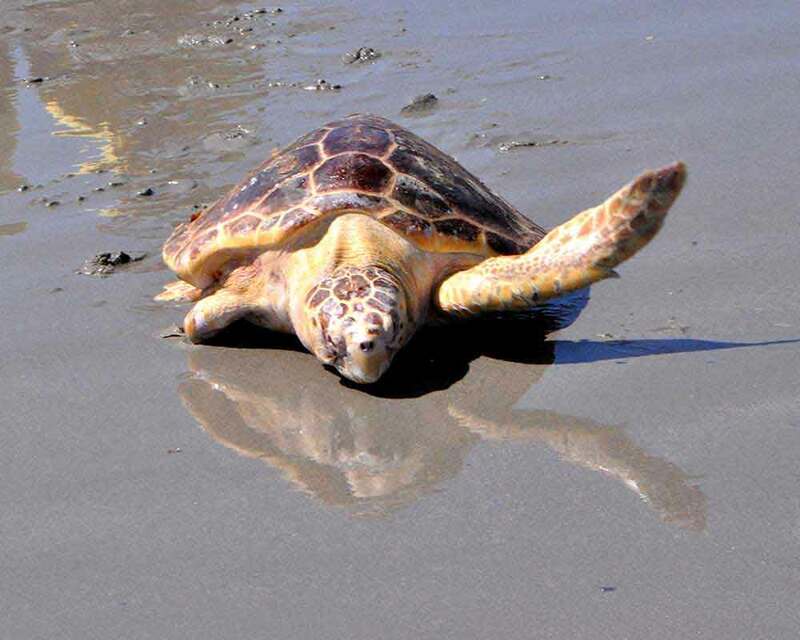 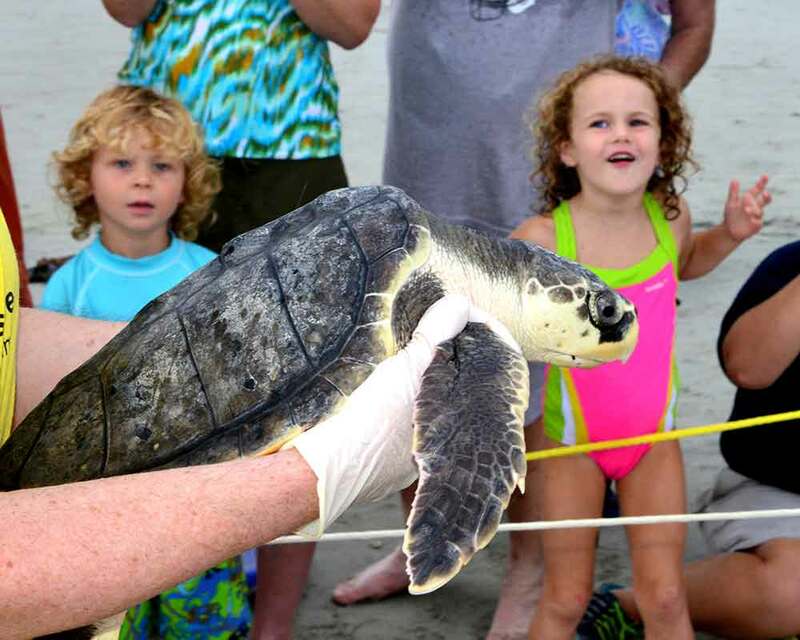 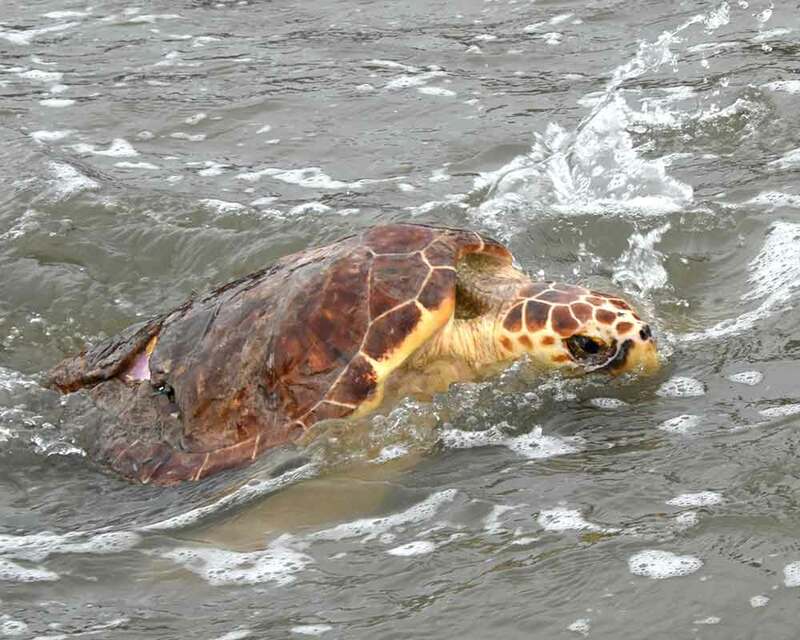 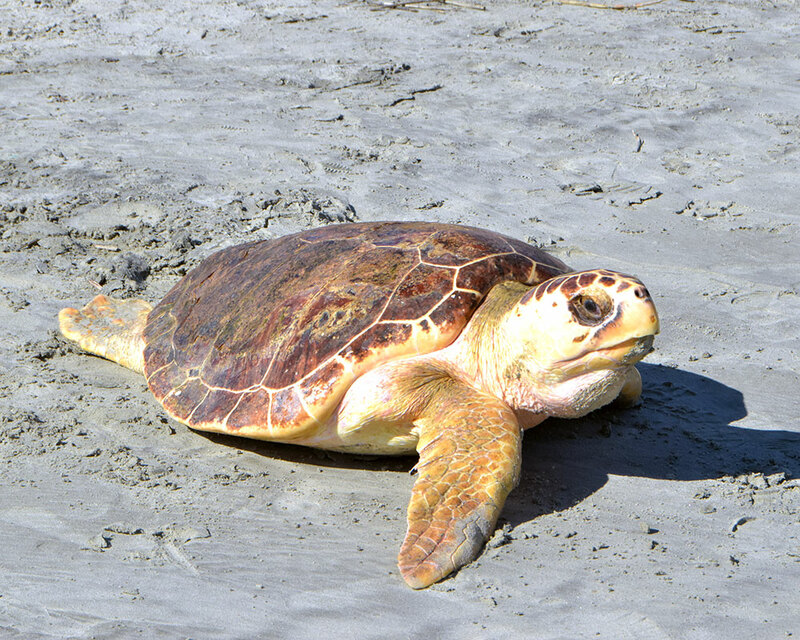 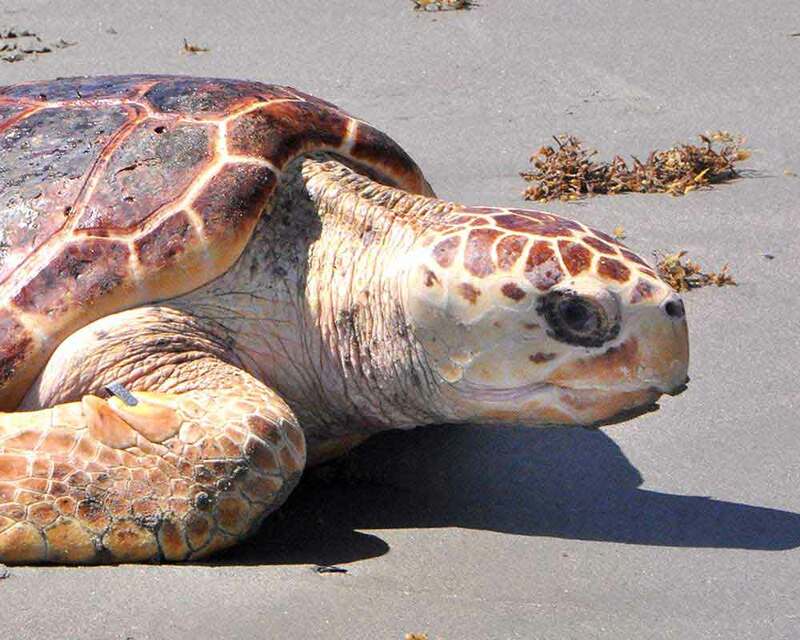 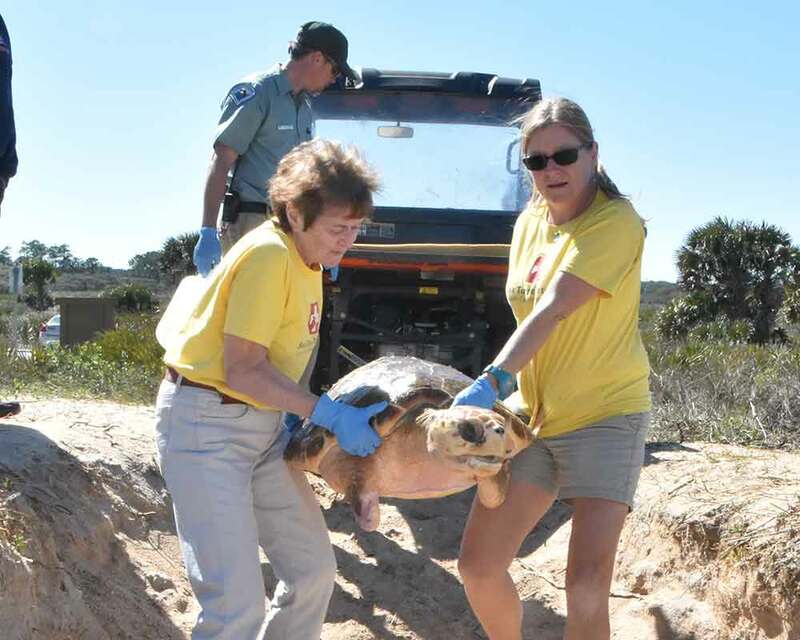 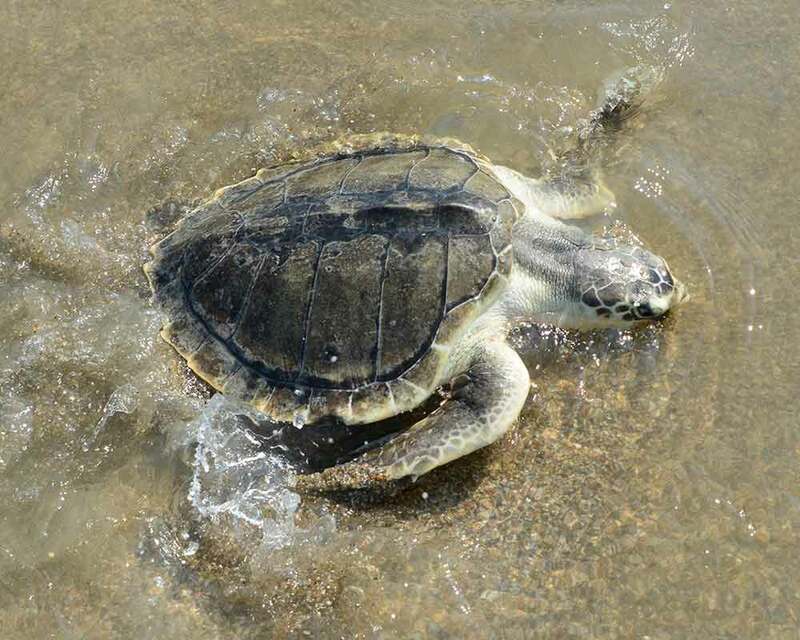 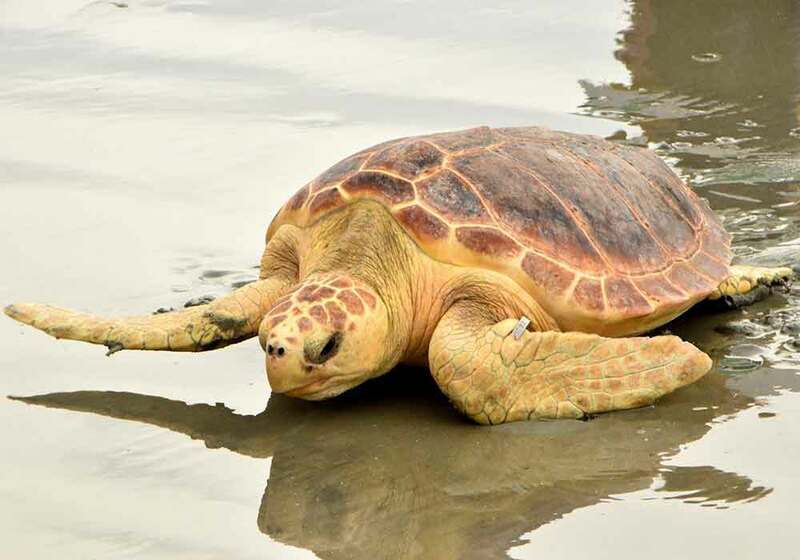 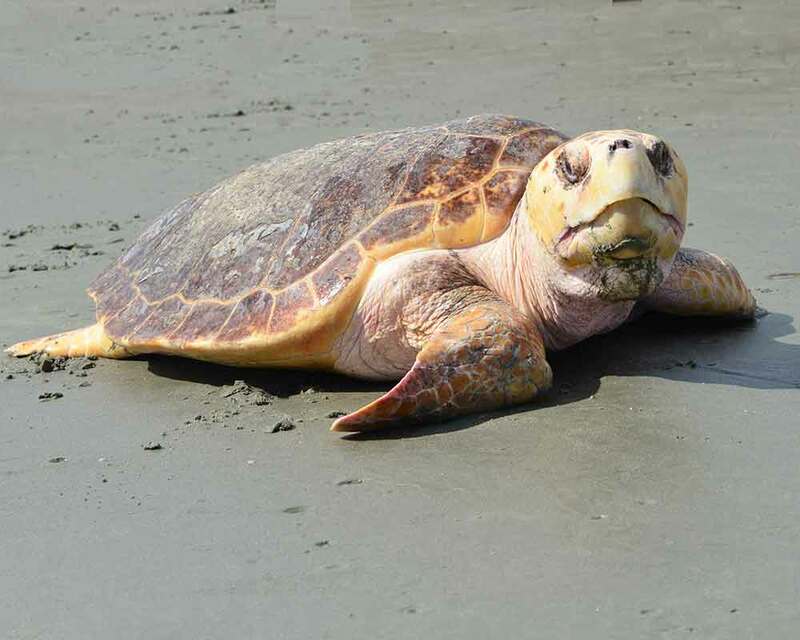 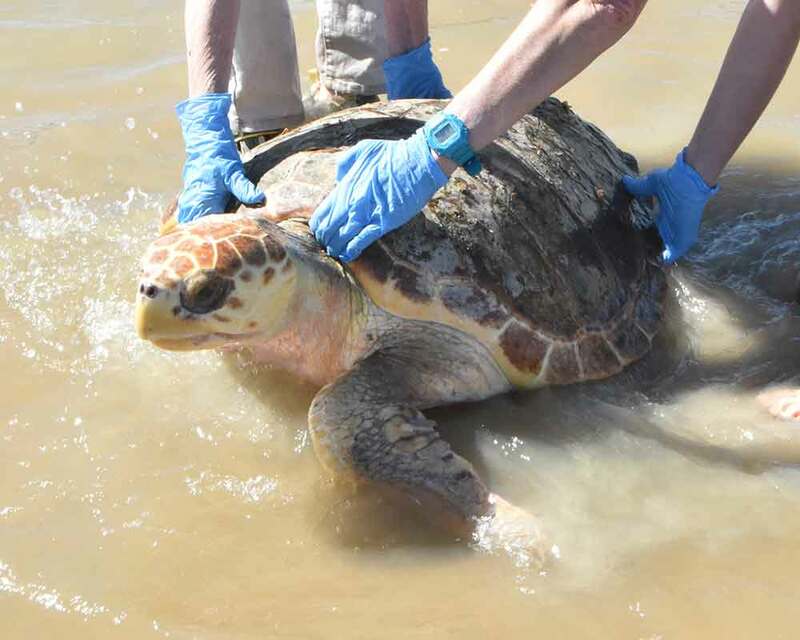 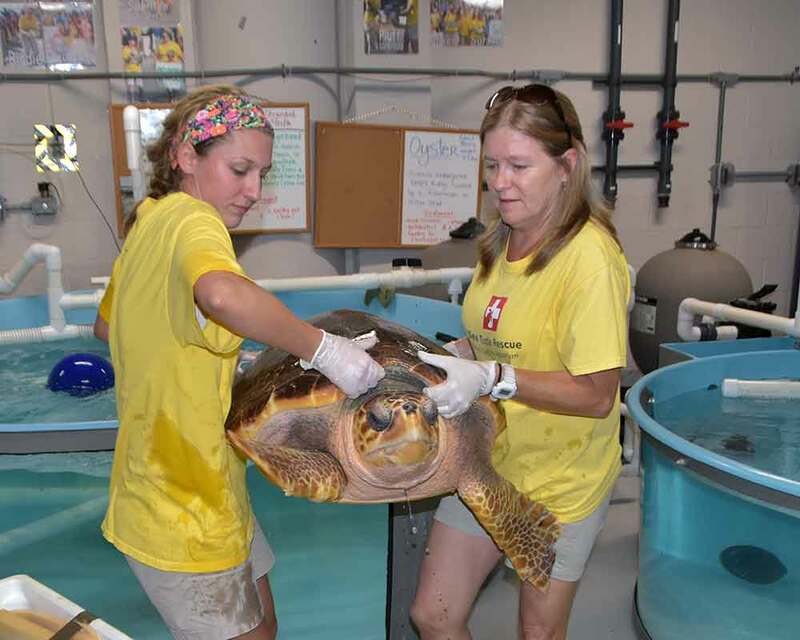 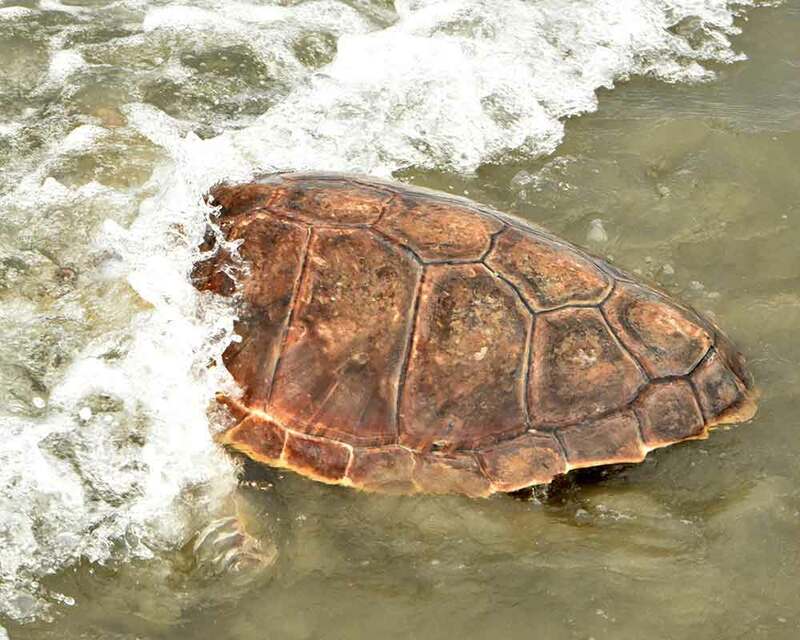 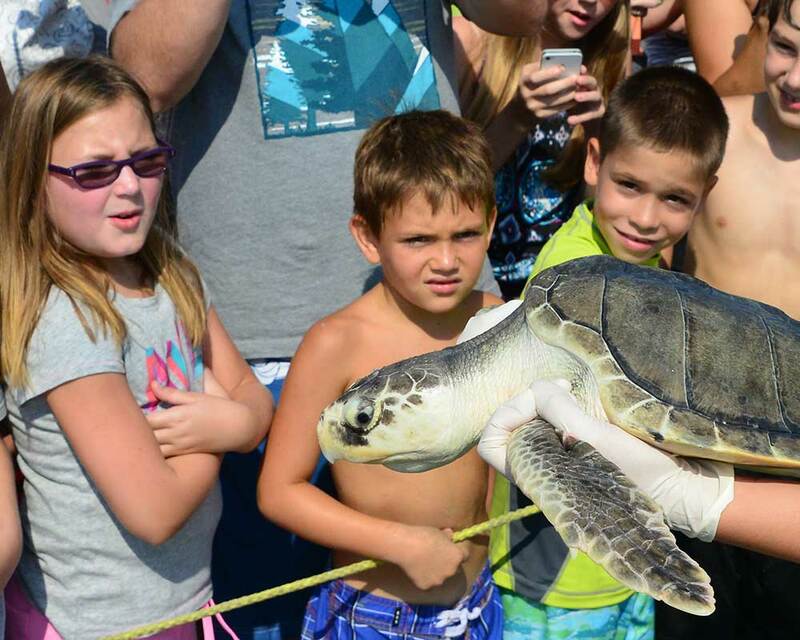 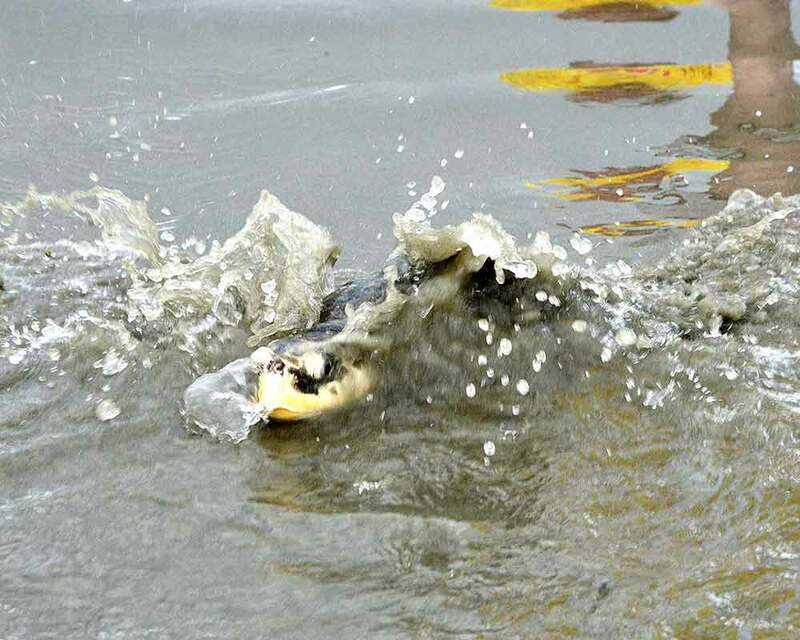 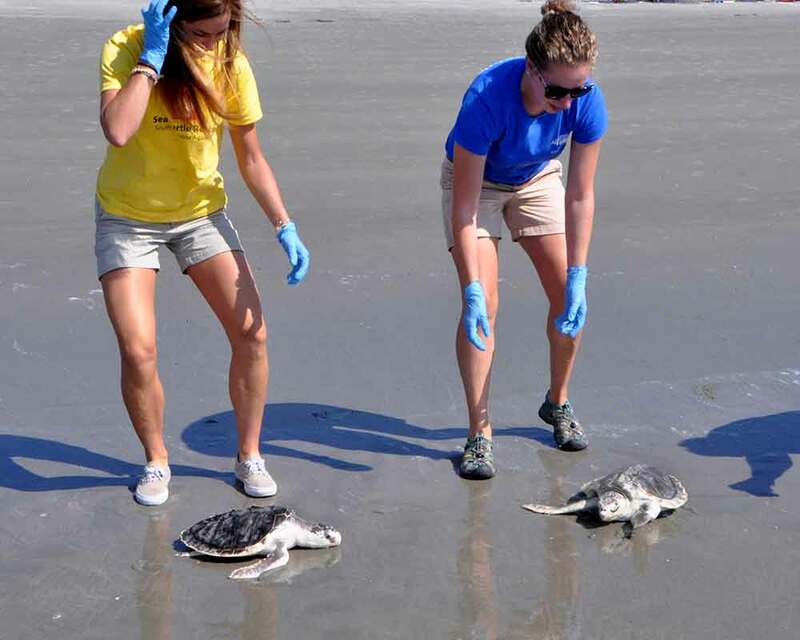 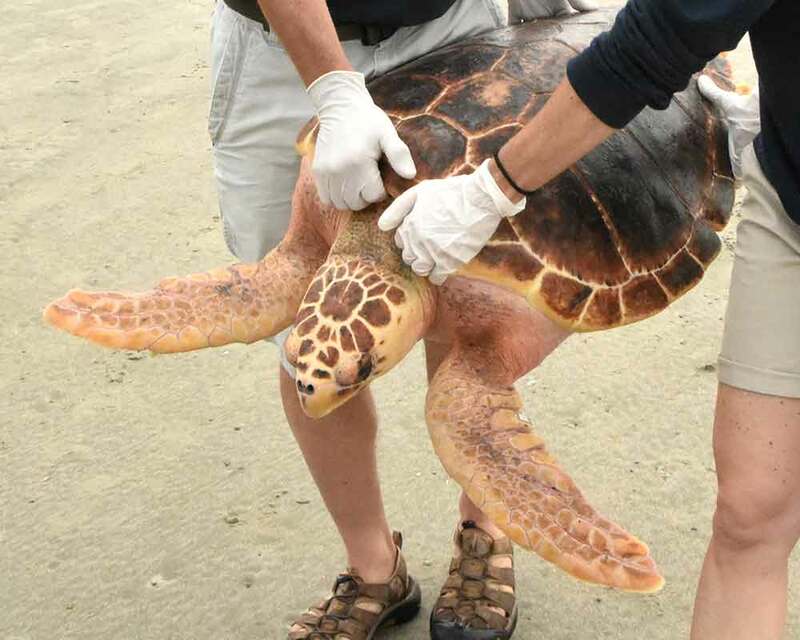 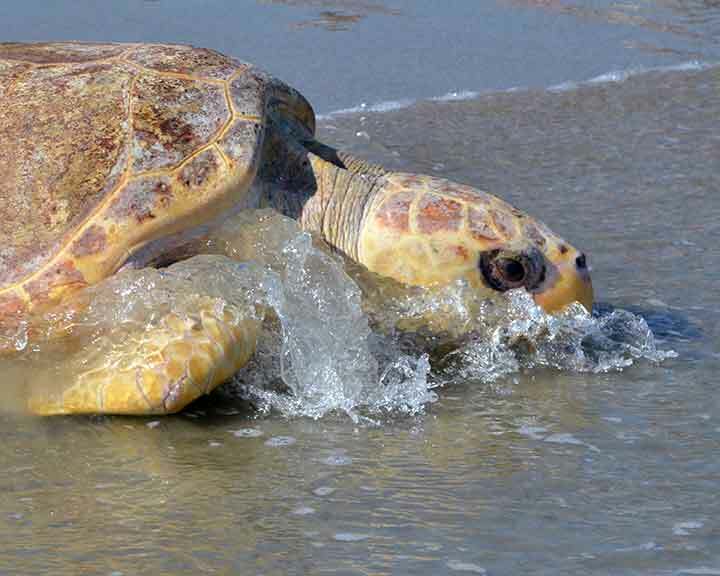 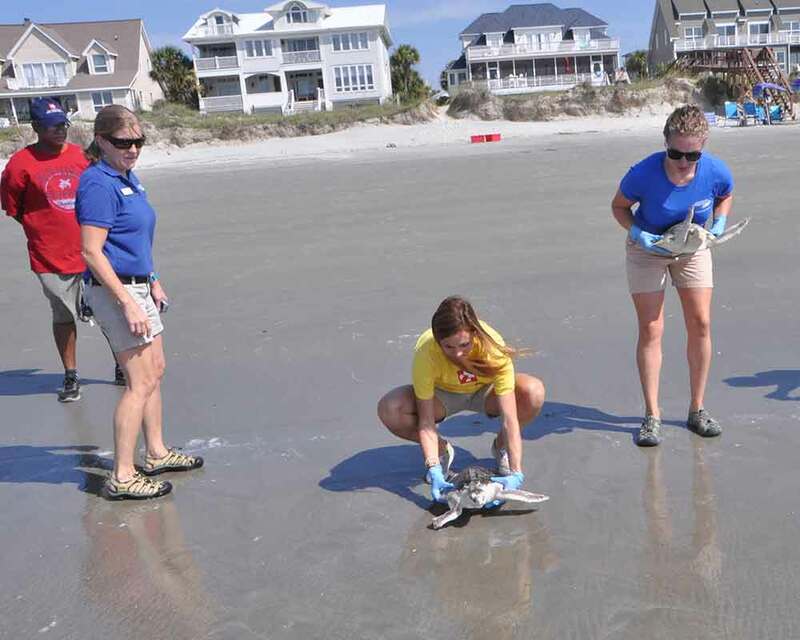 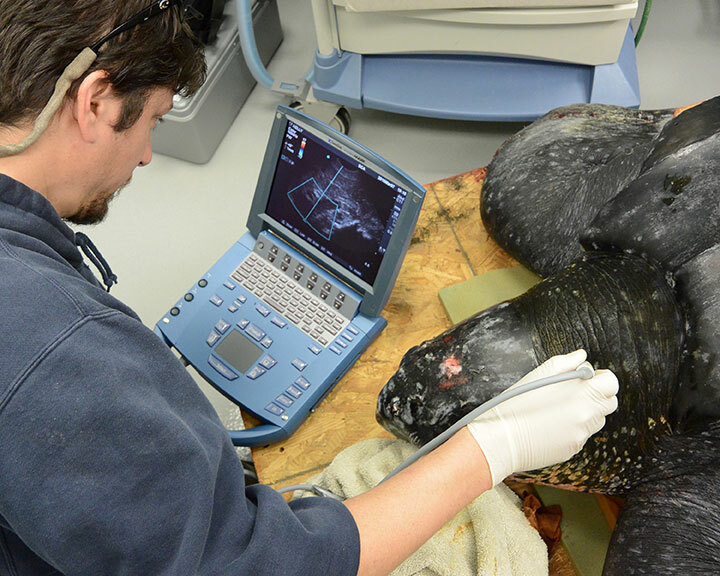 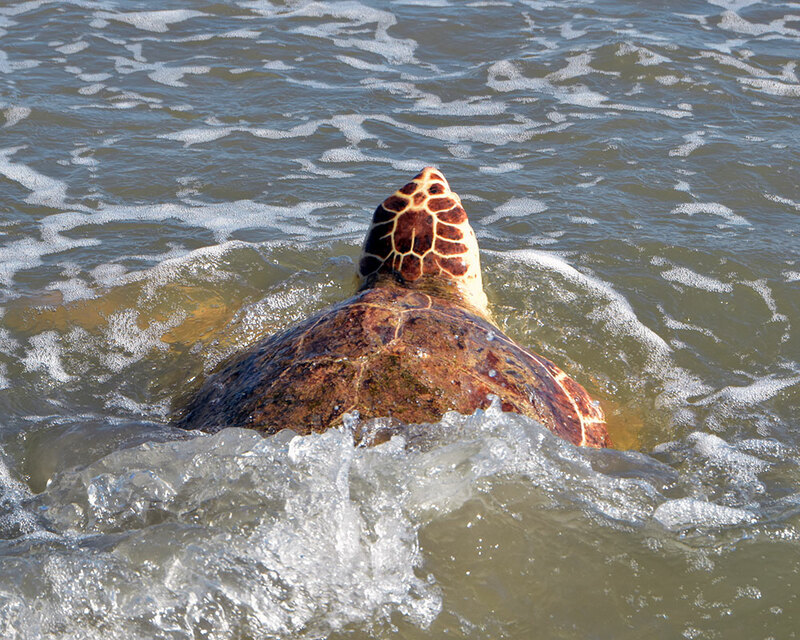 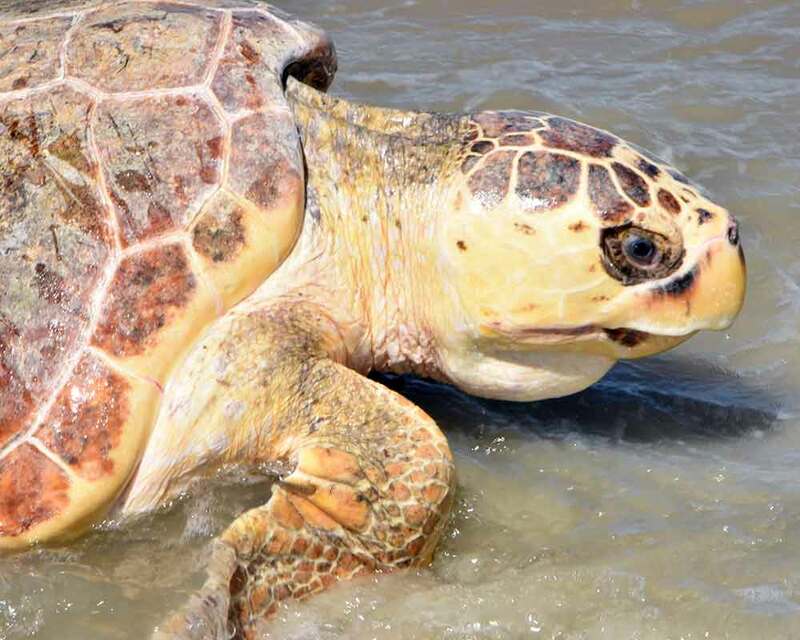 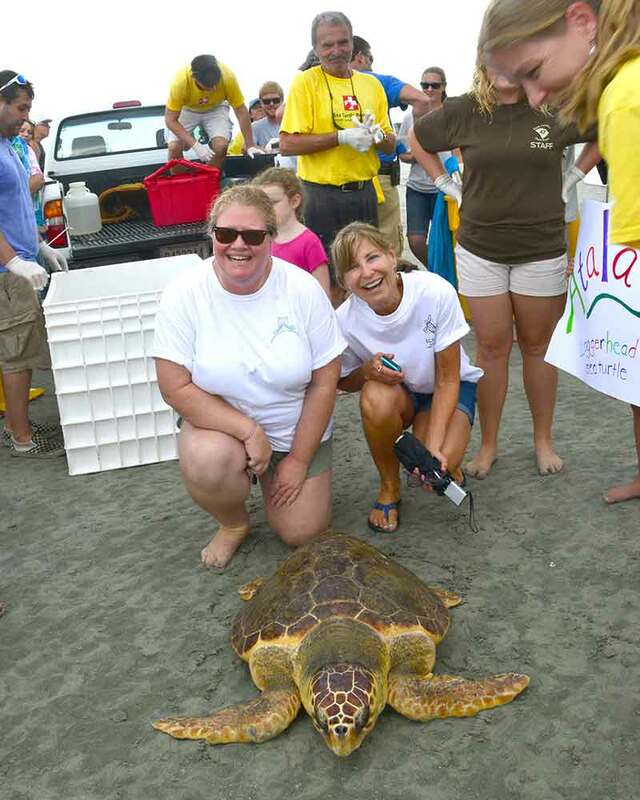 Kia was found stranded by the Kiawah Turtle Team in July of 2015. 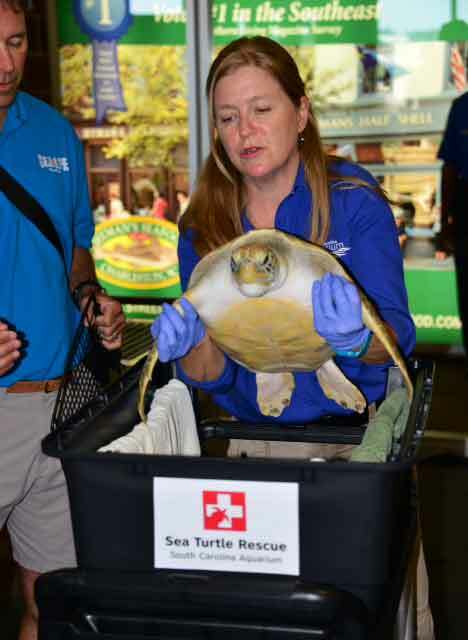 Upon admission to the Turtle Hospital, staff determined this turtle was suffering from DTS-- debilitated turtle syndrome, which results in a poor overall state of health. 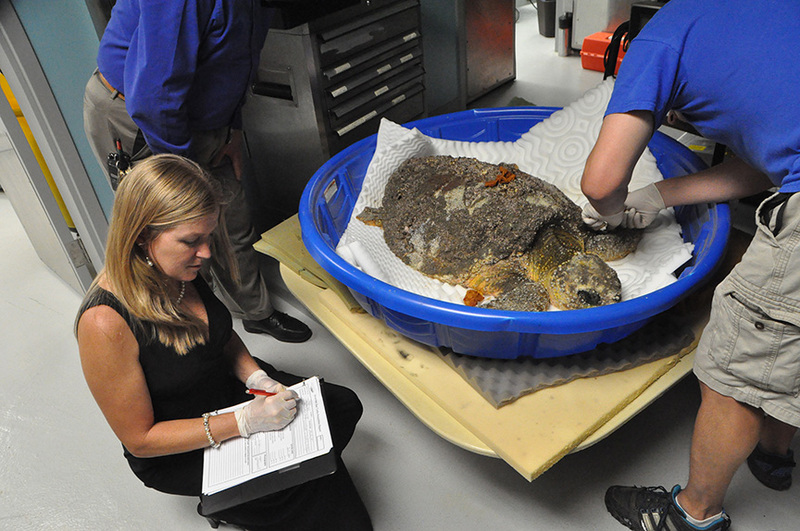 Treatment for Kia included antibiotics, fluid therapy, vitamins and a healthy diet. 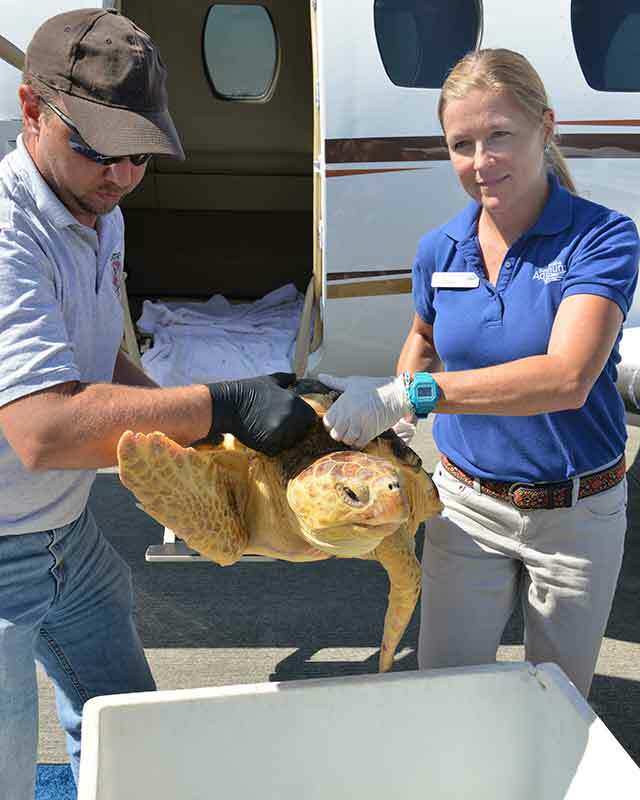 Three loggerhead sea turtle patients arrived this afternoon via charter flight, generously donated by Worcester Airport. 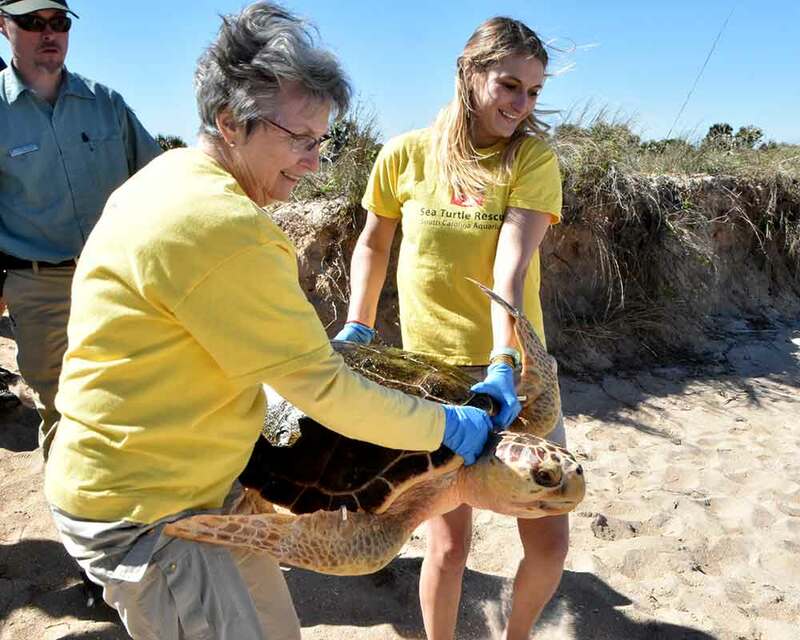 The turtles were part of a recent cold-stun event in the New England area that resulted in the stranding of more than 400 sea turtles on local beaches. 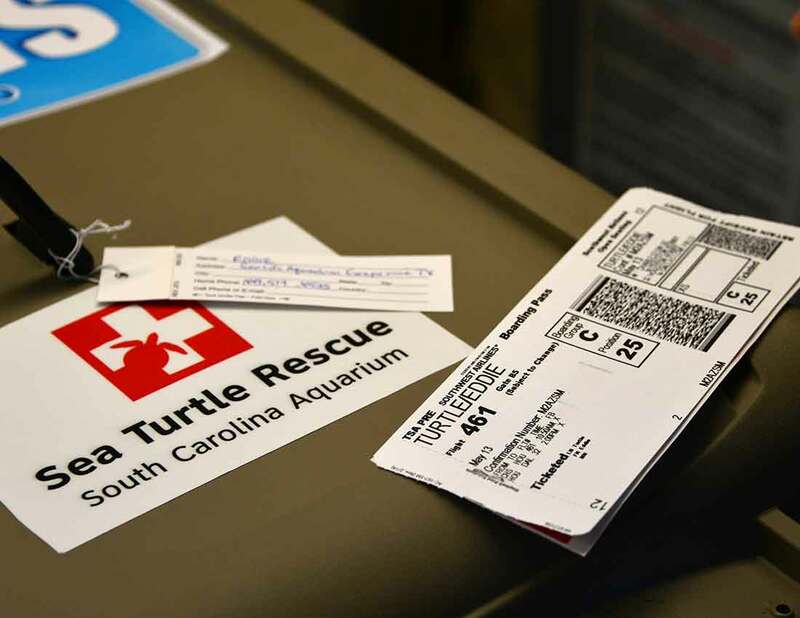 Five turtles were transported on today’s flight, three were admitted to our Sea Turtle Hospital and the other two will receive treatment at the Georgia Sea Turtle Center. 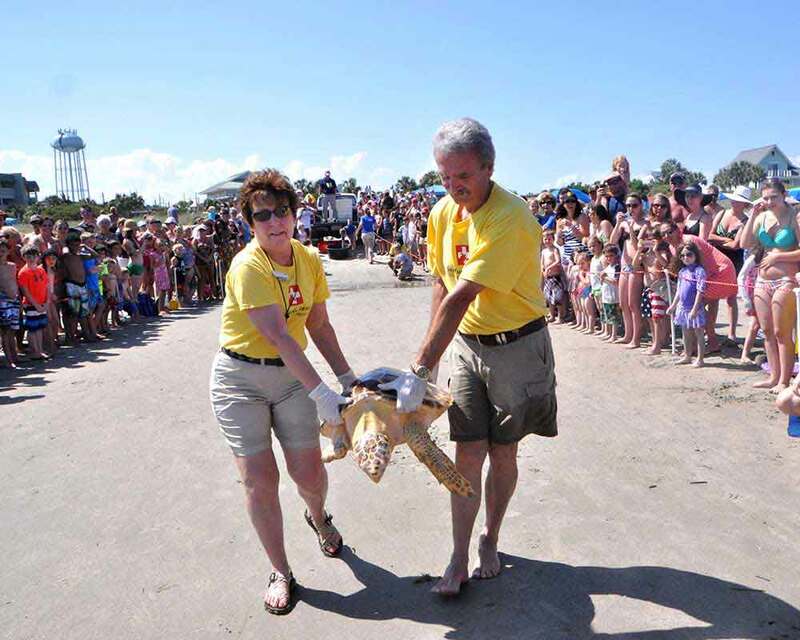 Every year turtles are caught by the early cold weather in Cape Cod, stunned and stranded on the beaches. 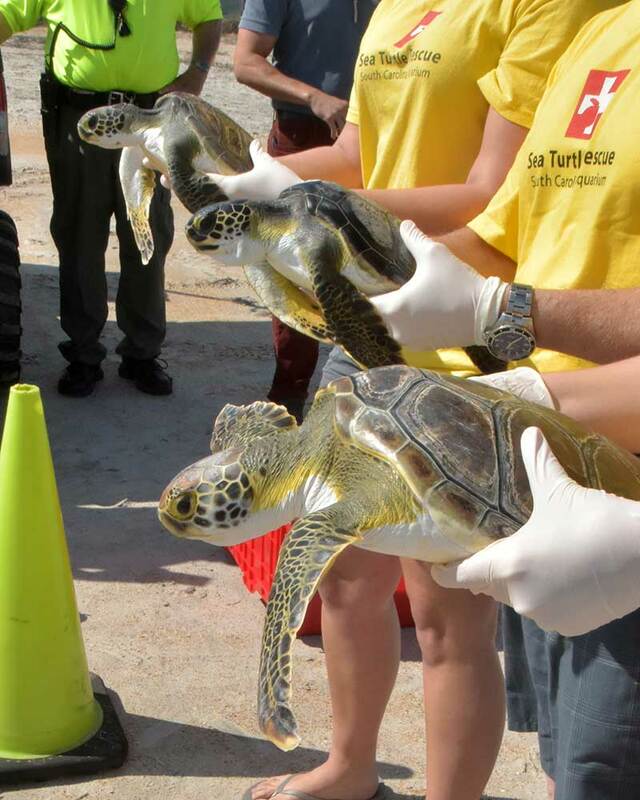 The South Carolina Sea Turtle Hospital pitched in and took in dozens of these turtles. 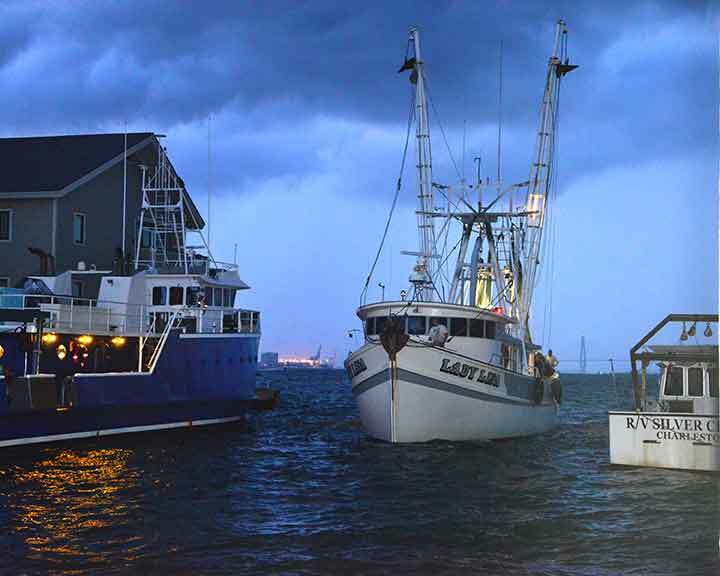 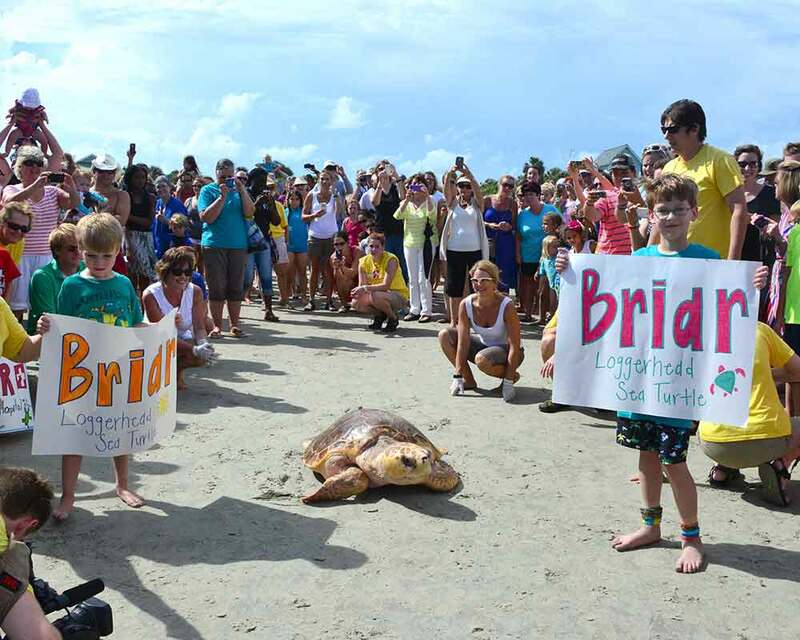 On Wednesday the last two were released and sent on their way off the Isle of Palms. 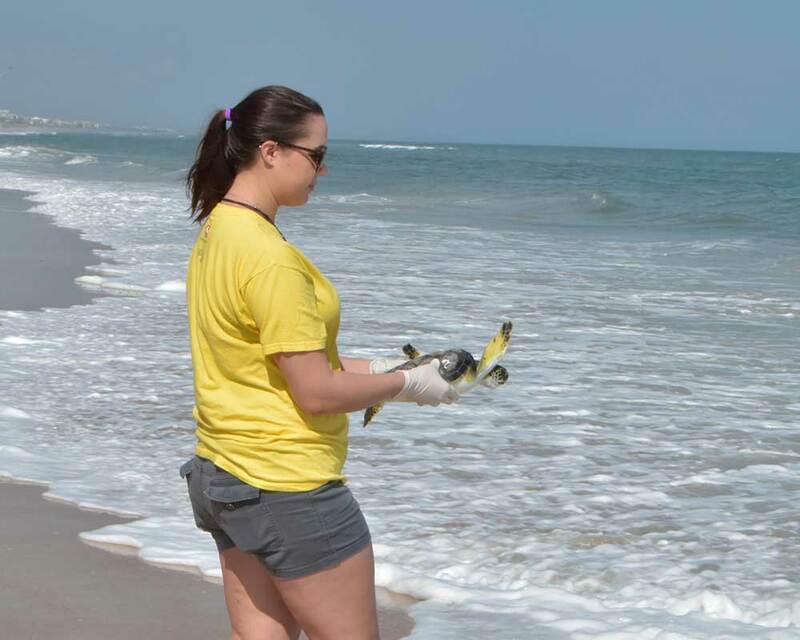 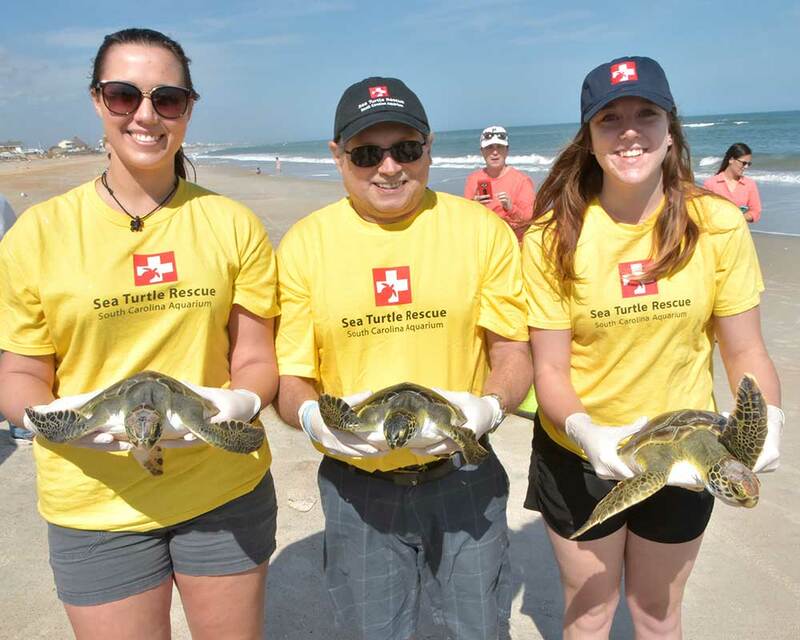 This has been a record year for the Turtle Hospital and every turtle that can be released allows room for new patients. 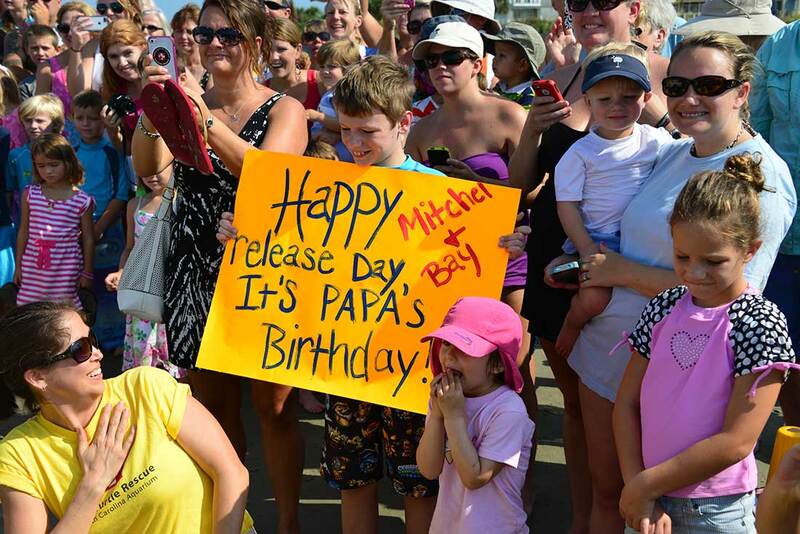 This release was planned with very short notice. 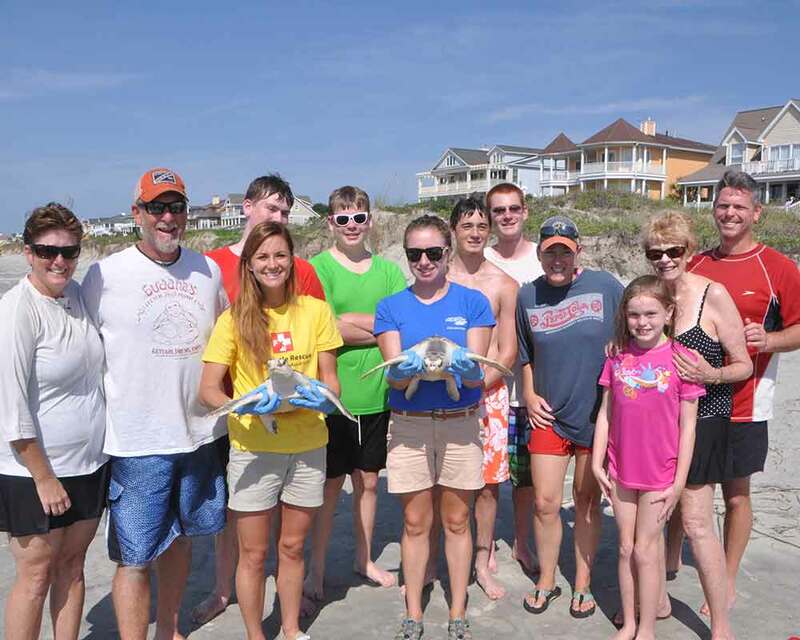 One lucky family of beach visitors was lucky enough to take part. 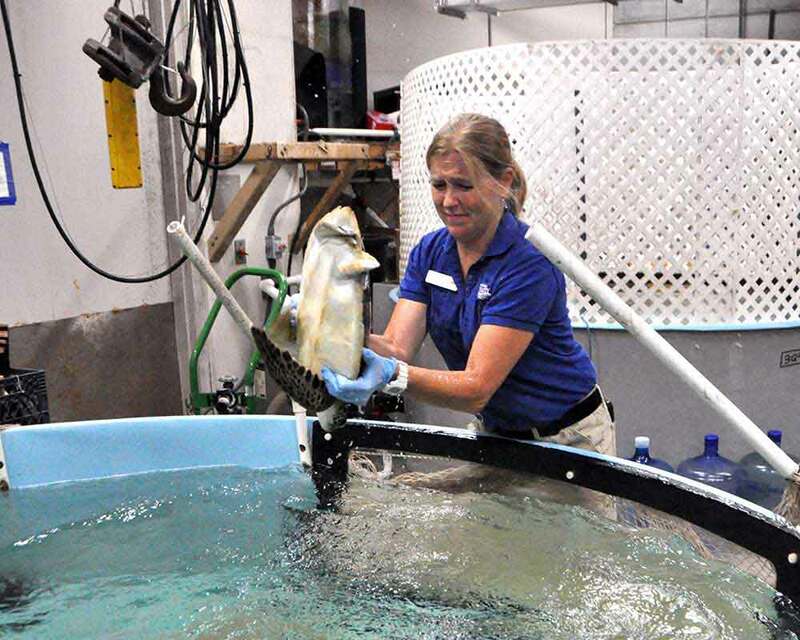 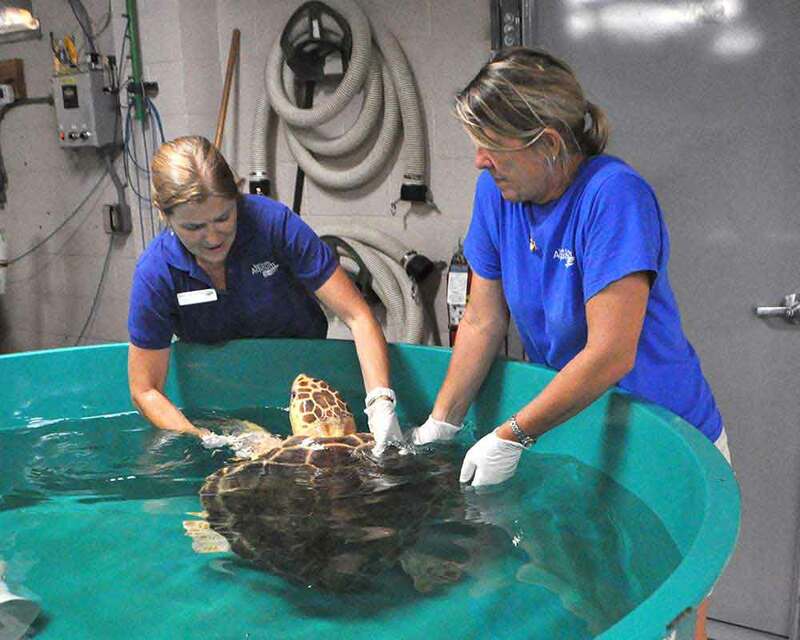 Over the past few weeks the South Carolina Aquarium Sea Turtle Hospital has admitted a record number of turtles. 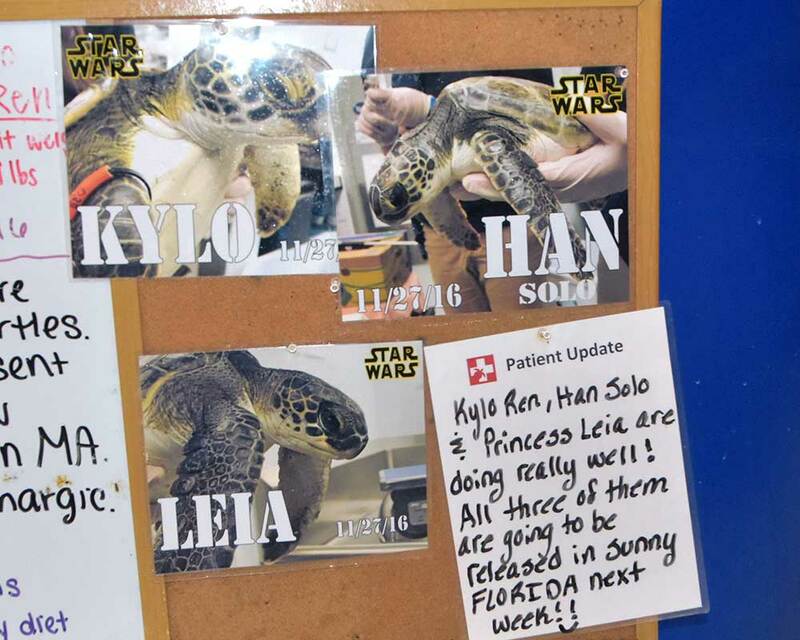 We have more sick turtles than space to keep them. 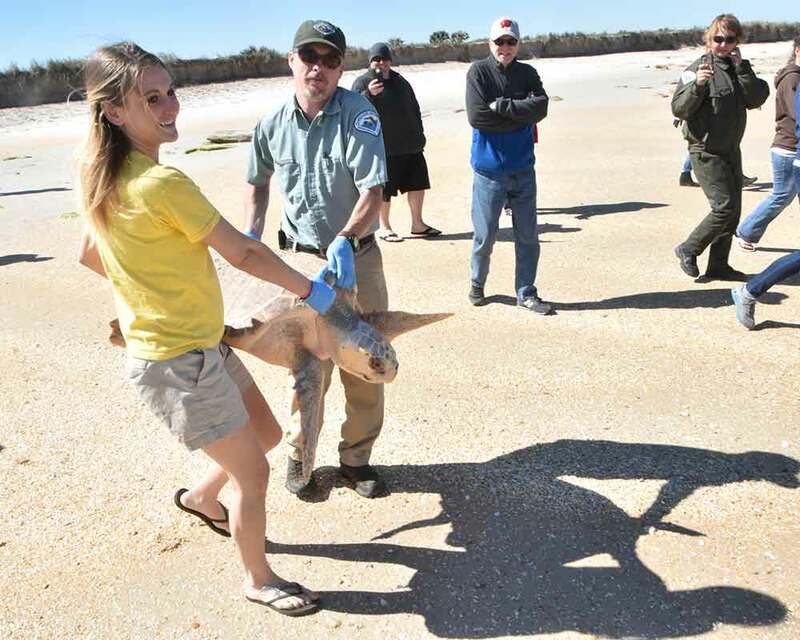 Three turtles were OK'd for release and with very short notice, they were packed up and taken to the County Park on the Isle of Palms. 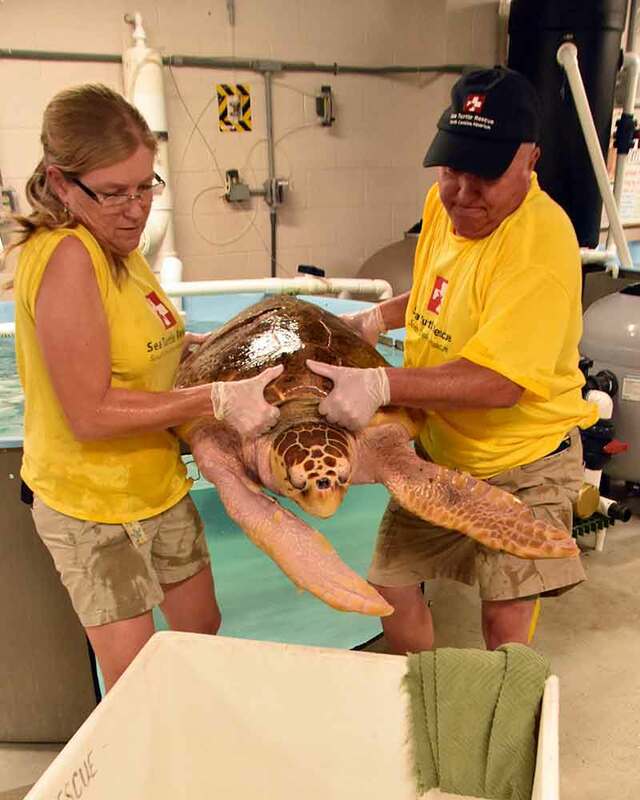 Two loggerhead sea turtles that were admitted in the summer of 2014 in critical condition, were successfully returned to the Atlantic Ocean this afternoon. 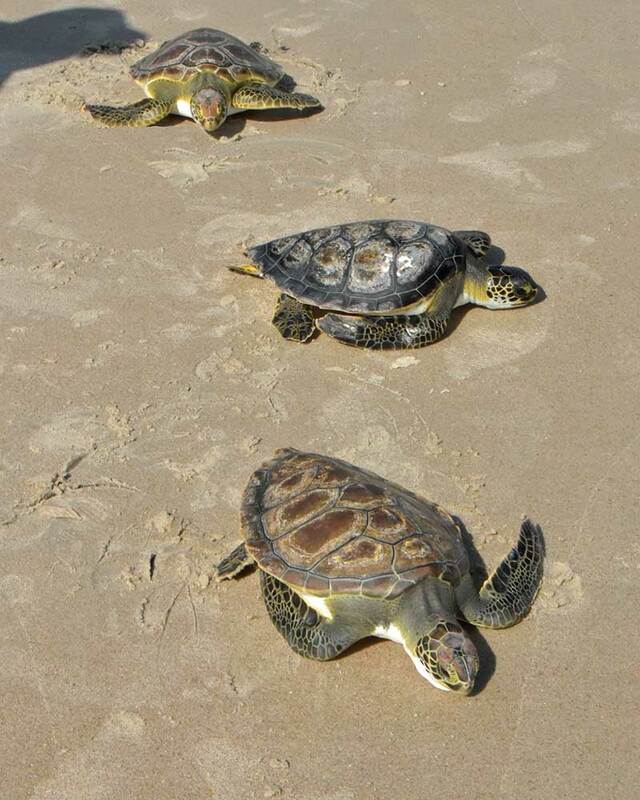 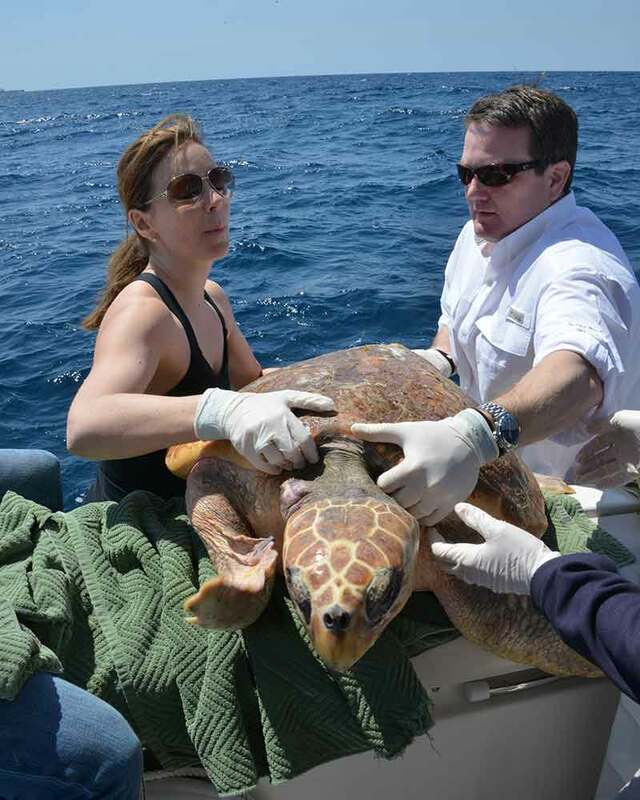 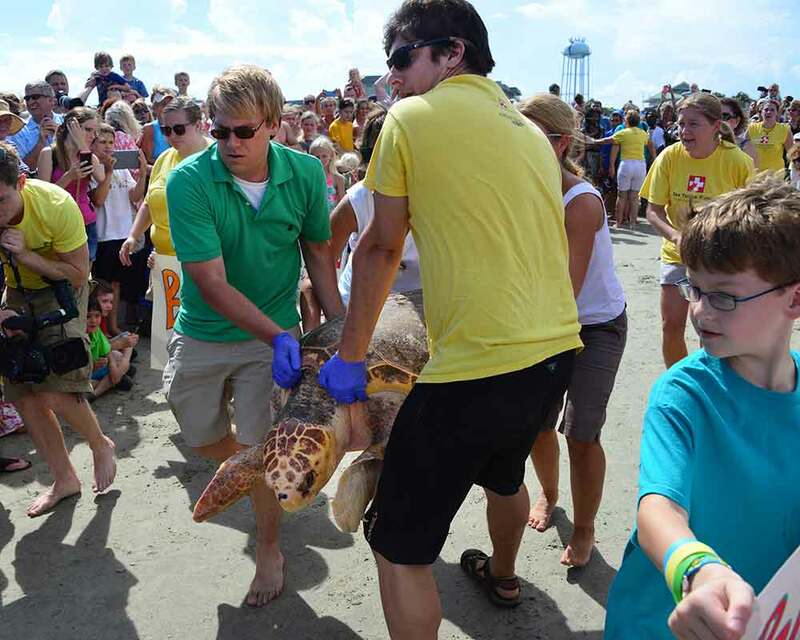 The turtles, Lazarus and Dozer, were released by boat approximately 40 miles off the coast of Charleston. 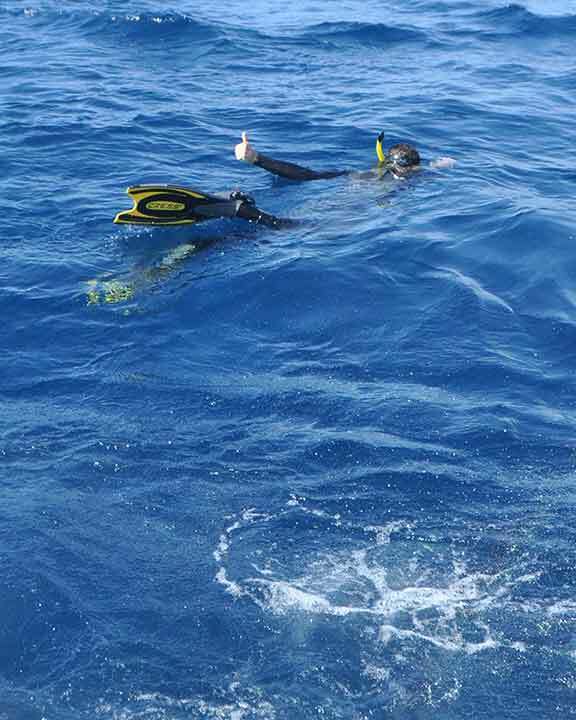 The trip offshore was generously donated by John Hill, a resident of Wadmalaw Island. 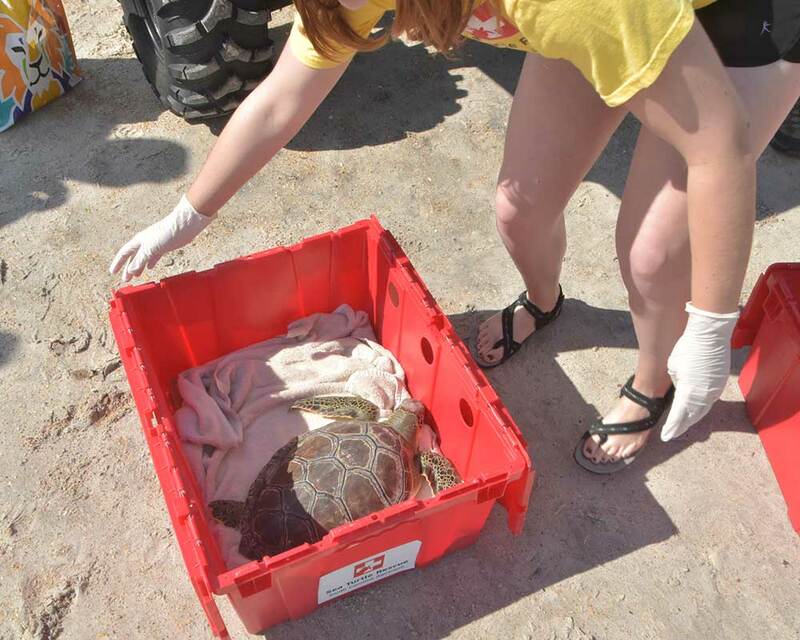 The turtles were packed up early this morning and were on their way by 7:30 this morning. 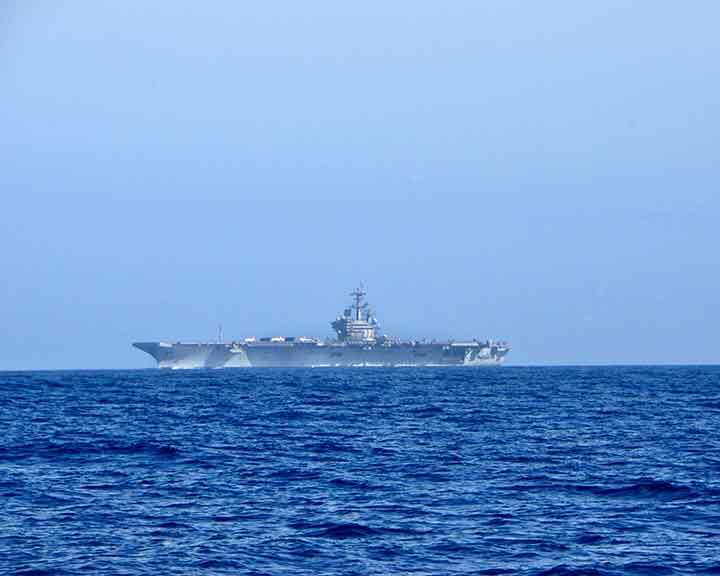 They weren't really happy with the noisy ride, but we enjoyed getting to see a US Navy aircraft carrier on our way out. 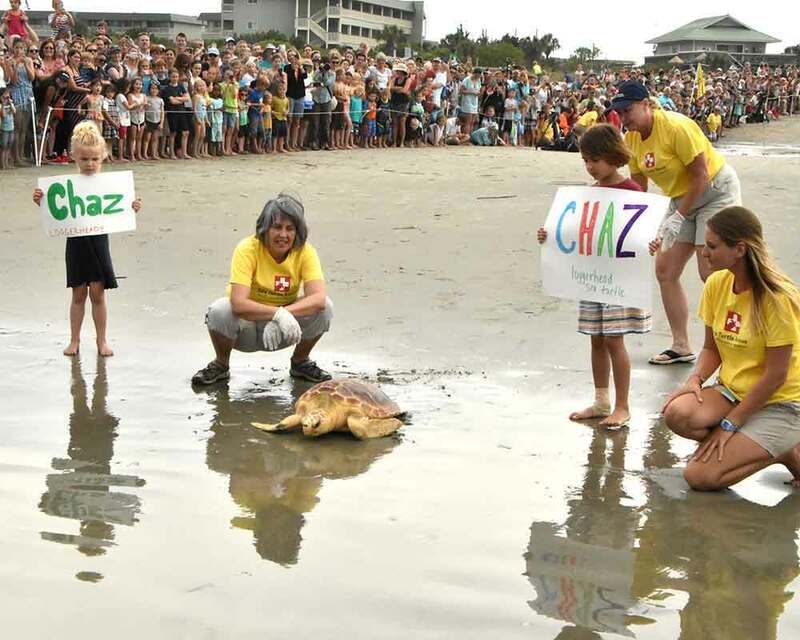 Next was Dozer. 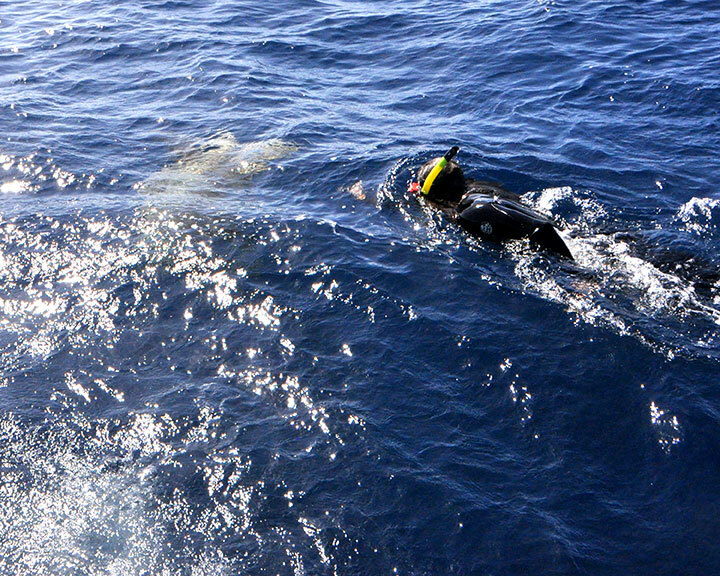 He didn't waste any time getting away from the boat and our divers. 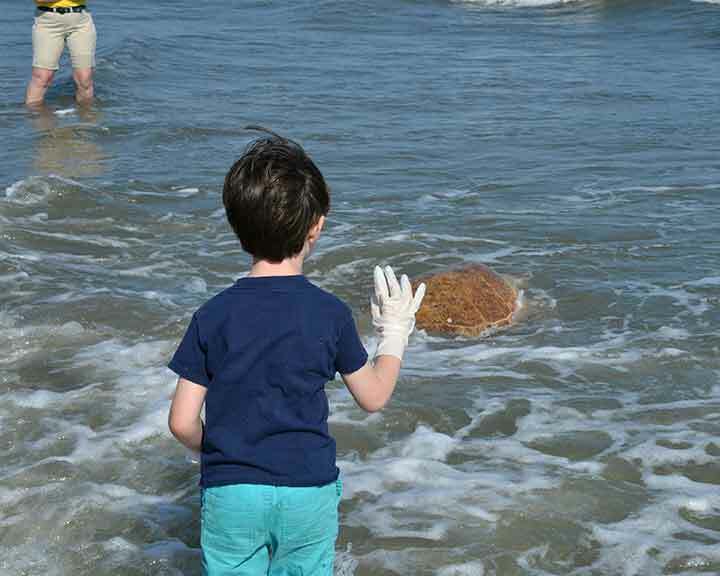 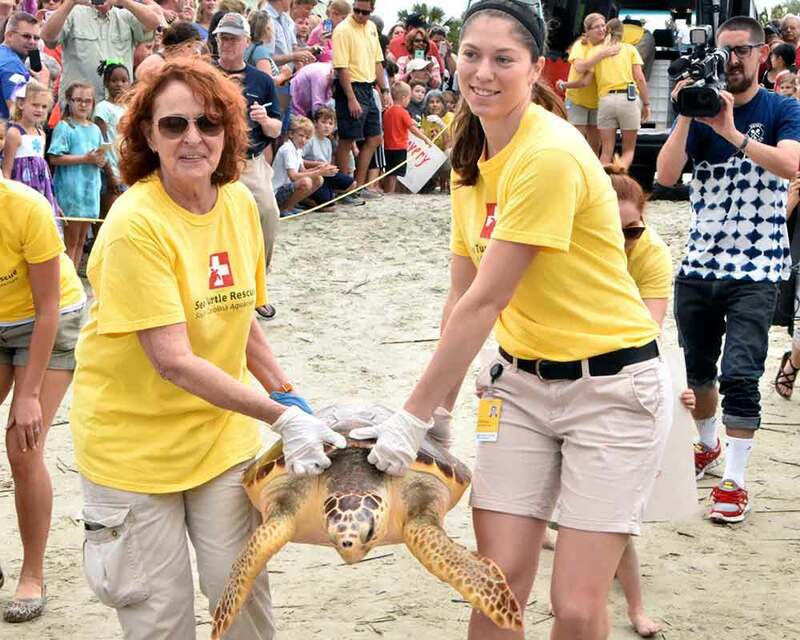 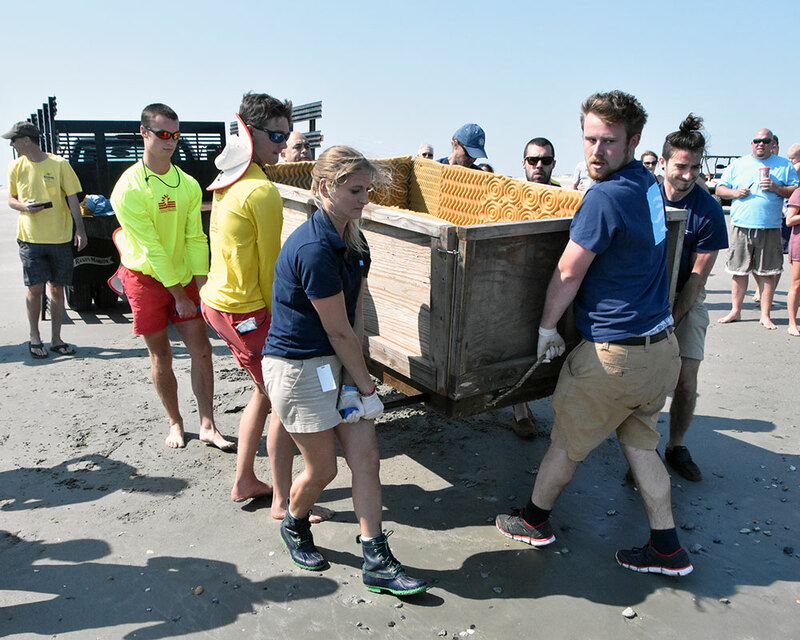 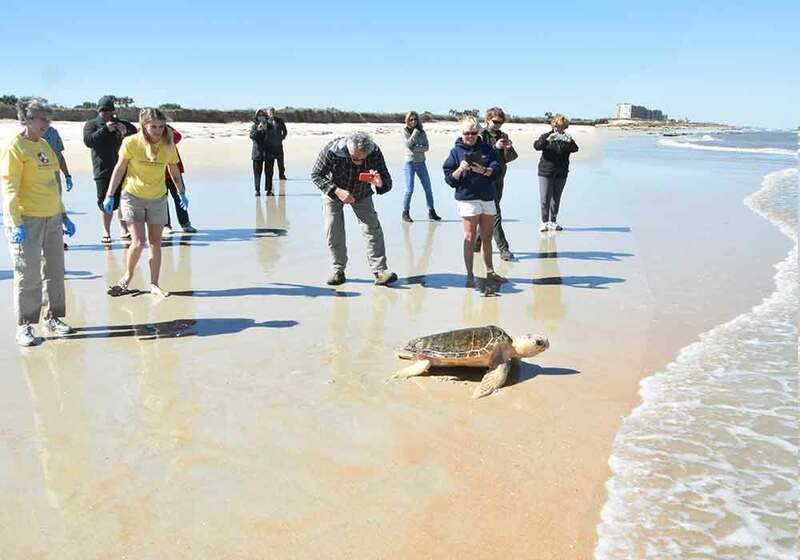 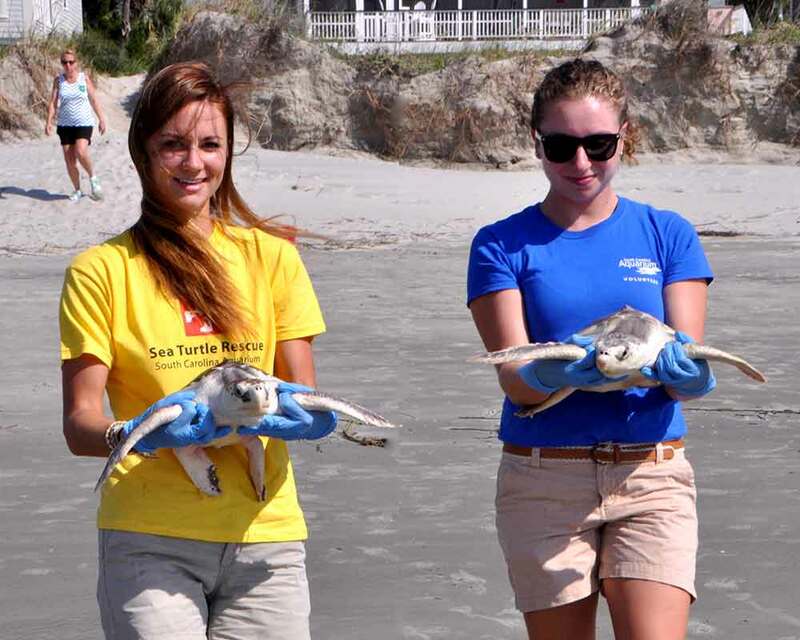 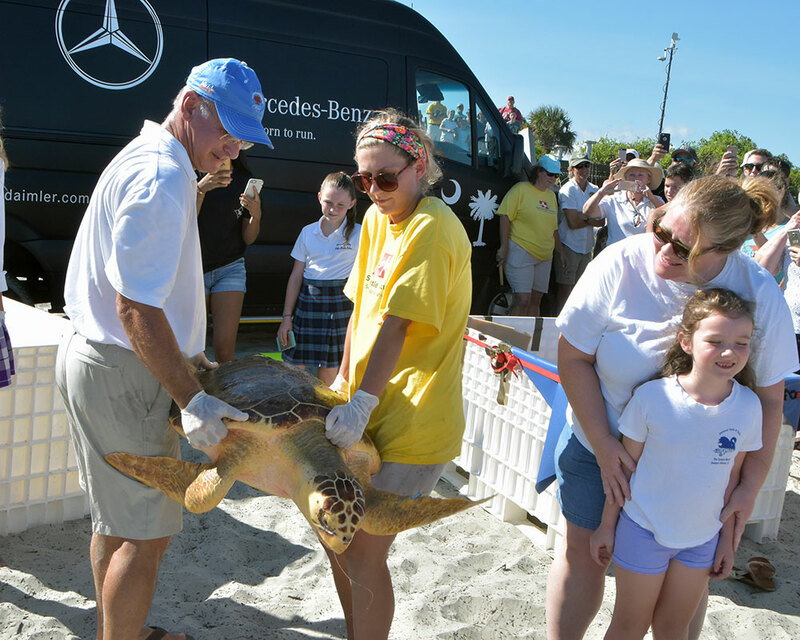 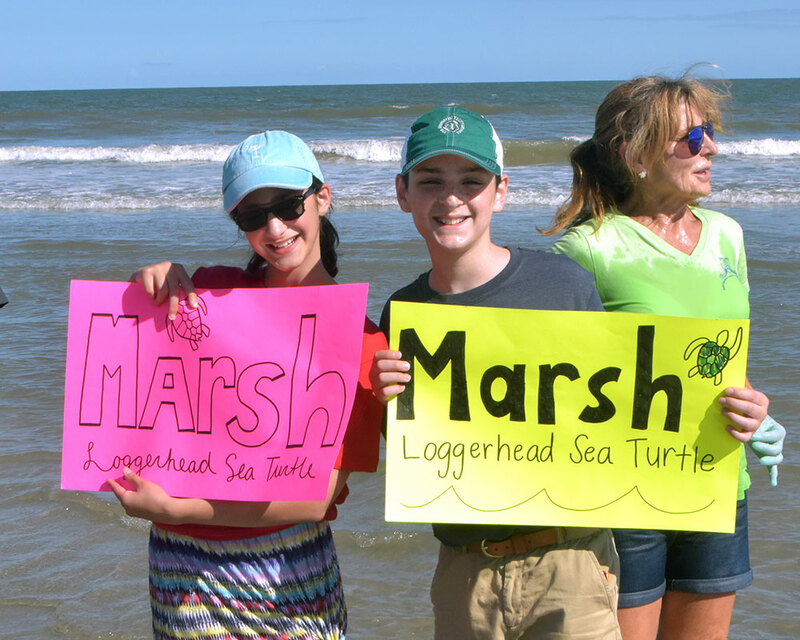 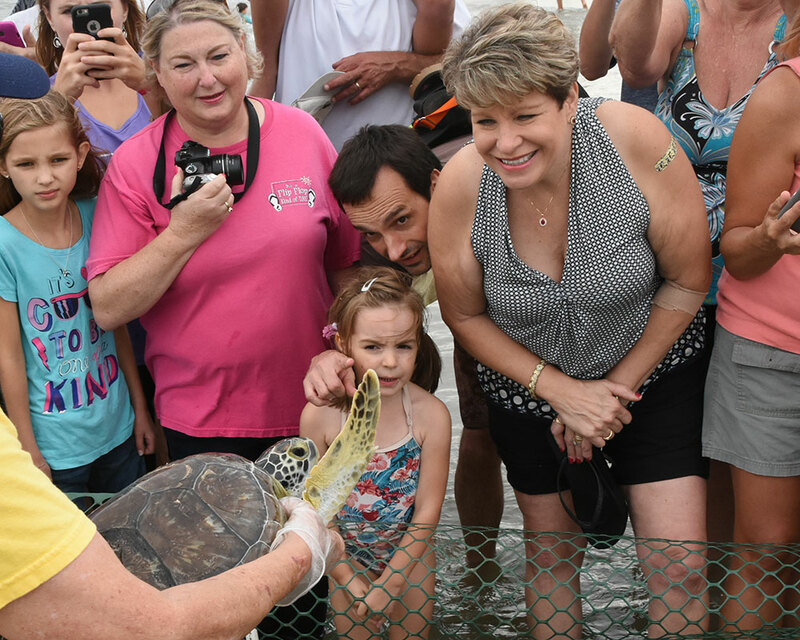 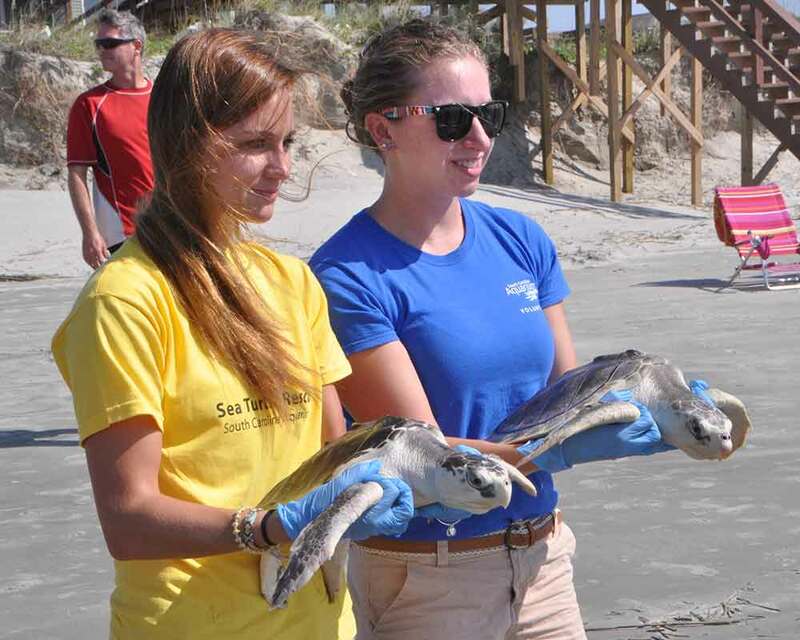 The release of Lazarus and Dozer celebrates 157 threatened or endangered sea turtles successfully treated by the South Carolina Aquarium Sea Turtle Rescue Program. 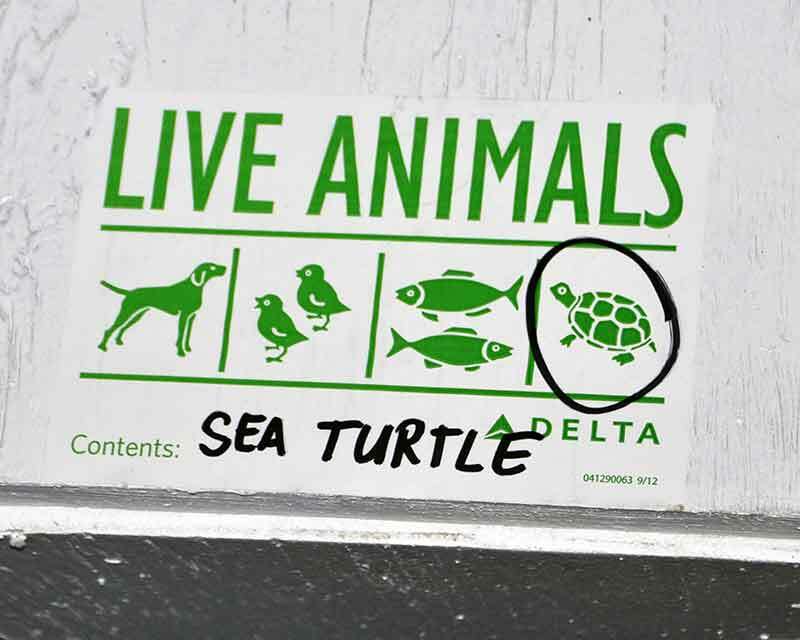 On Saturday the Dept. 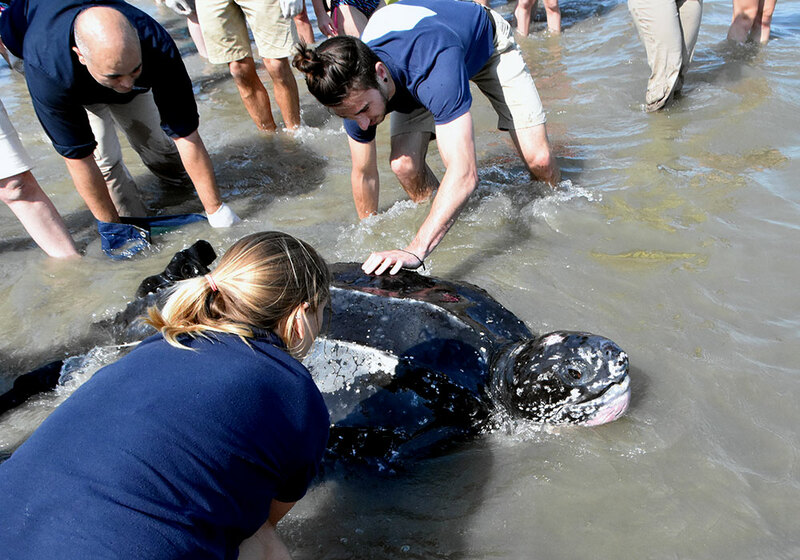 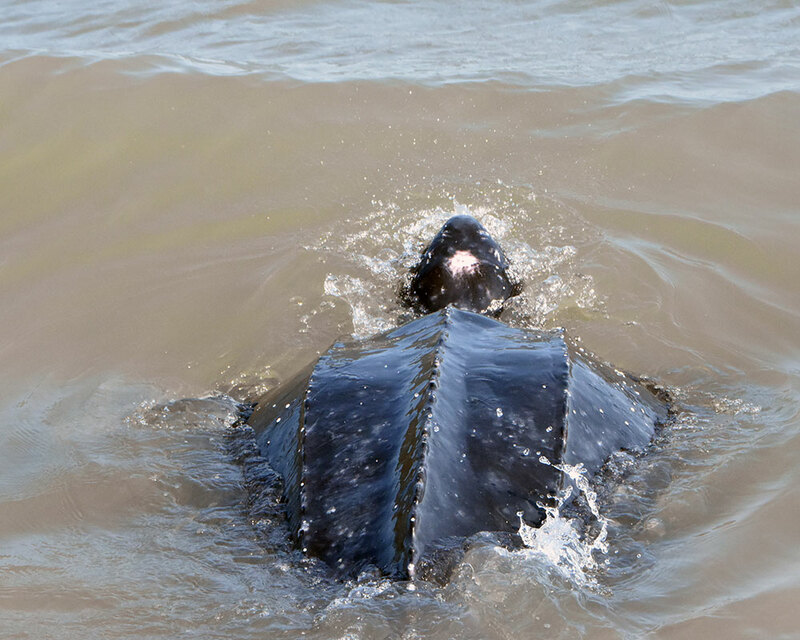 of Natural Resourses got a call that there was a live leatherback stranding at Yawkey Preserve near Georgetown. 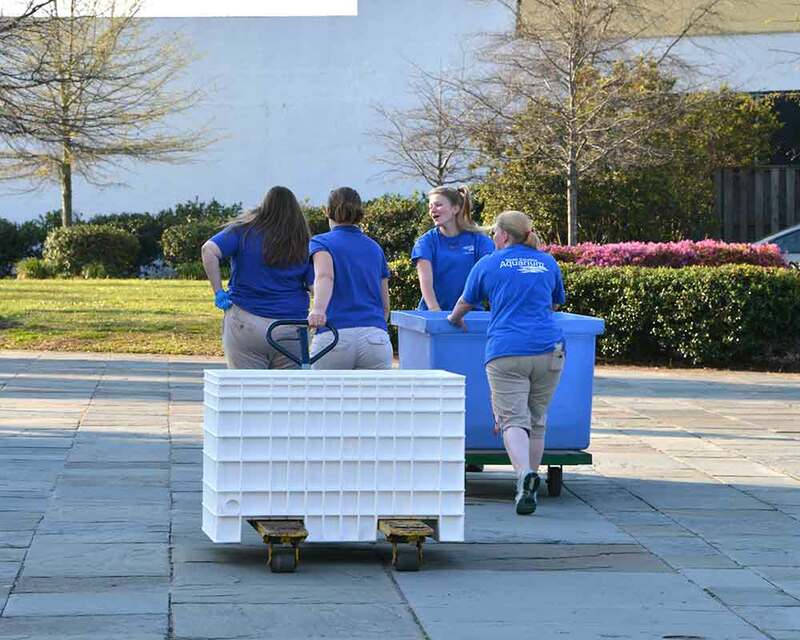 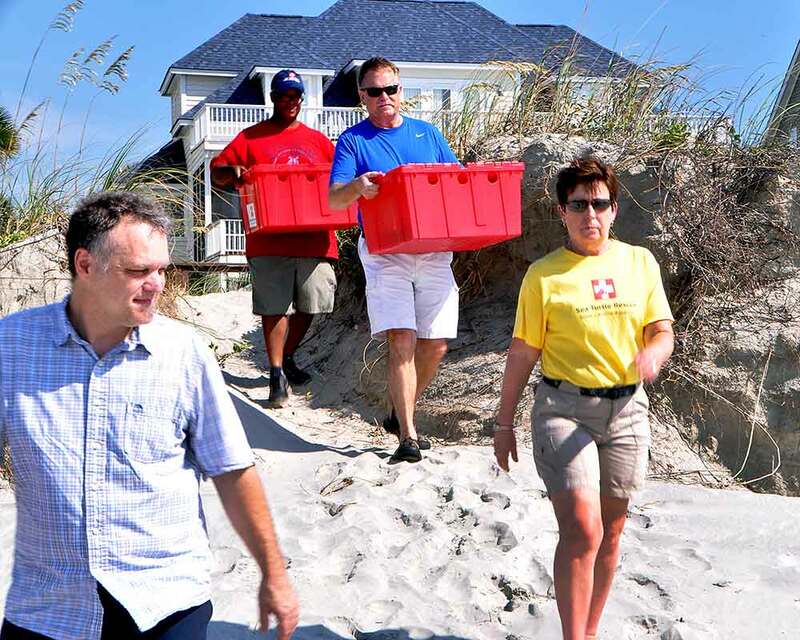 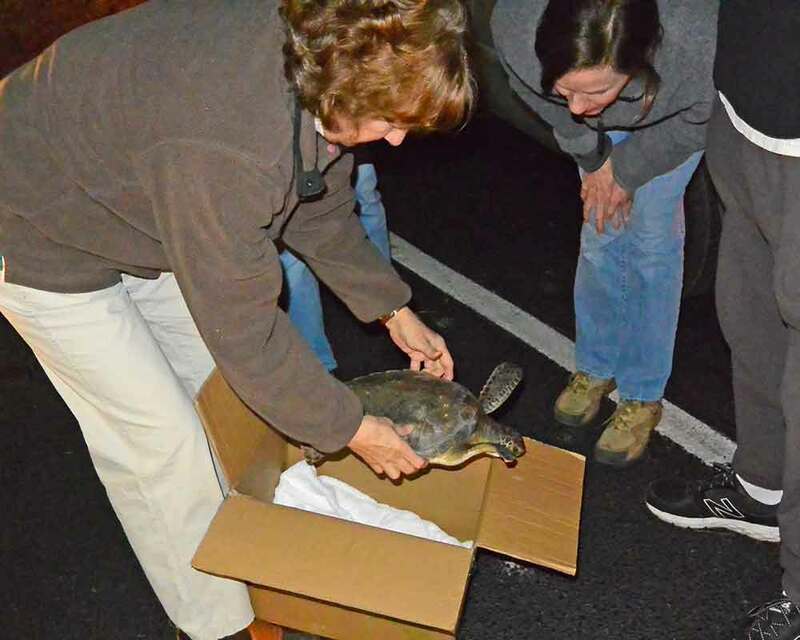 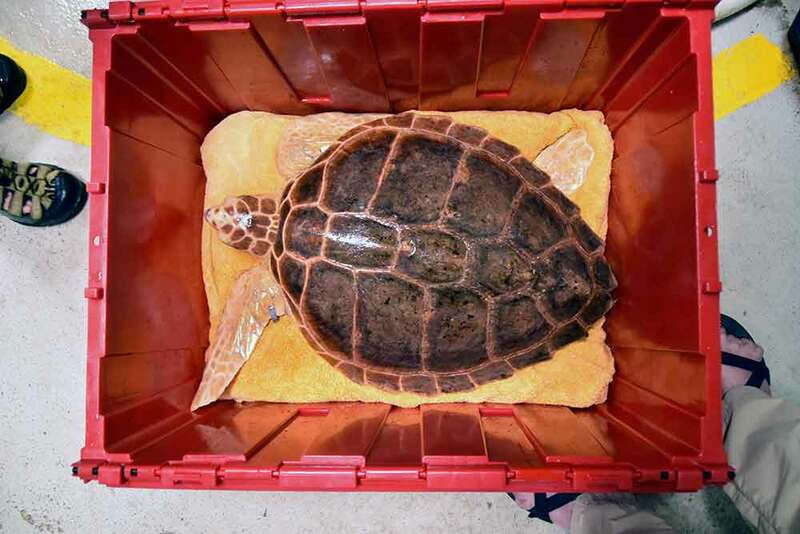 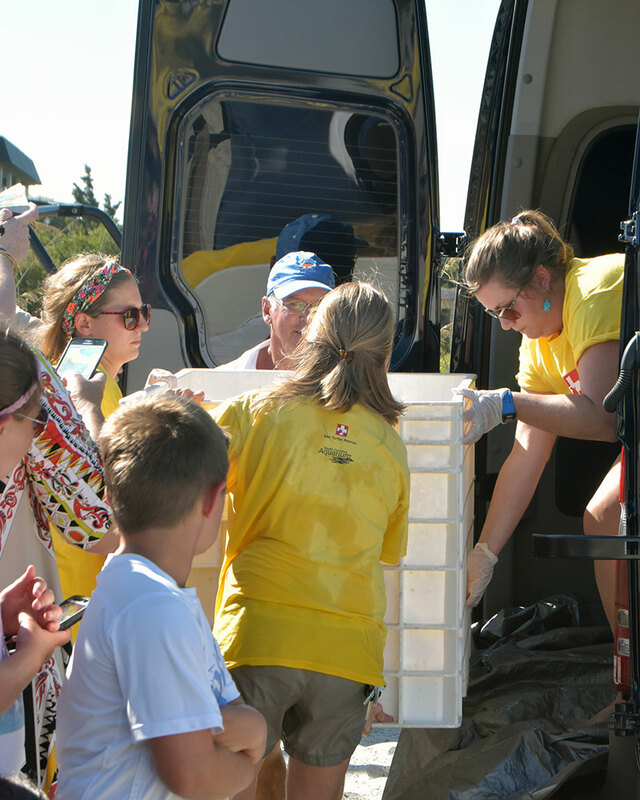 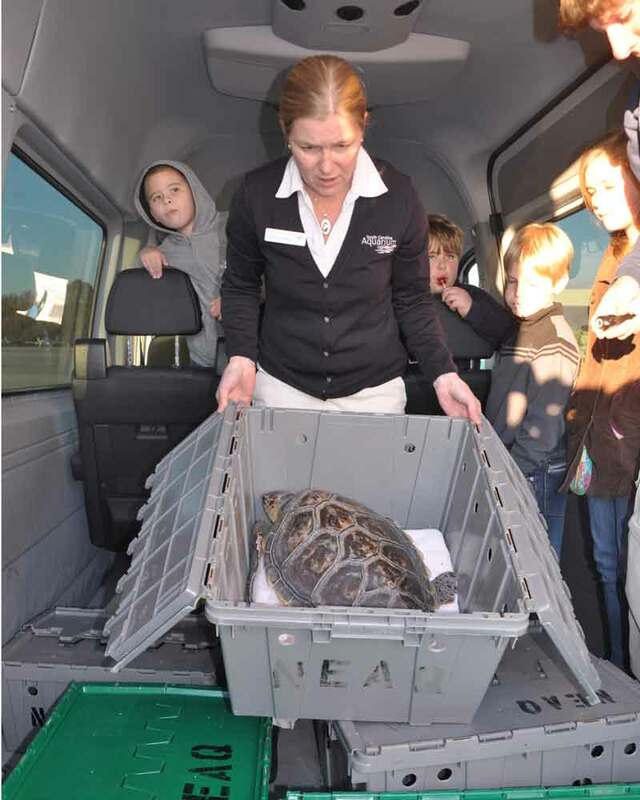 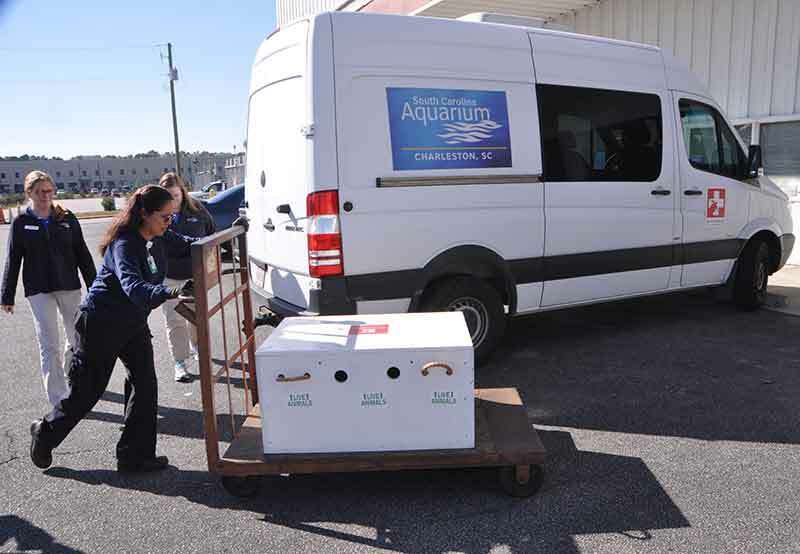 It took hours to organize transporting this turtle back to Charleston to the South Carolina Aquarium Sea Turtle Hospital and once there the work of getting the turtle out of the truck and safely onto the scale commenced. 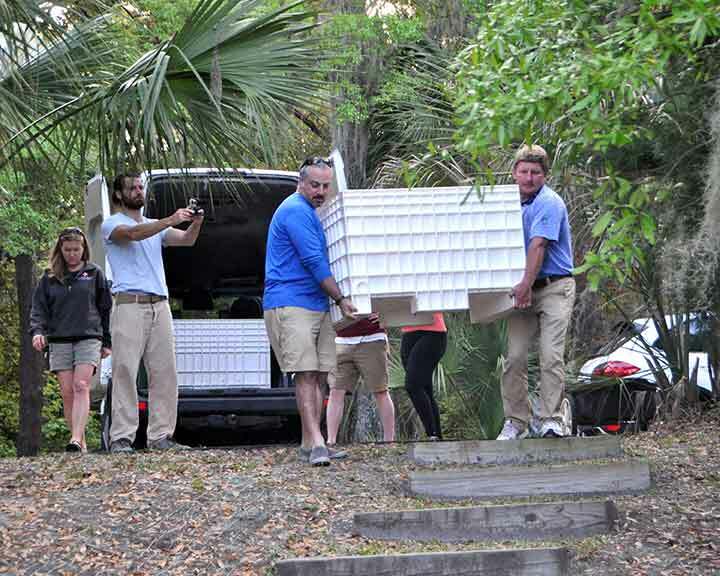 Not an easy task. 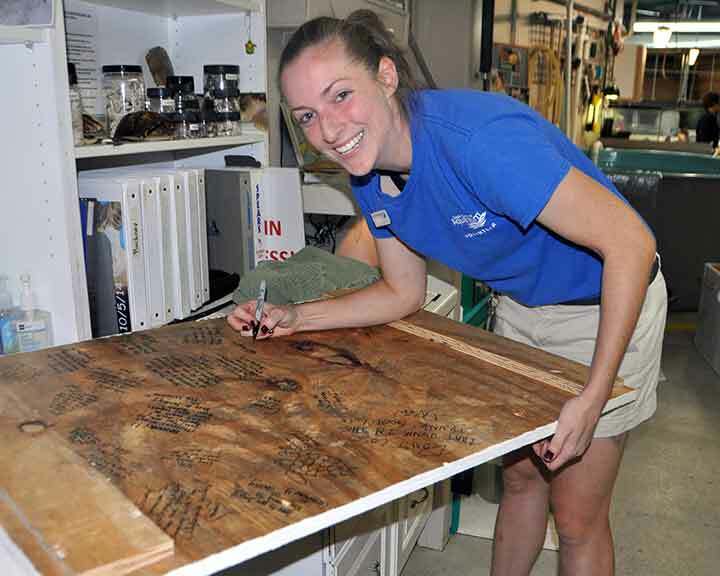 Mike Thorvalson, a carpenter, came up with the tools and 2x4s to reinforce a 4 by 8ft. 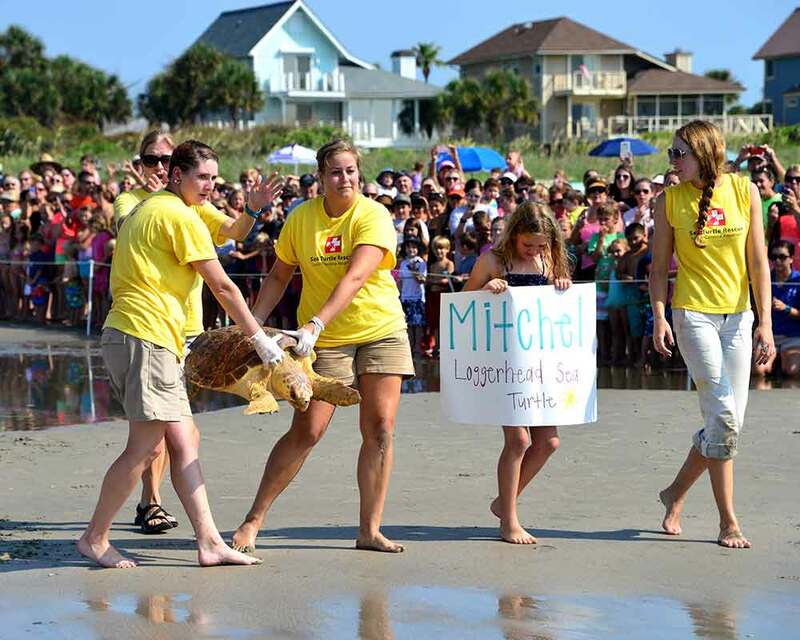 board to get the turtle safely into the hospital. 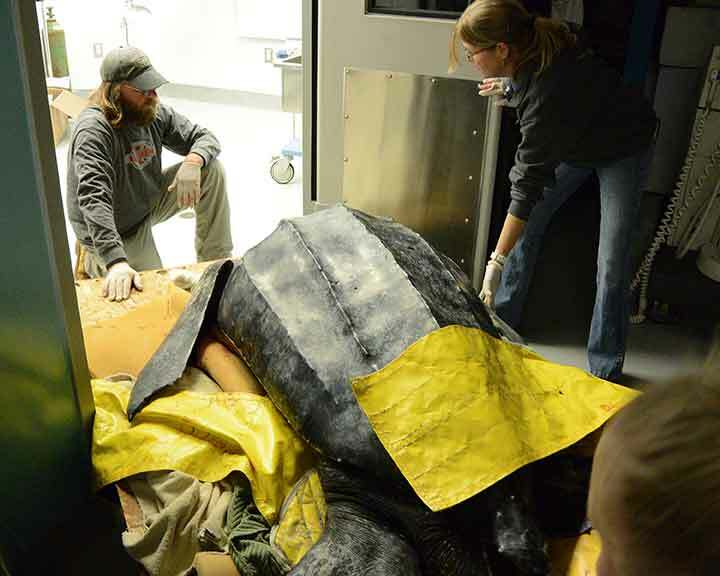 Space is tight and negotiating the animal through the doors to the medical facility was next. 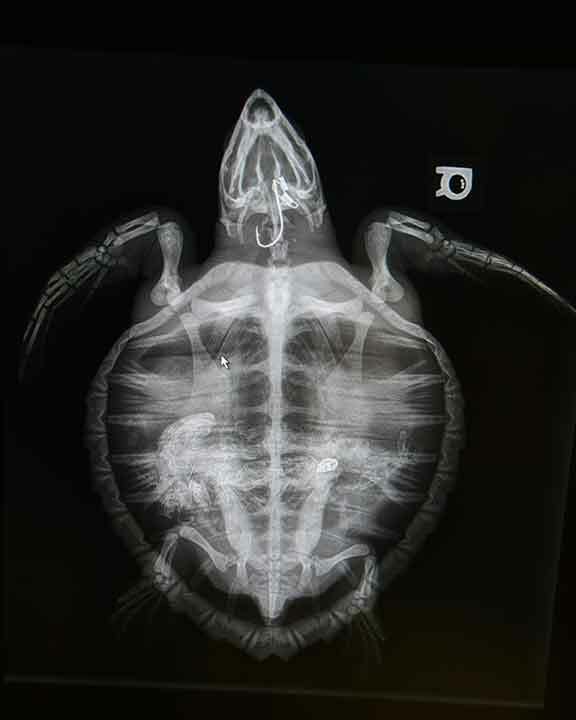 There was time to snap a couple of pictures before treatments began. 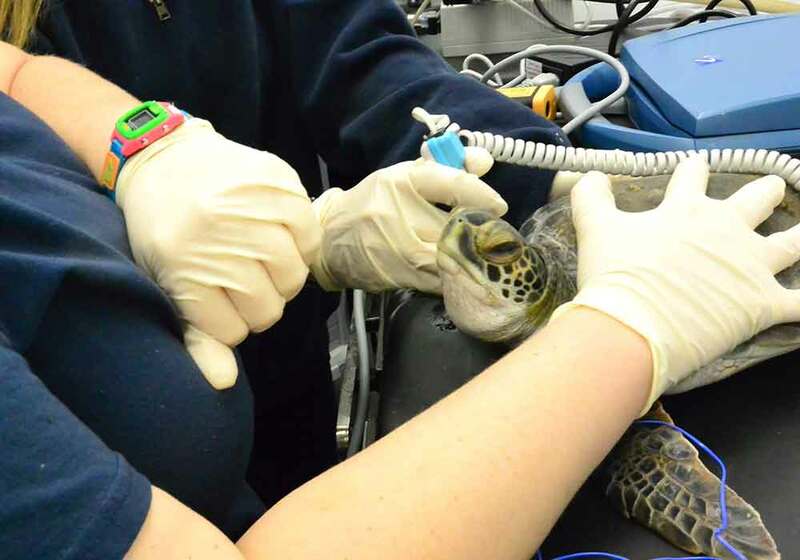 First bloodwork and then administer fluids. 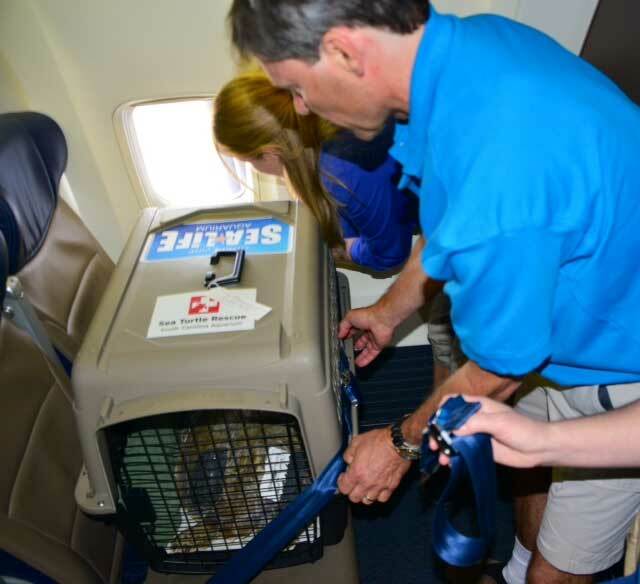 Jersey's on her way to San Diego! 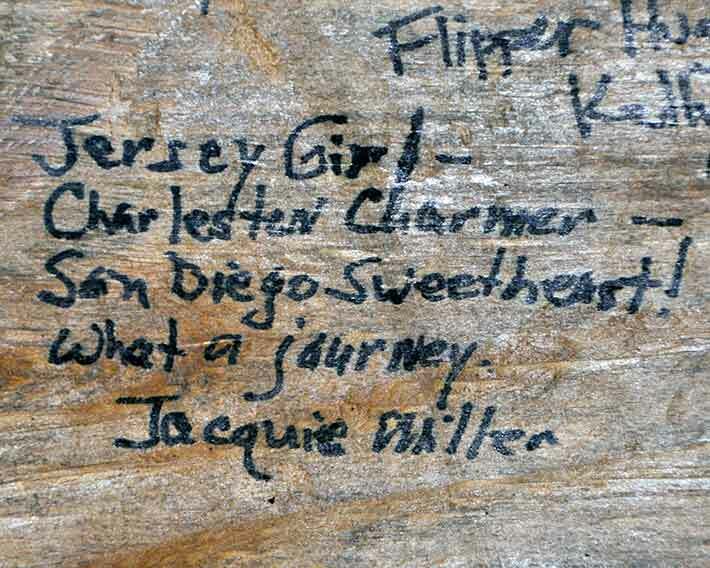 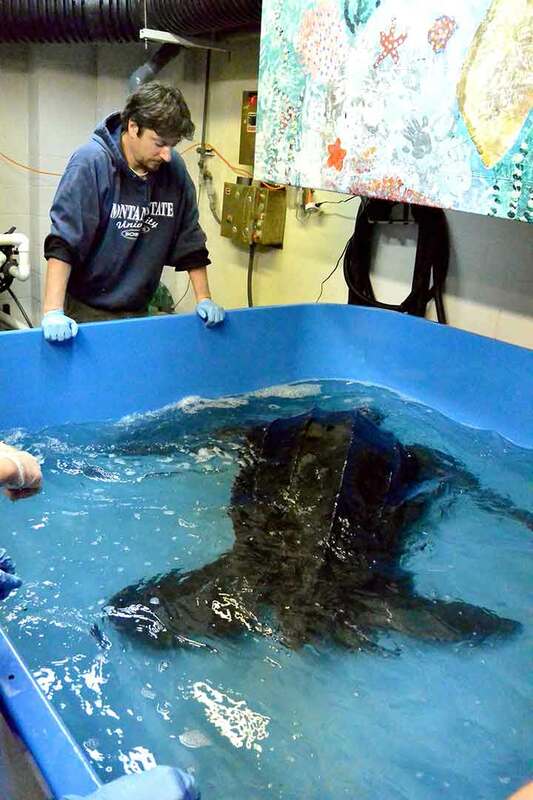 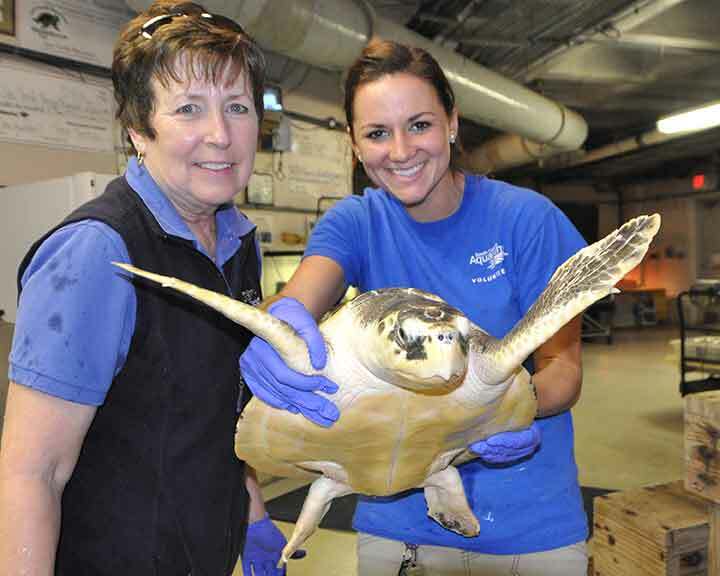 "Jersey's" first flight was to the South Carolina Aquarium 14 months ago from New Jersey. 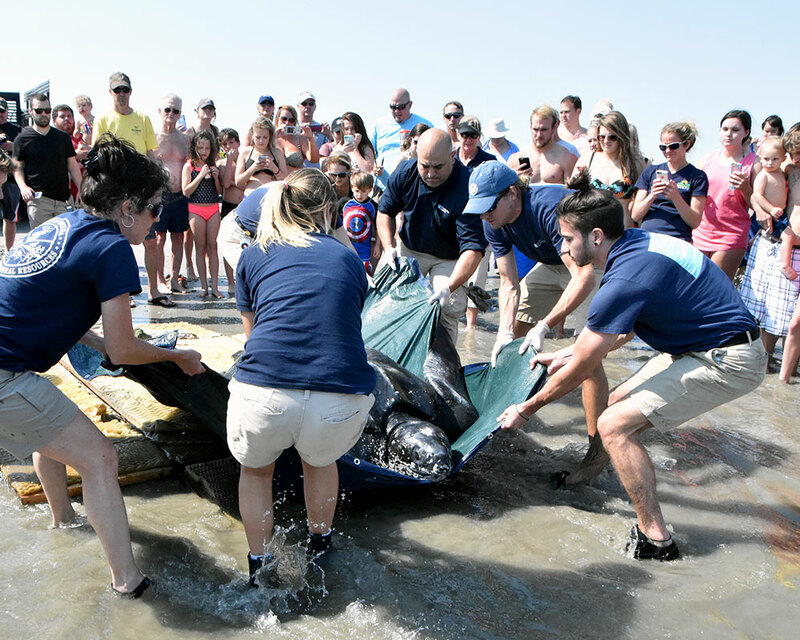 After months of treatment it was determined that "Jersey" could not make it in the wild and a protected permanent home was needed. 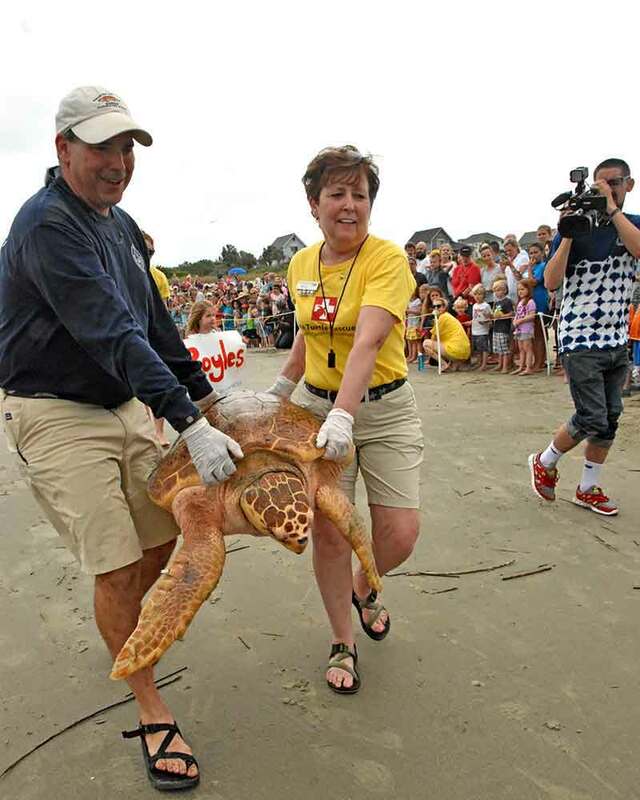 TODAY "Jersey" made her second plane trip...this one a lot further. 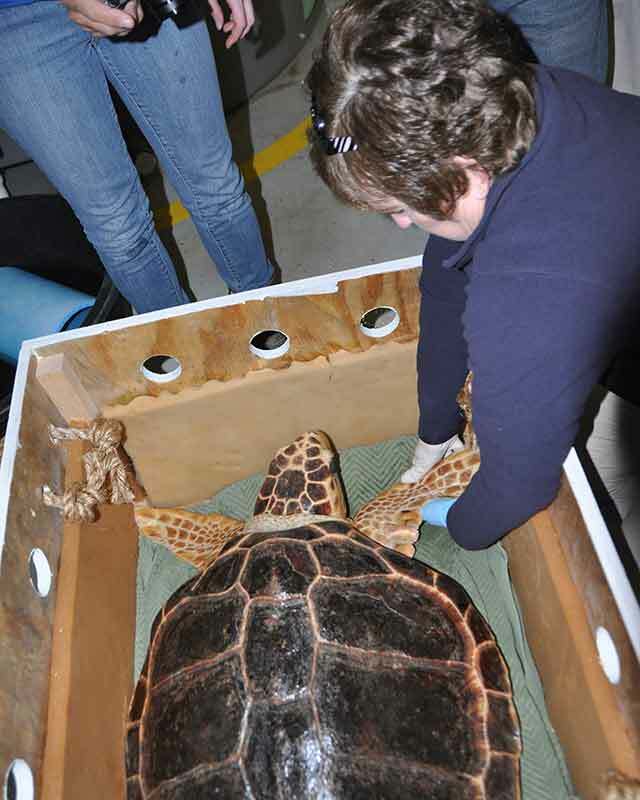 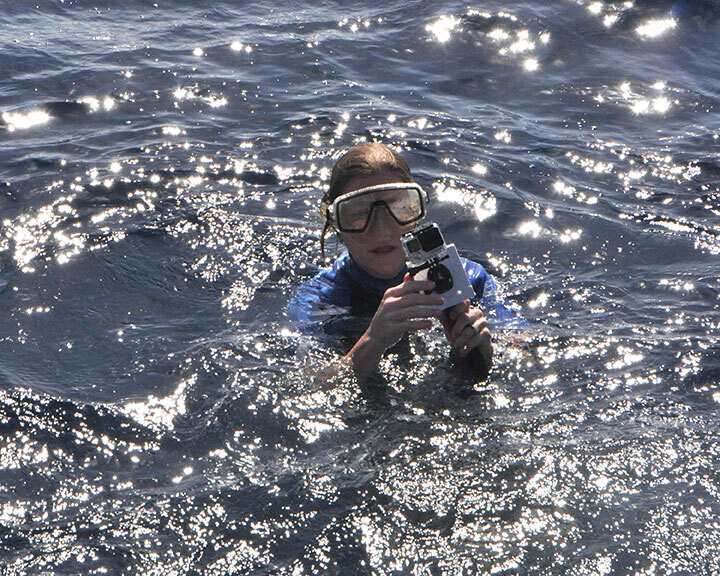 She's on her way to The Birch Aquarium at the Scripps Institute of Oceanography in San Diego. 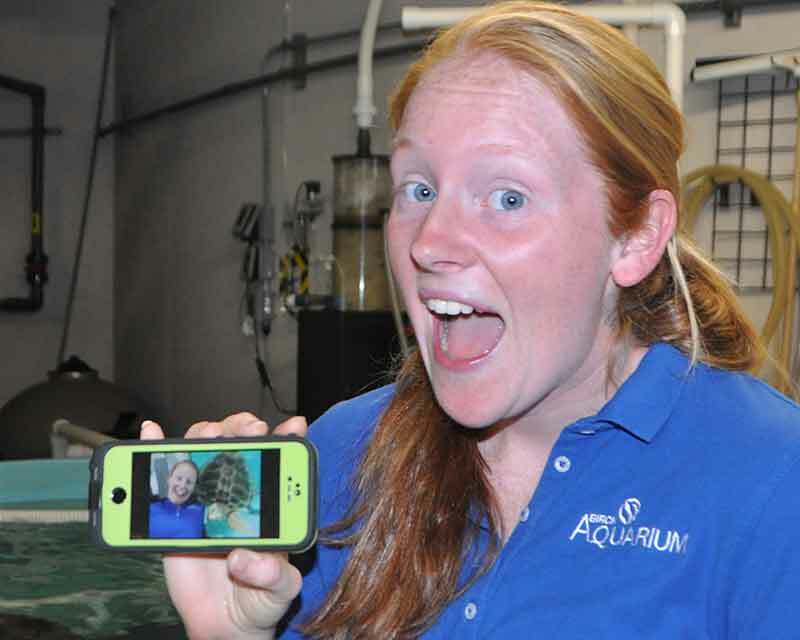 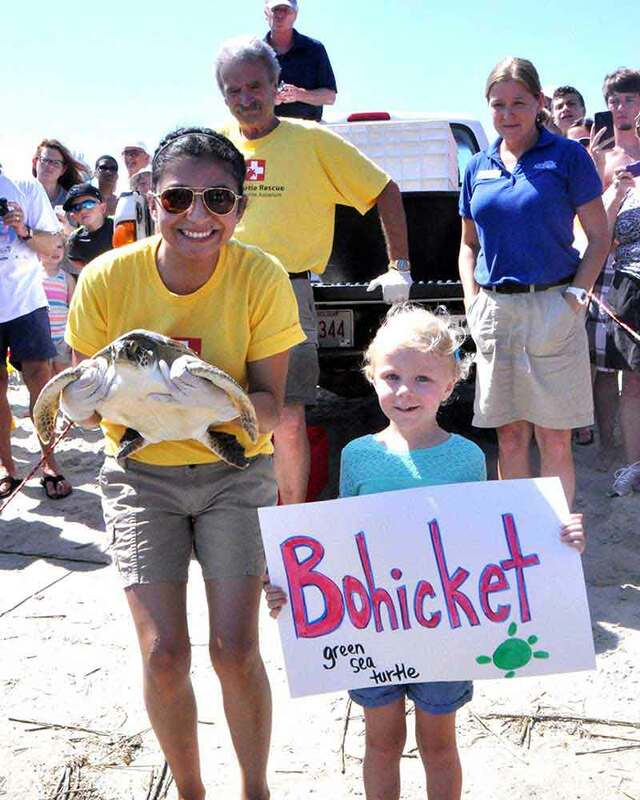 This turtle is loaded with personality and will be the star of her new home! 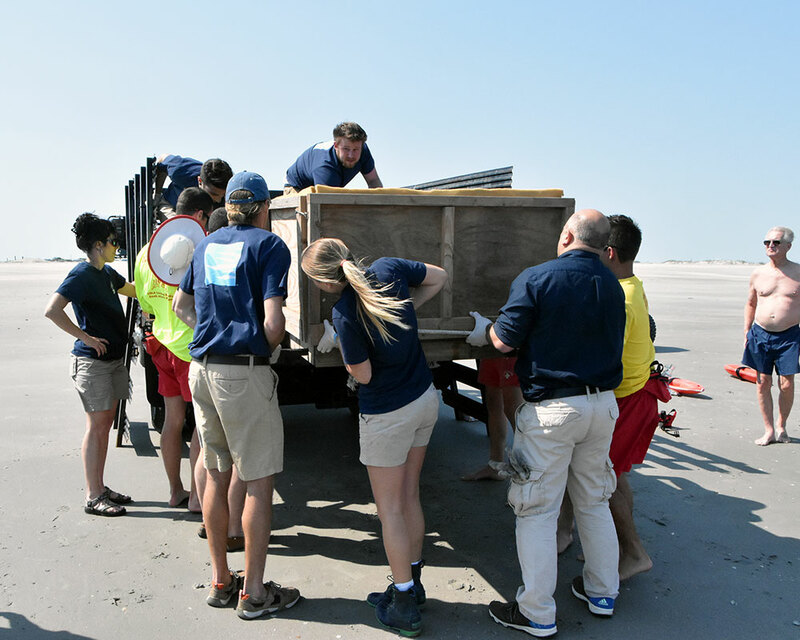 This morning the volunteers and staff got her ready to go, taking loads of photos as memories and writing messages of support on the interior of her wooden crate. 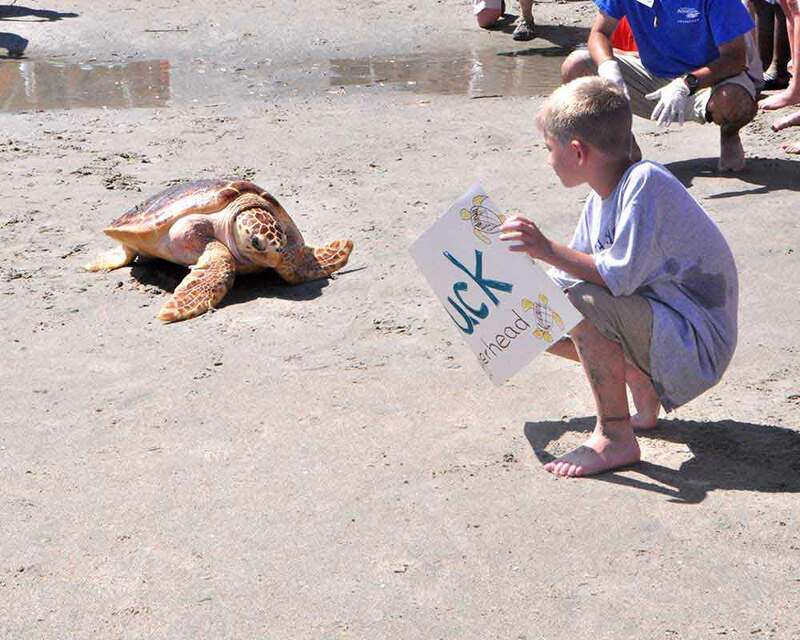 Not sure if she can read but the folks out in California will enjoy the messages. 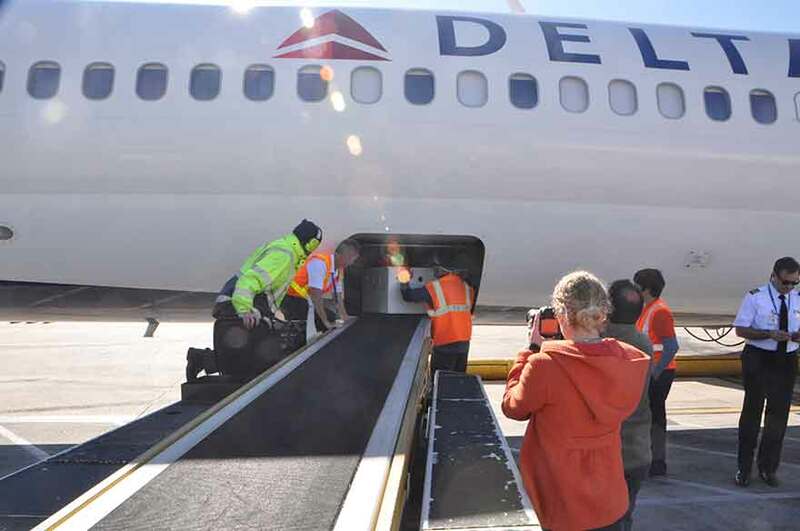 Lots of selfies and photos and then packed up for the trip. 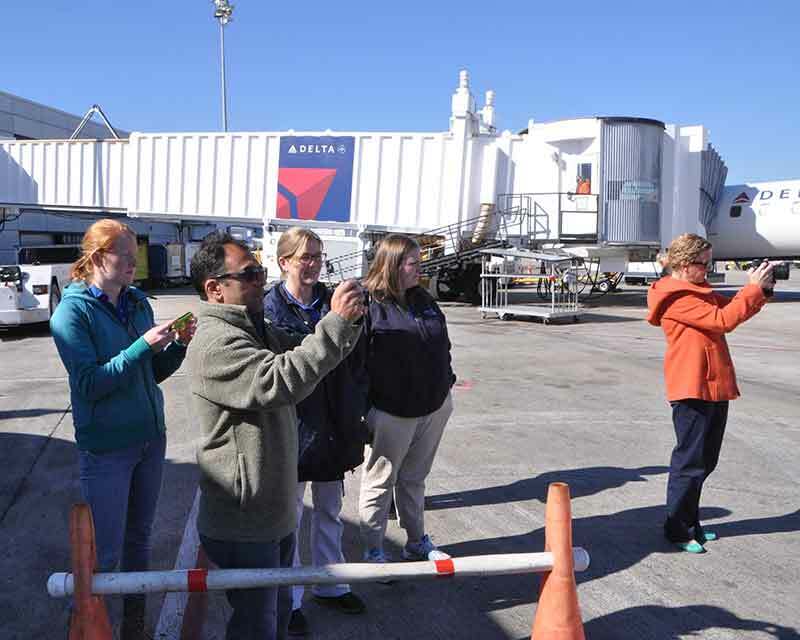 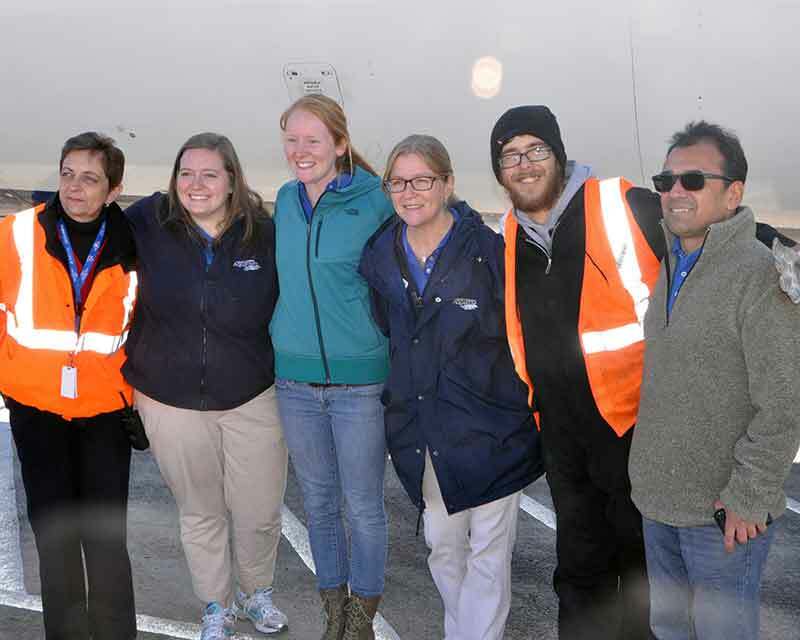 Once we were at the airport the Delta Airline's team gave "Jersey" the VIP treatment. 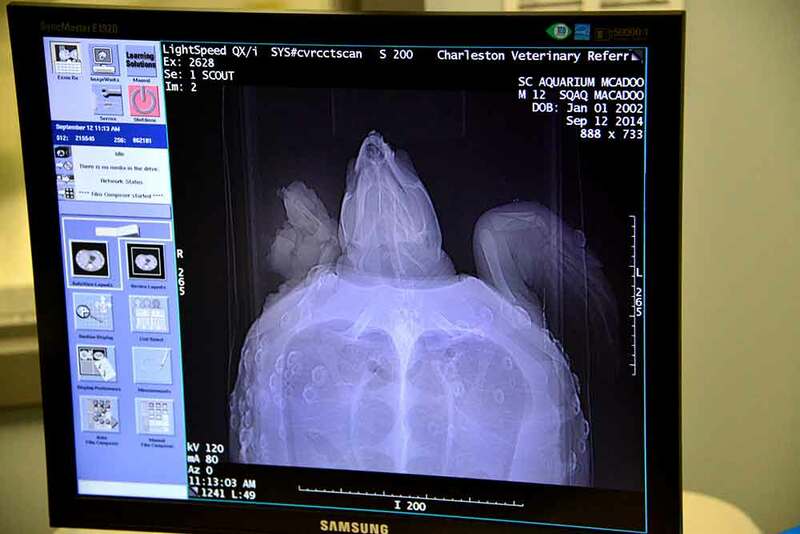 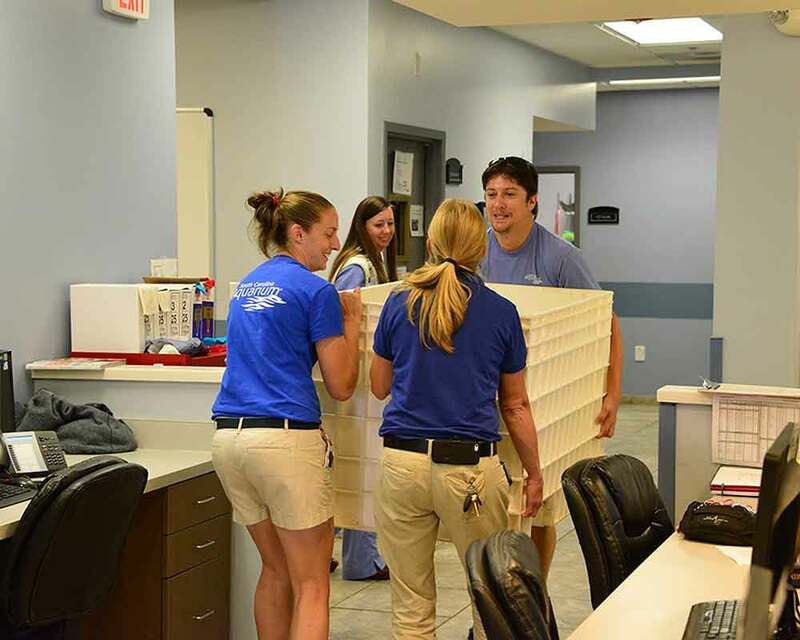 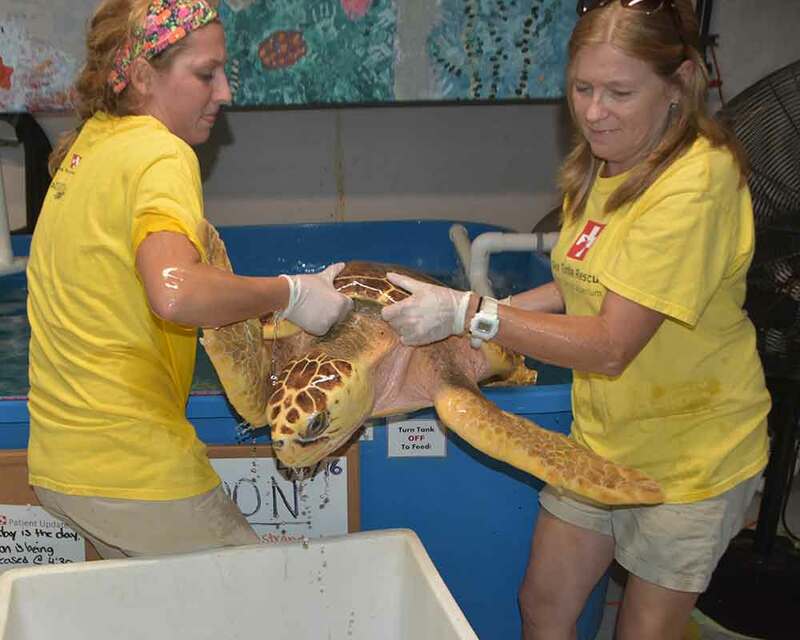 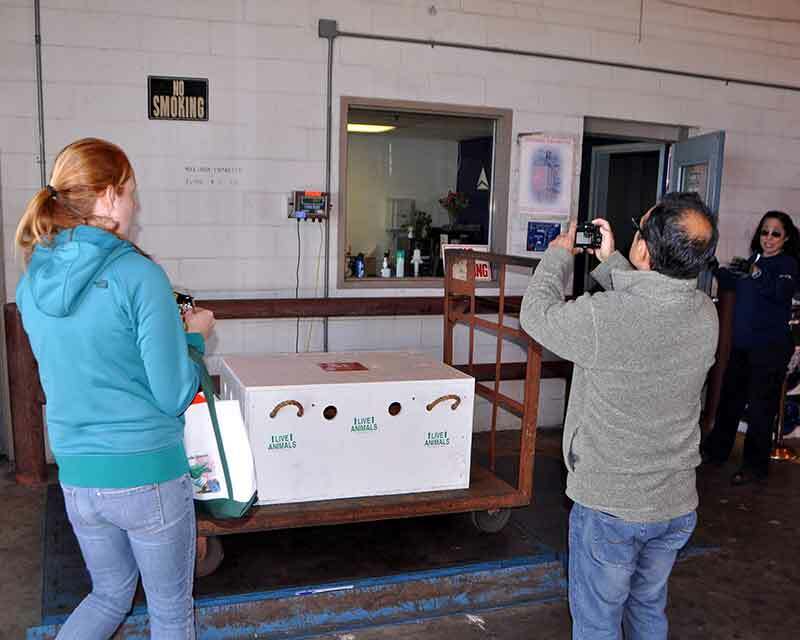 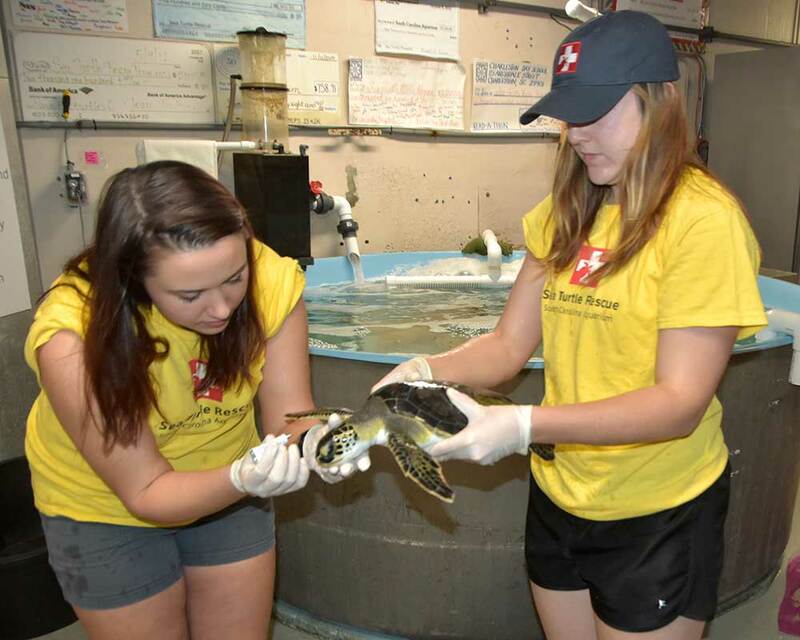 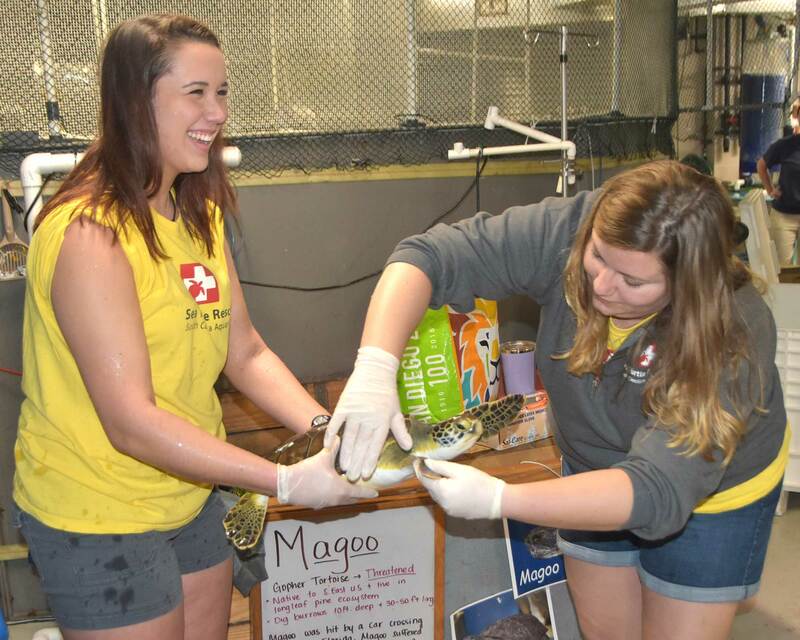 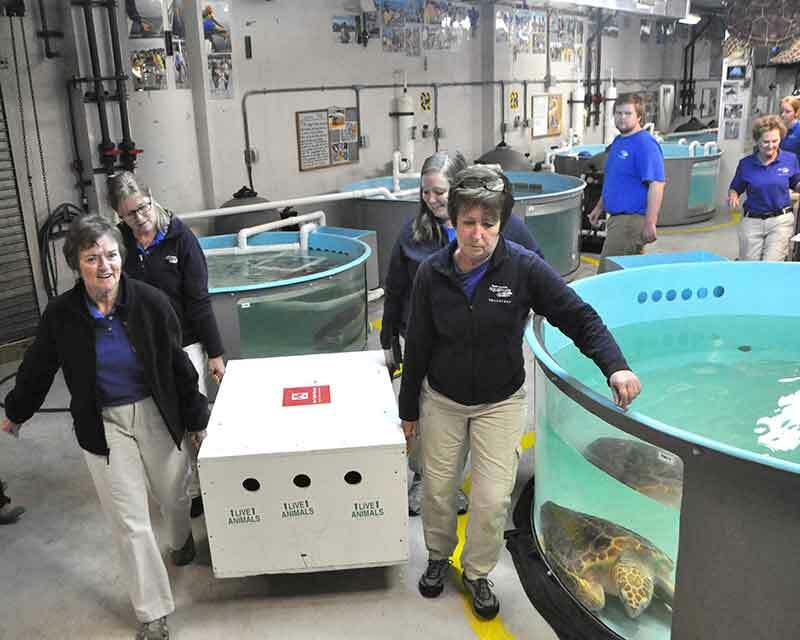 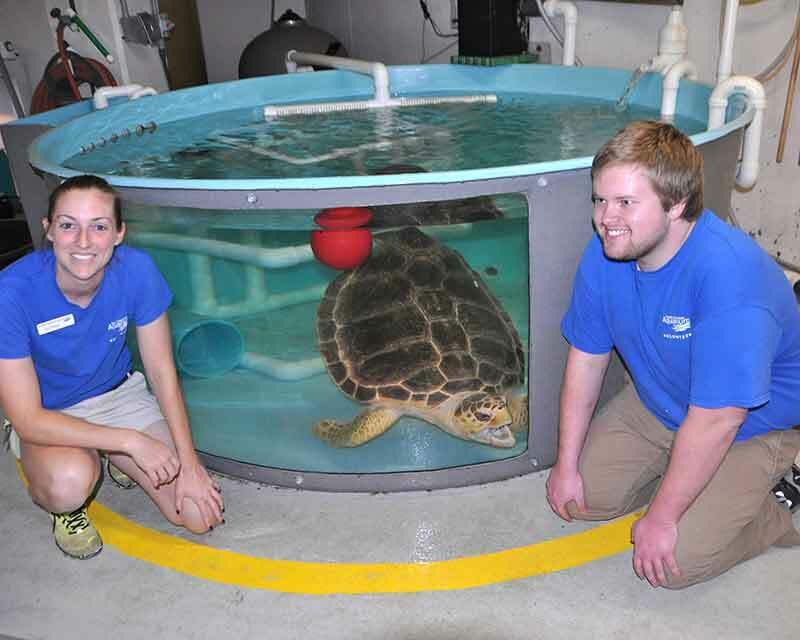 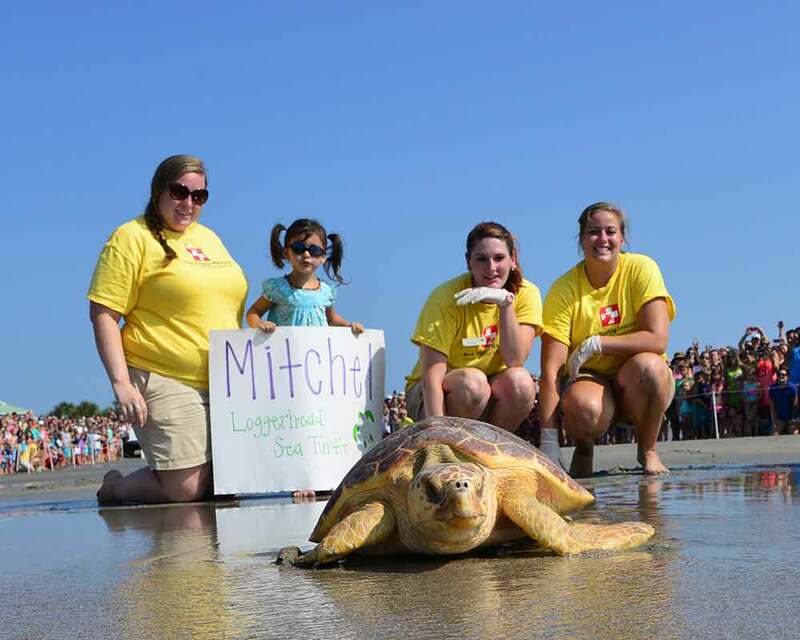 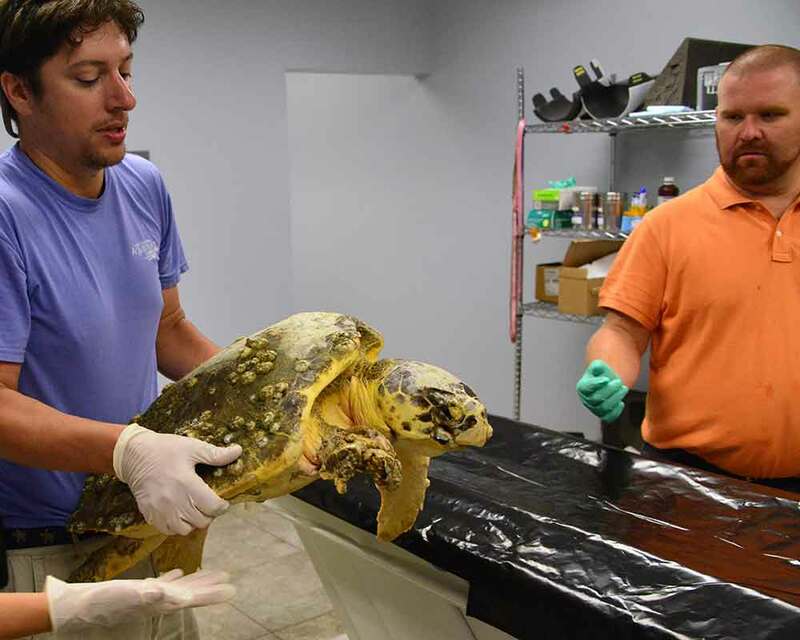 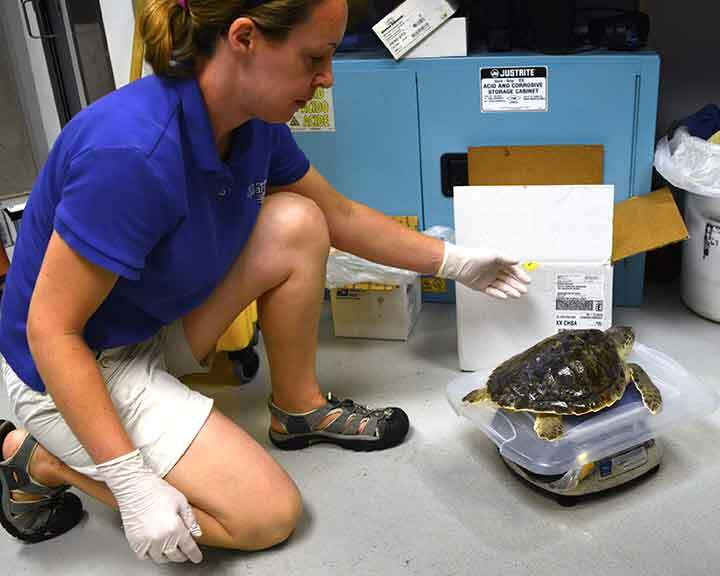 Turtle Hospital staff brought McAdoo and Buck to the Charleston Veterinary Referral Clinic. 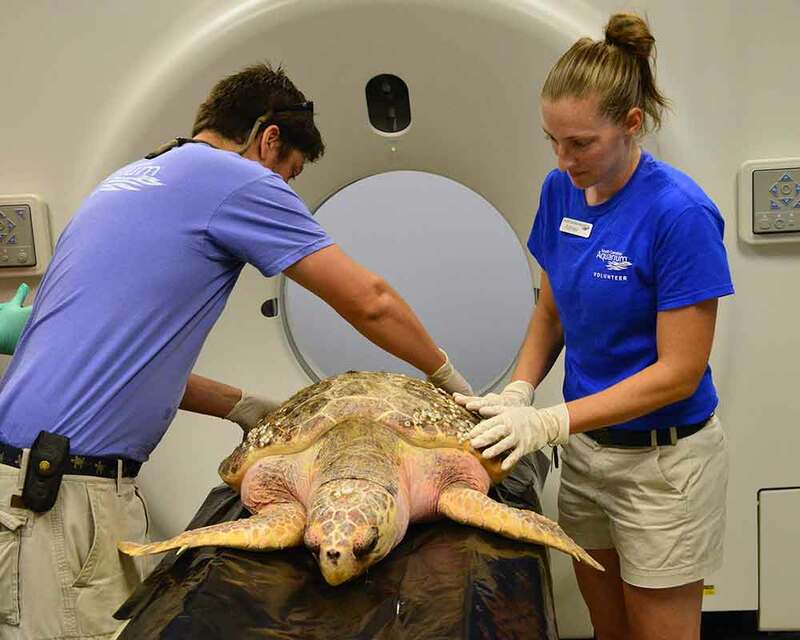 They graciously provided CT scans for these two loggerheads. 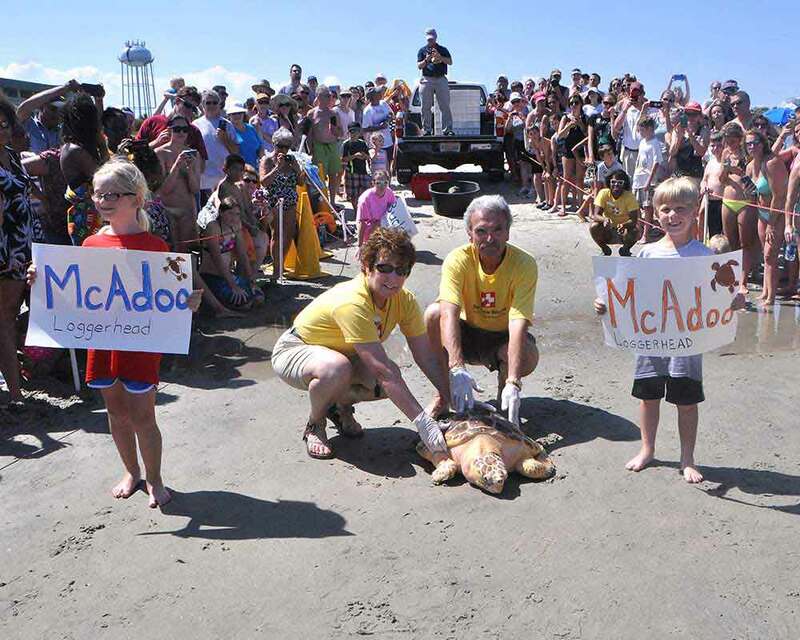 McAdoo is the victim of a boat strike and then a shark. 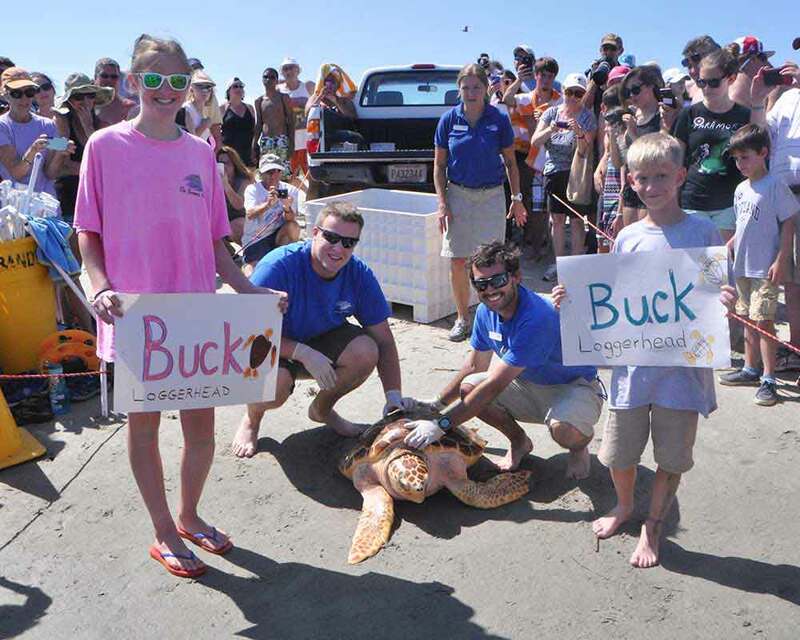 Buck has some neurological problems that affect his ability to swim. 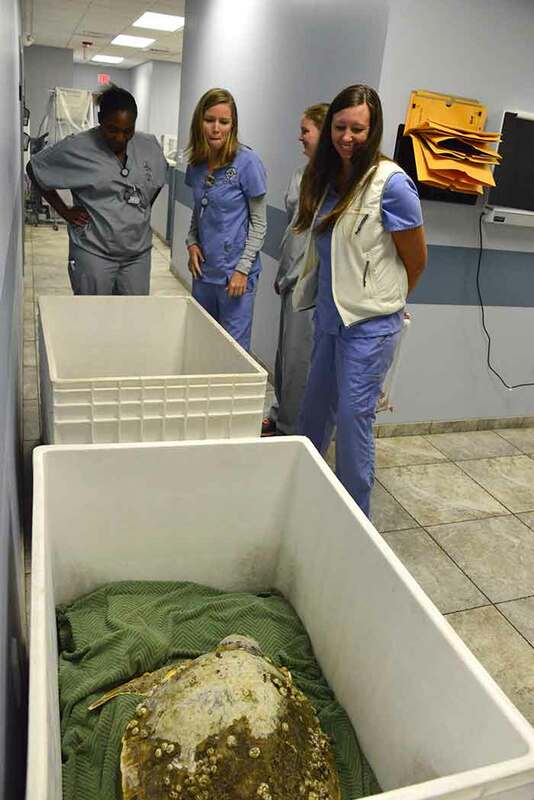 Having this partnership with the clinic in invaluable in terms of the turtle's care. 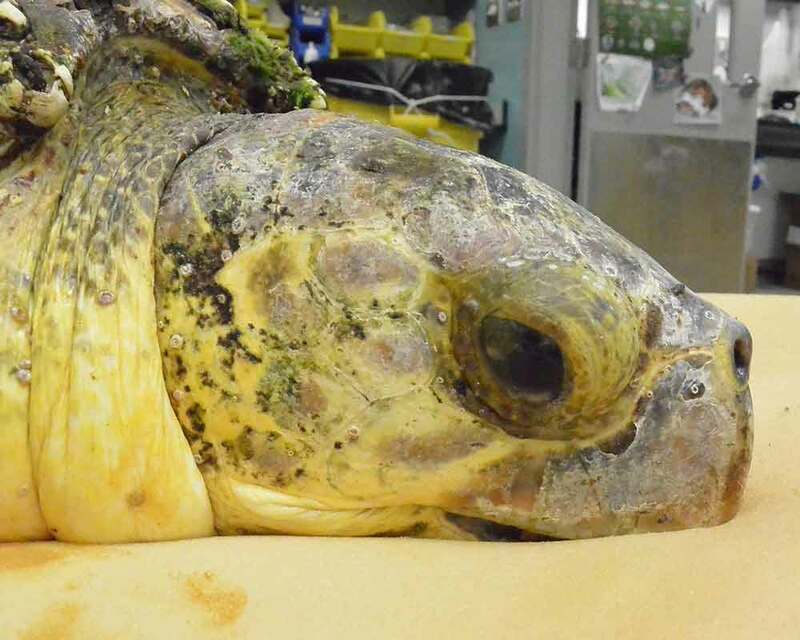 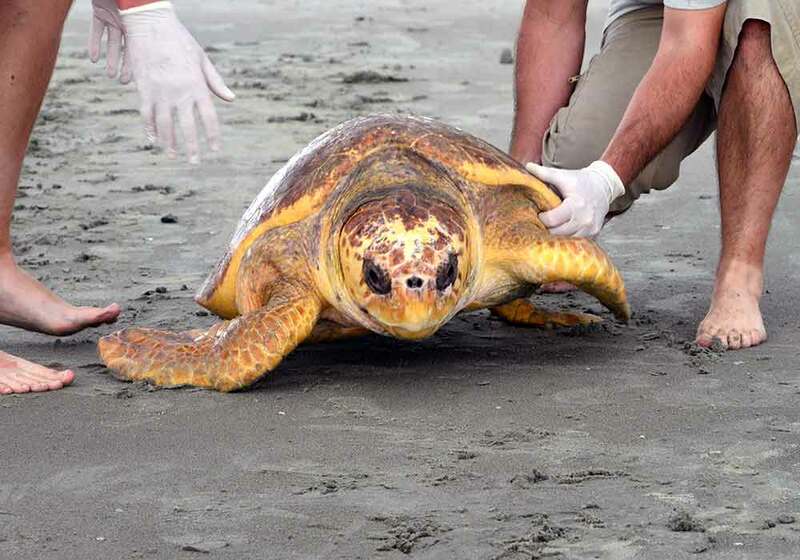 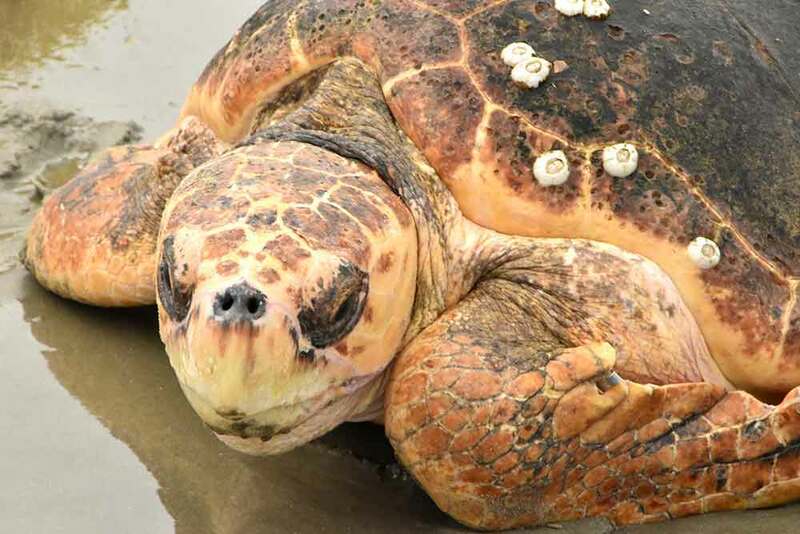 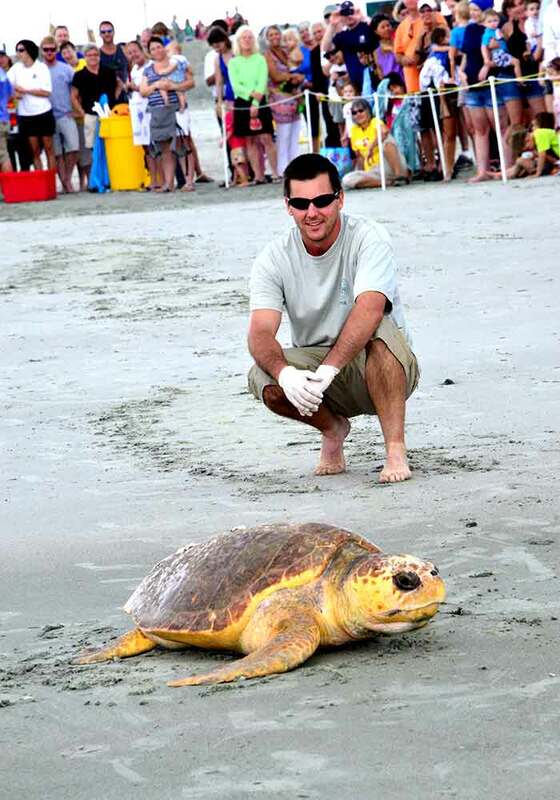 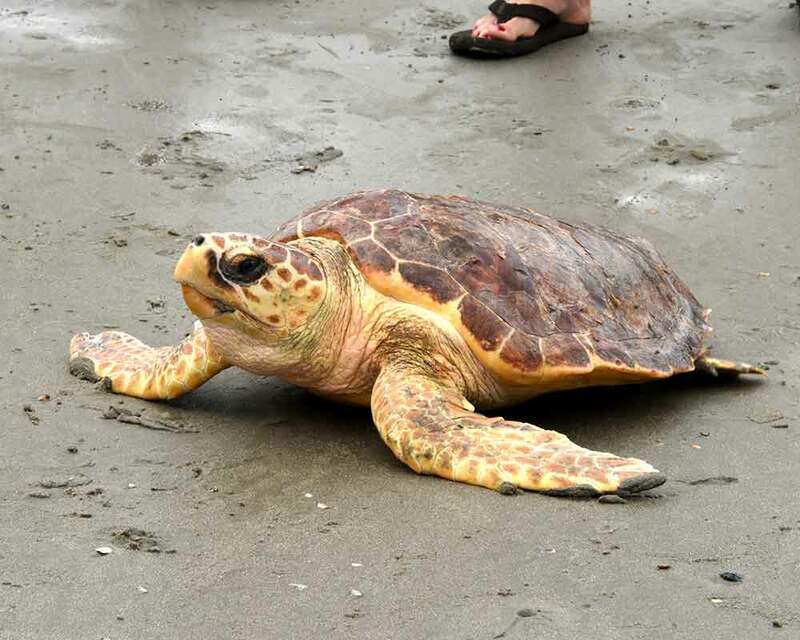 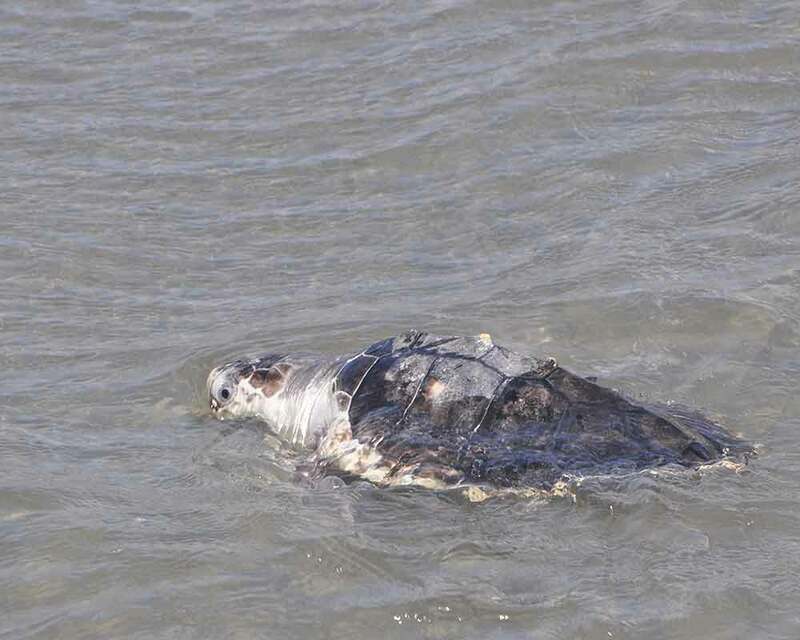 The currents washed this large, severely debilitated loggerhead ashore in North Myrtle Beach Monday morning. 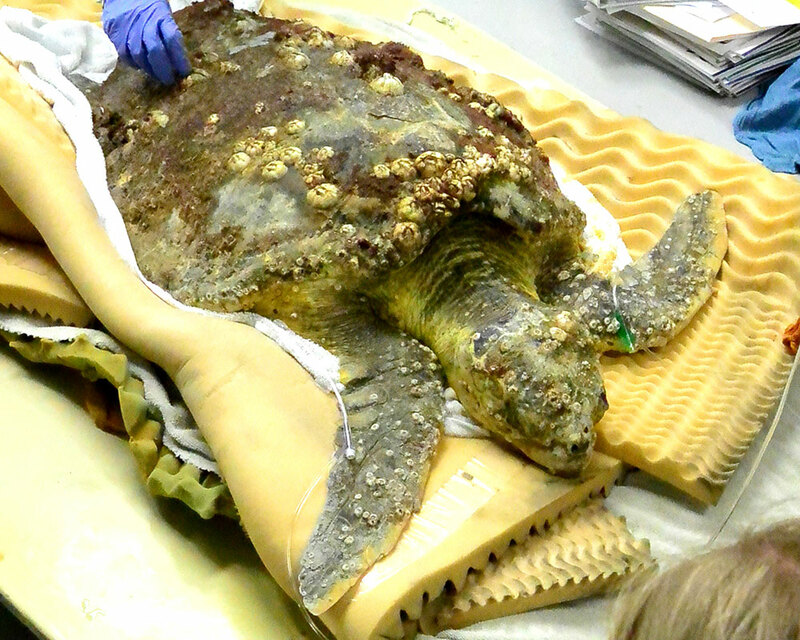 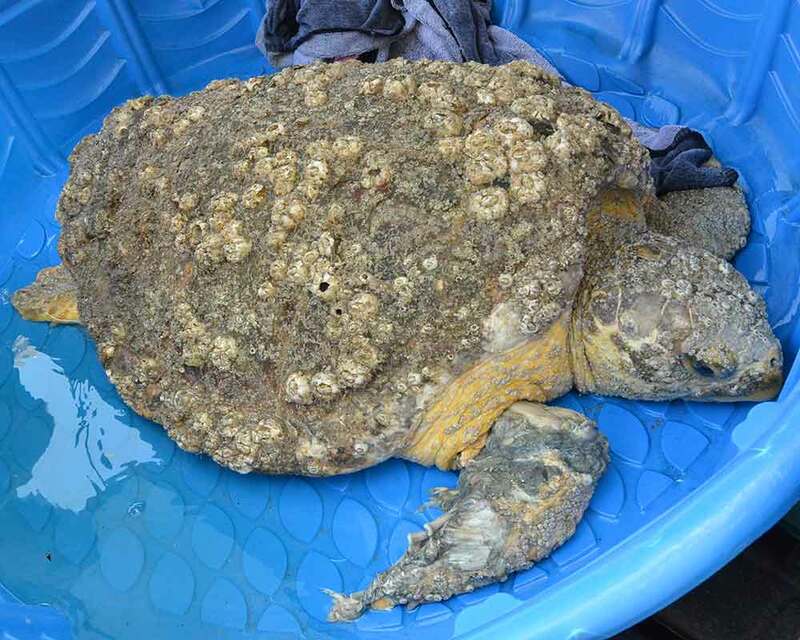 Covered with epibionts like barnacles and sea lettuce, it was obvious this emaciated turtle had been struggling and ill for quite some time. 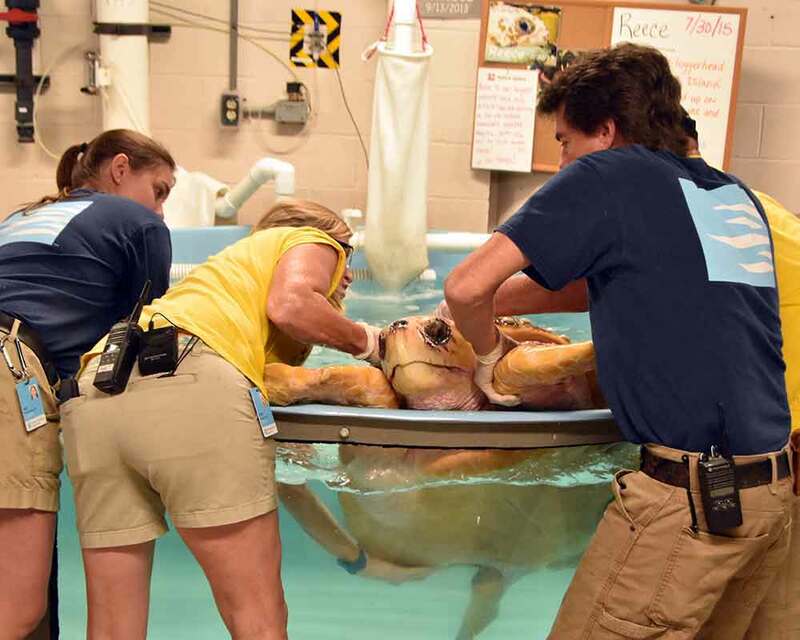 He was in such poor condition that it was impossible to tell if he was still alive without physically touching him to check for a response. 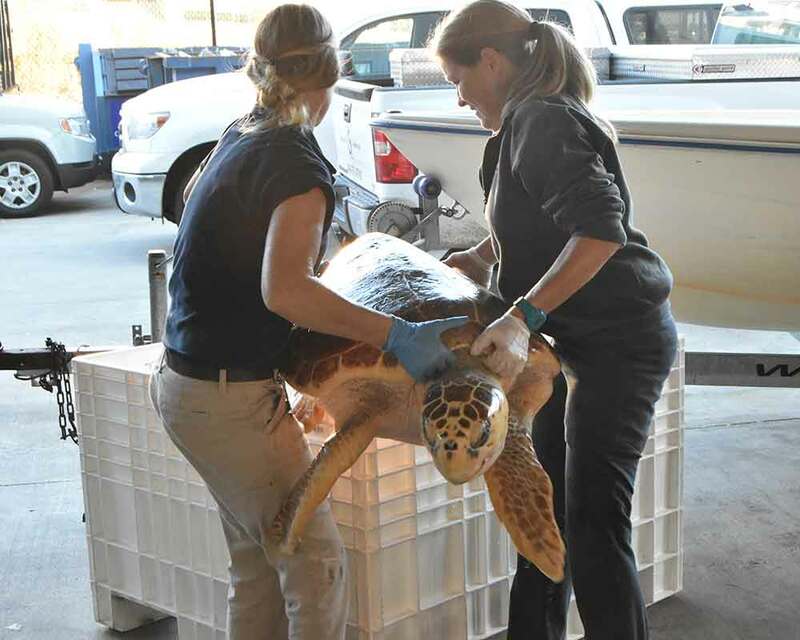 SCDNR transported this sub-adult to our Sea Turtle Hospital, where he received immediate treatment from our veterinarian and turtle crew. 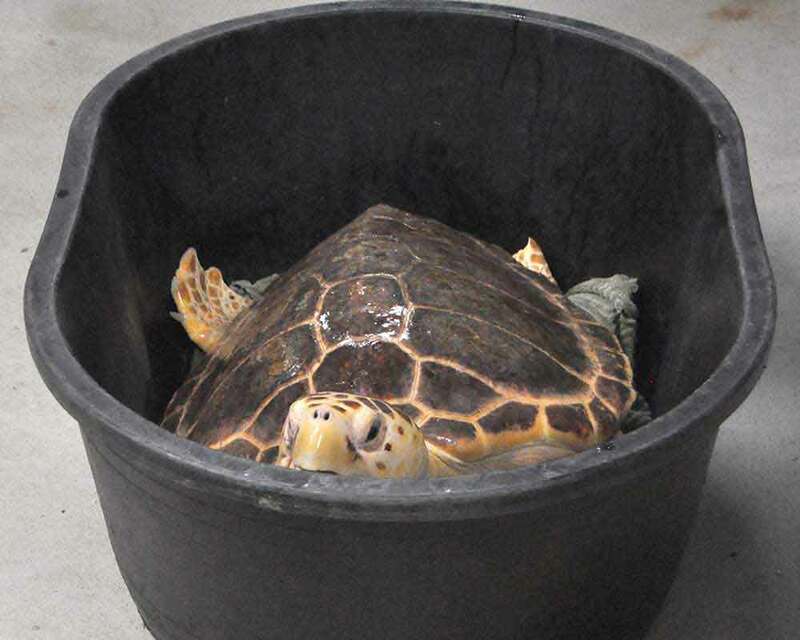 Shortly after her admittance, we noticed Briar had a hard time with depth perception and was coming up short when biting at her food. 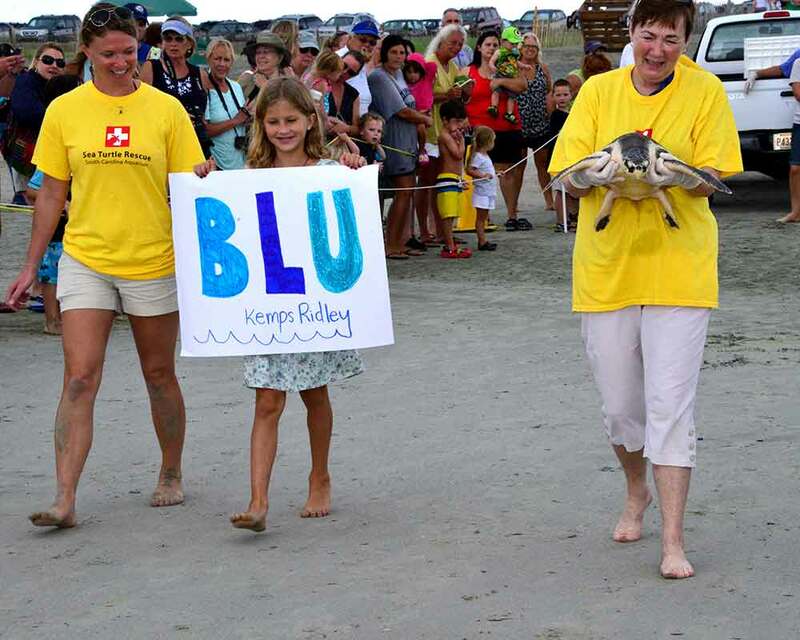 This seemed to improve by mid-summer with Briar easily catching live blue crabs. 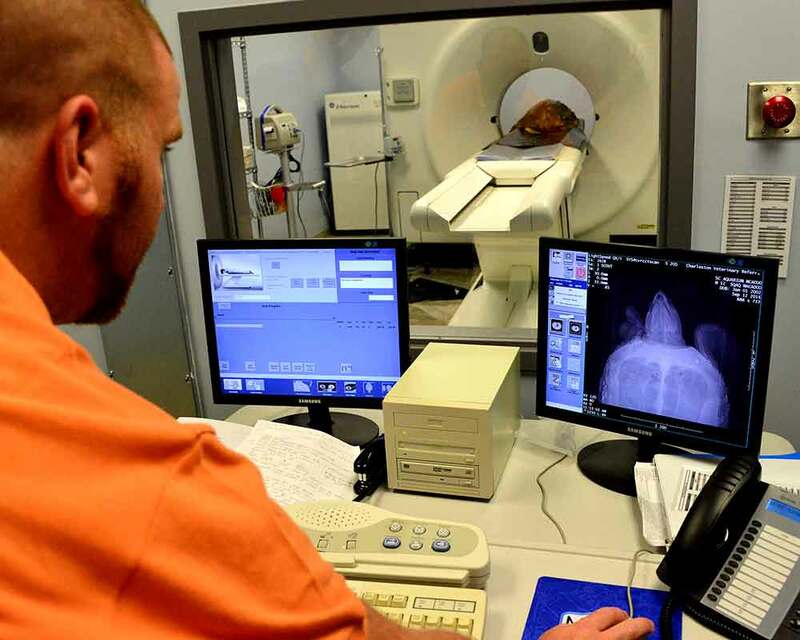 Over the past couple of months, however, the issue has become more apparent. 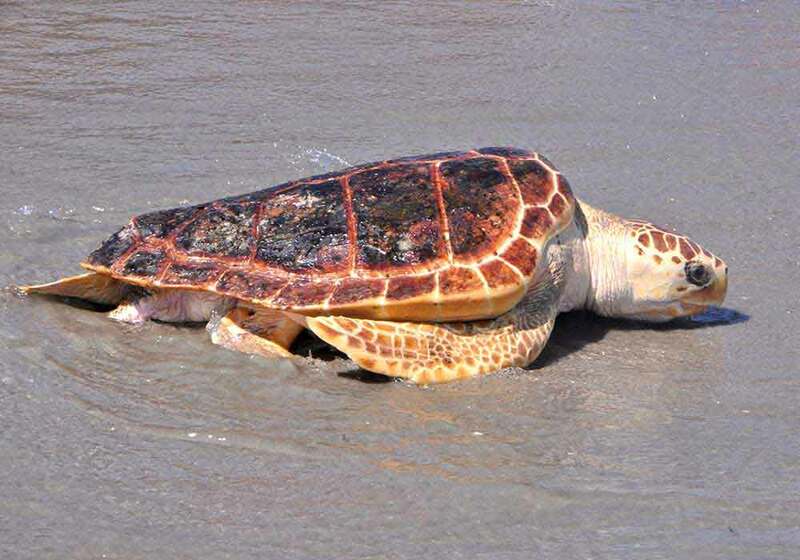 April 25th, to remedy the opaqueness afflicting both eyes and negatively affecting this turtles ability to hunt and capture live prey. 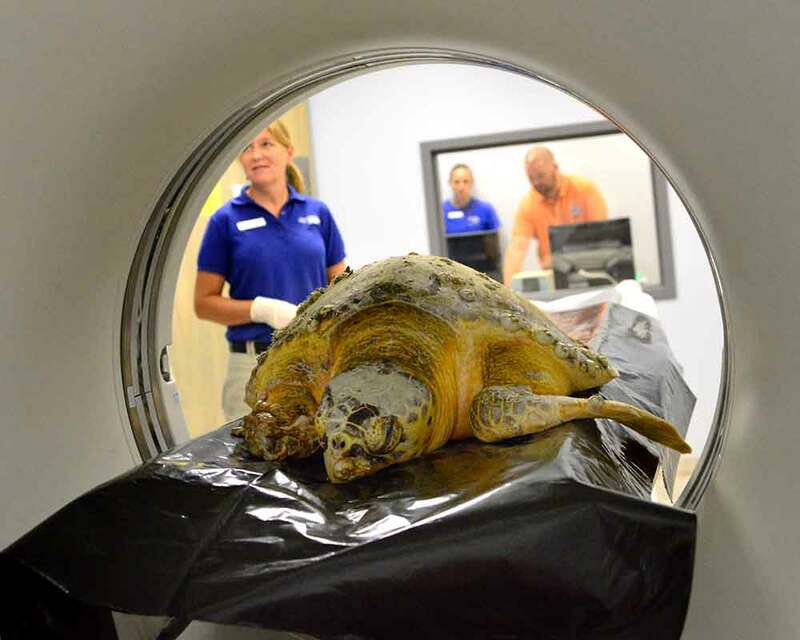 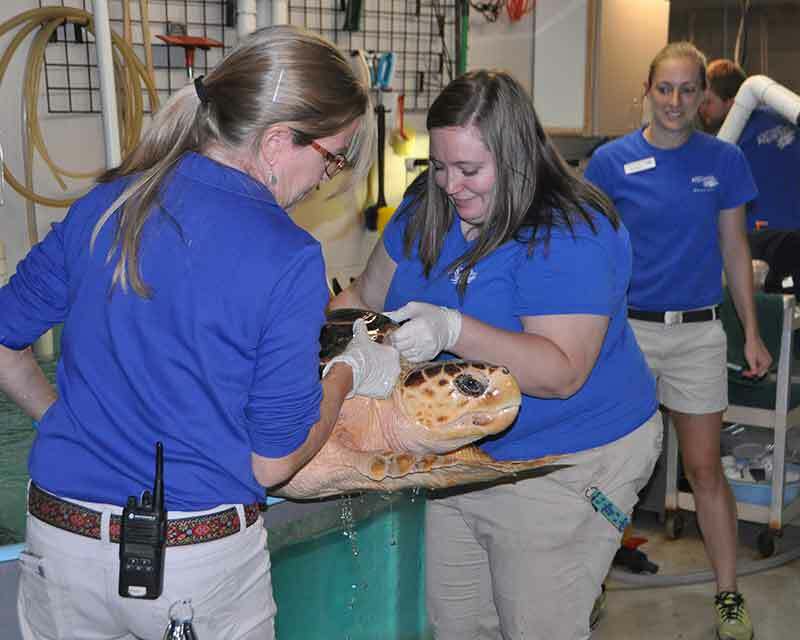 Dr. Anne Cooke, a local veterinary ophthalmologist, and her staff donated their time and resources to perform the surgery free of charge; this was an amazing donation to help this big loggerhead return to the wild! 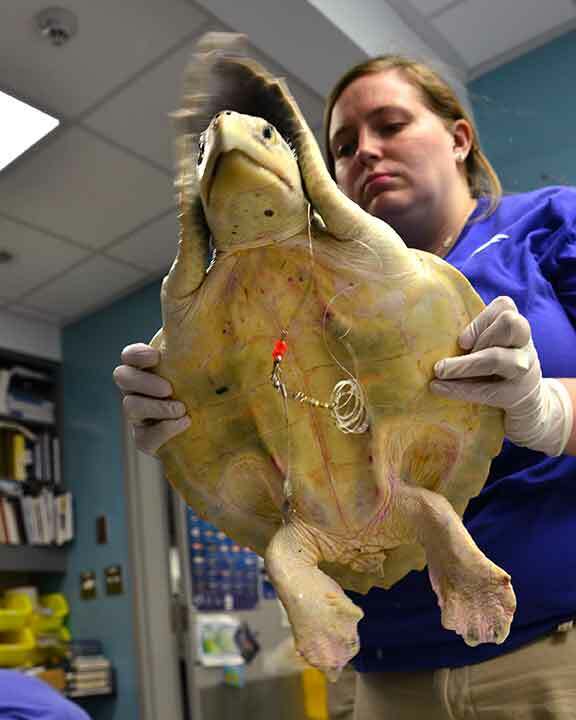 While the surgical process was essentially the same as that humans undergo, artificial lenses were not implanted (or even possible) as they would be in a human patient. 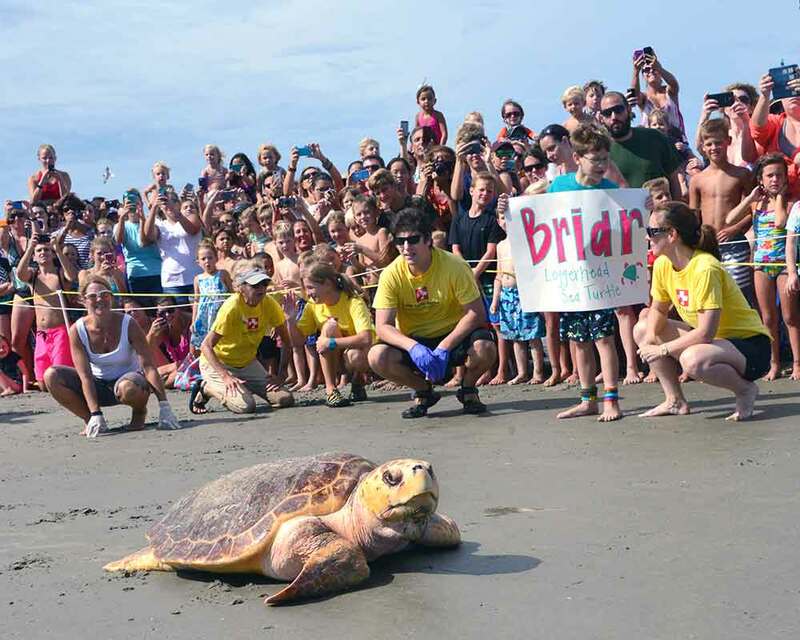 Despite this, Briars vision is now much better than it was before the surgery. 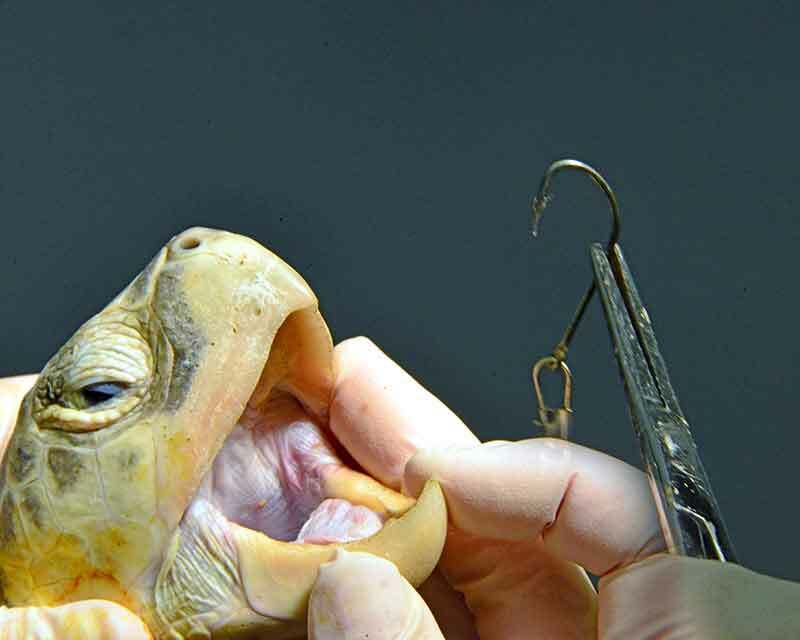 Dr. Cooke removed the sutures from the cornea. 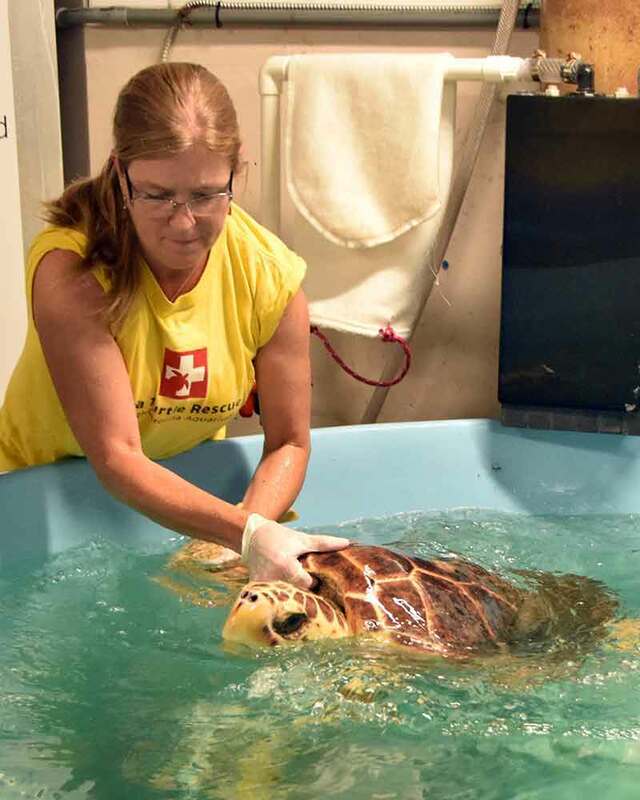 Currently (5 weeks post-surgery), Dr. Cooke and Dr. Boylan, are both very satisfied with how well Briars eyes have healed and consider the surgery a complete success. 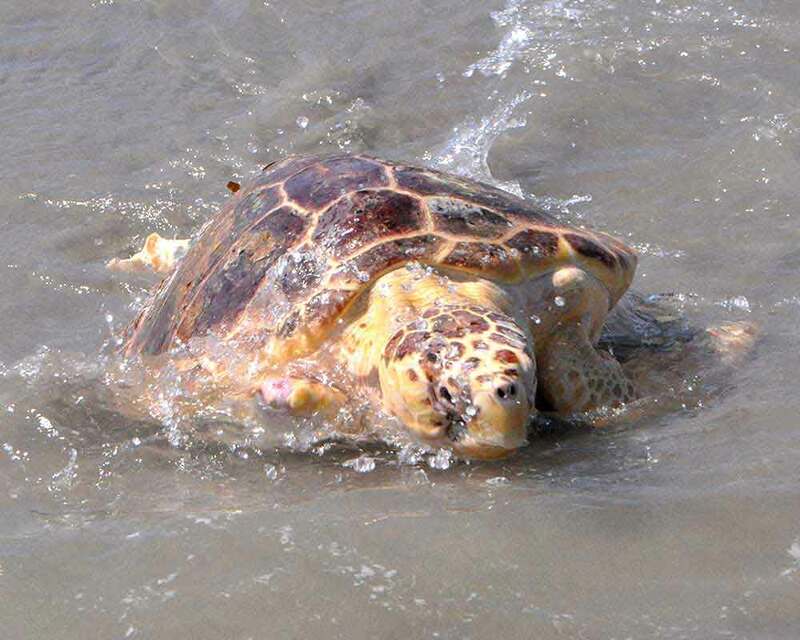 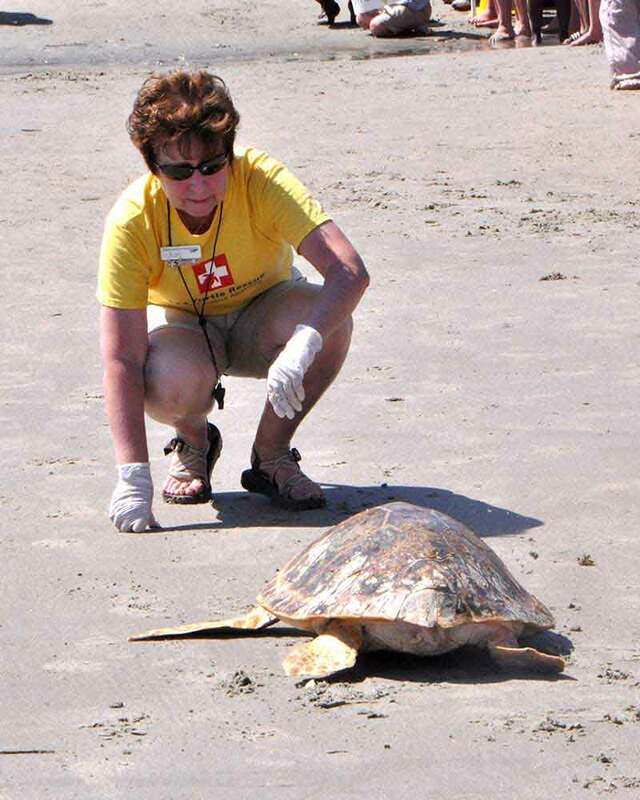 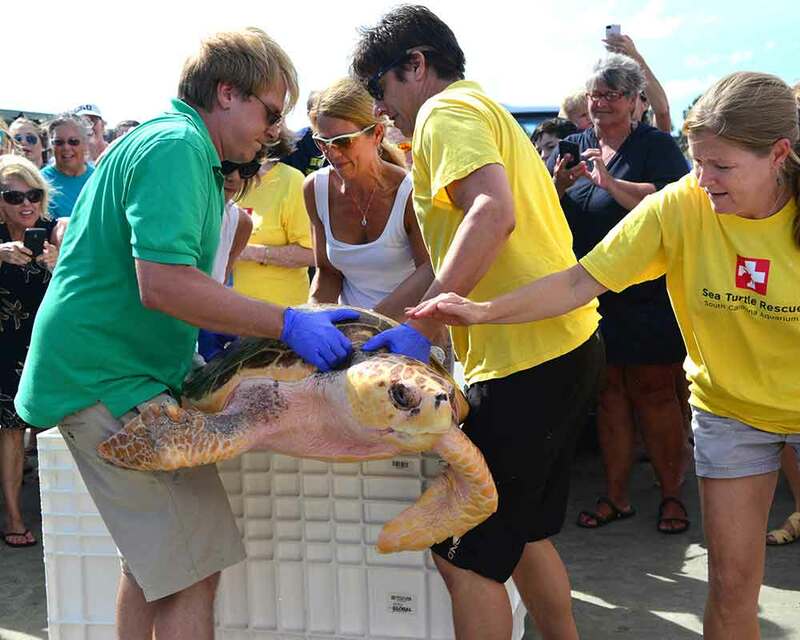 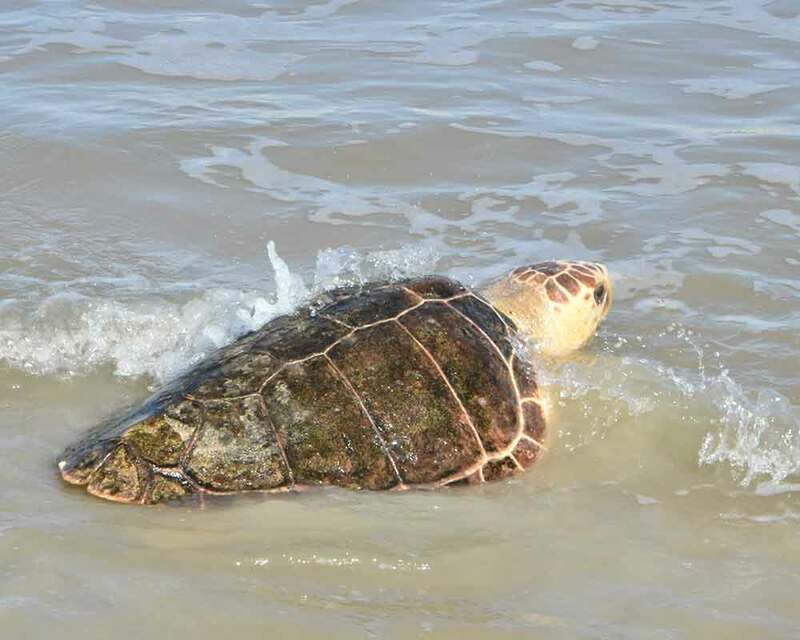 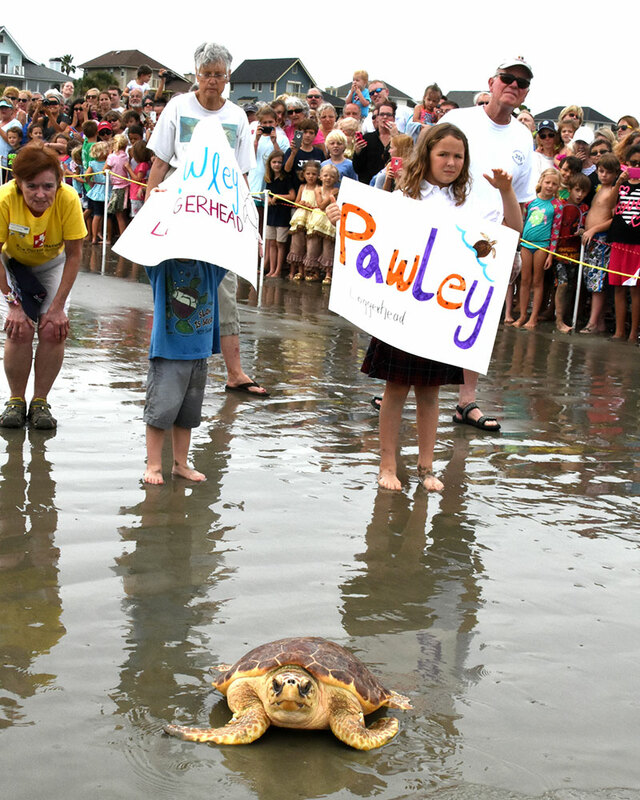 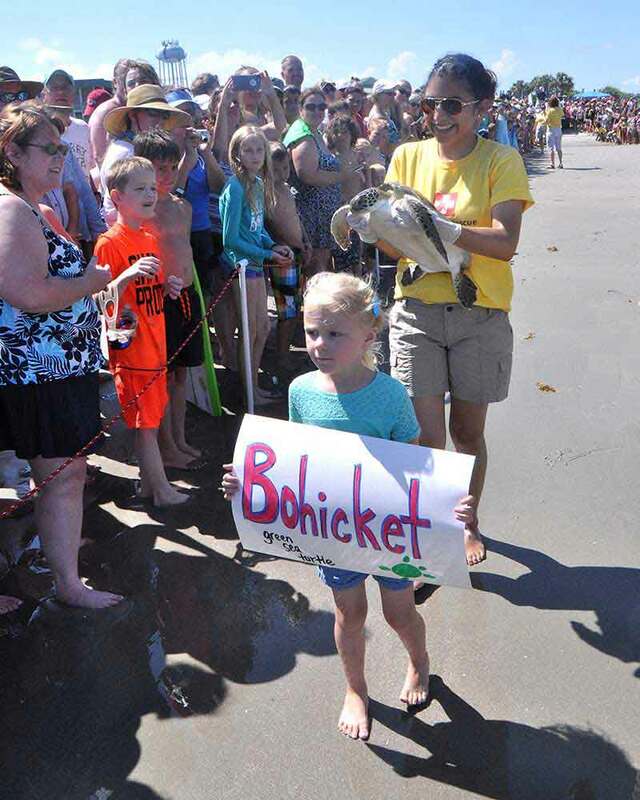 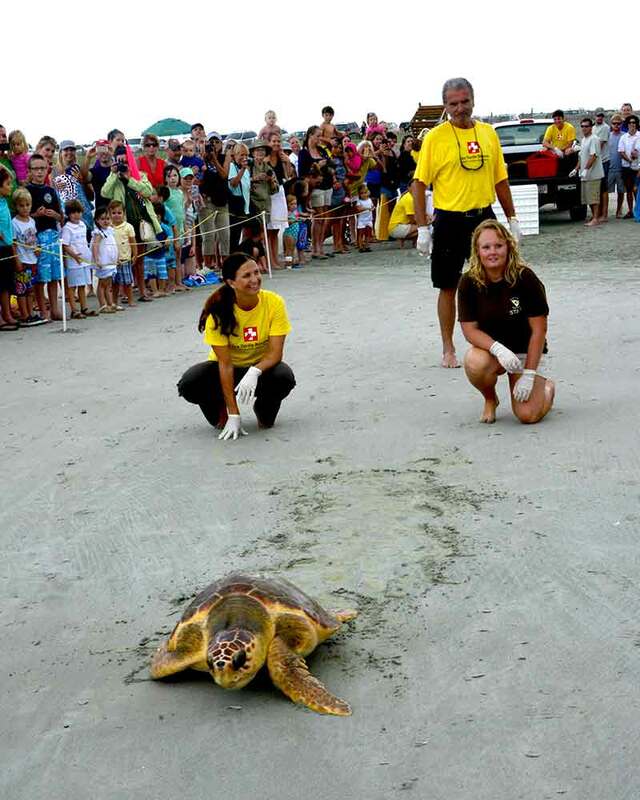 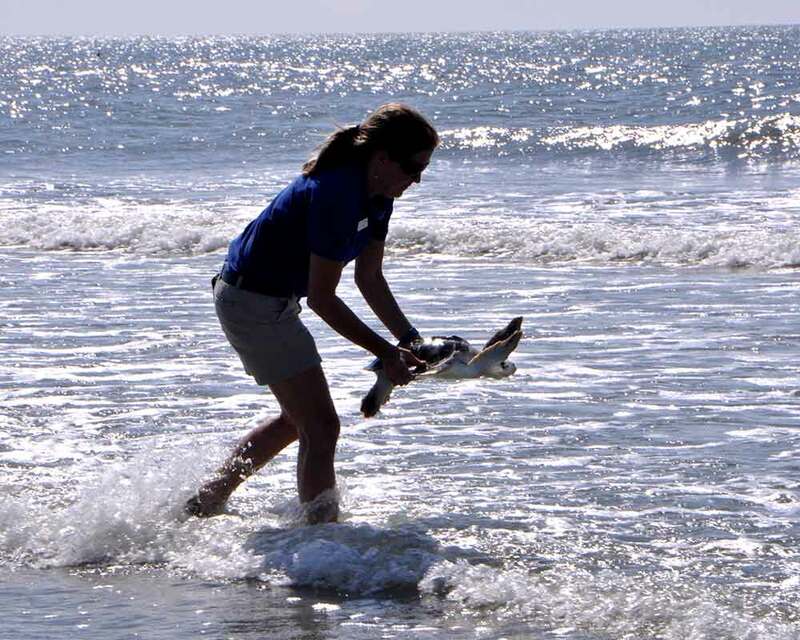 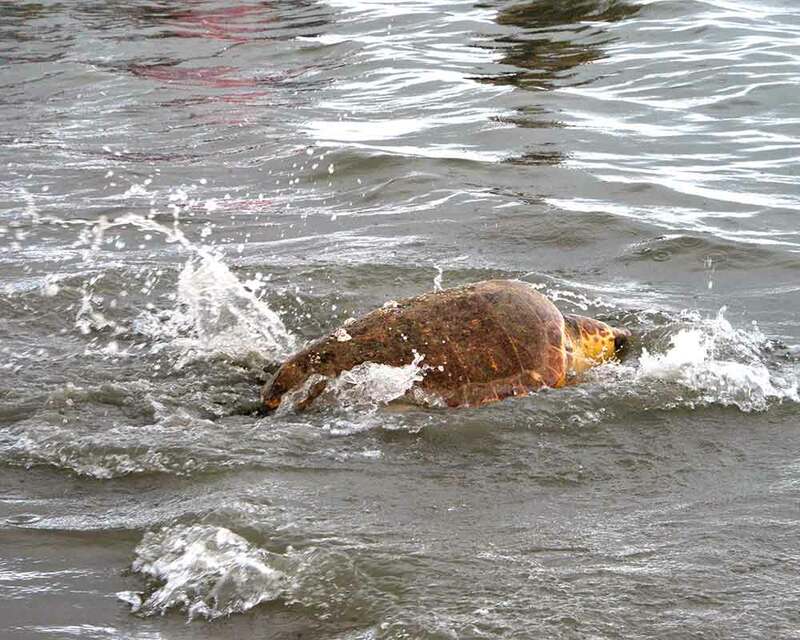 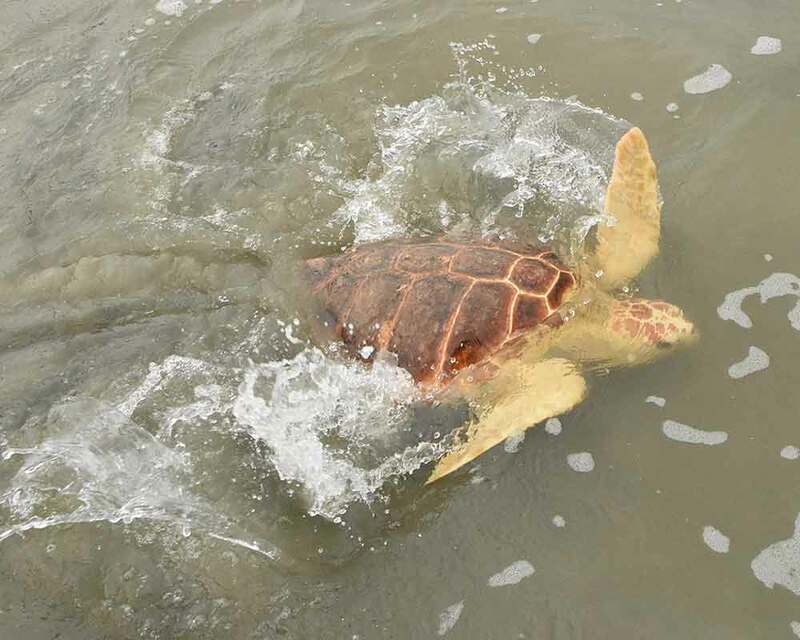 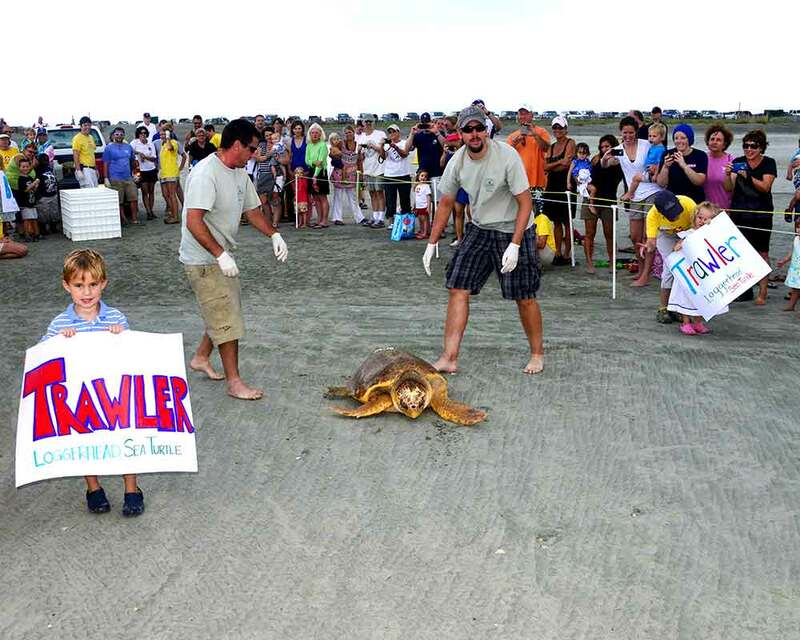 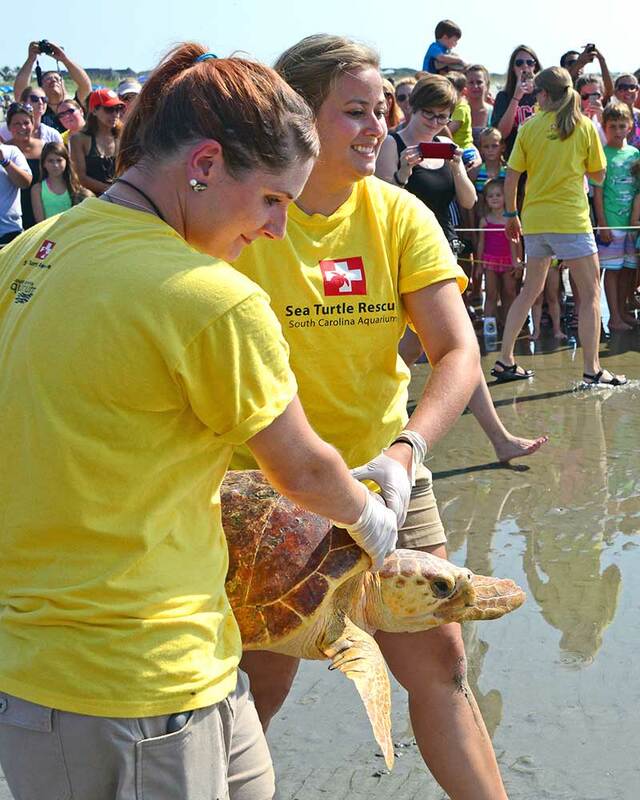 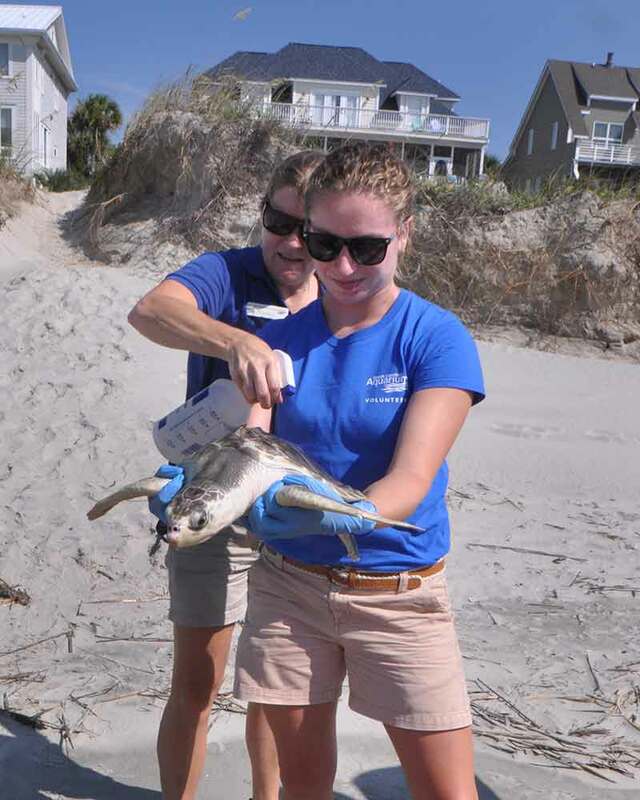 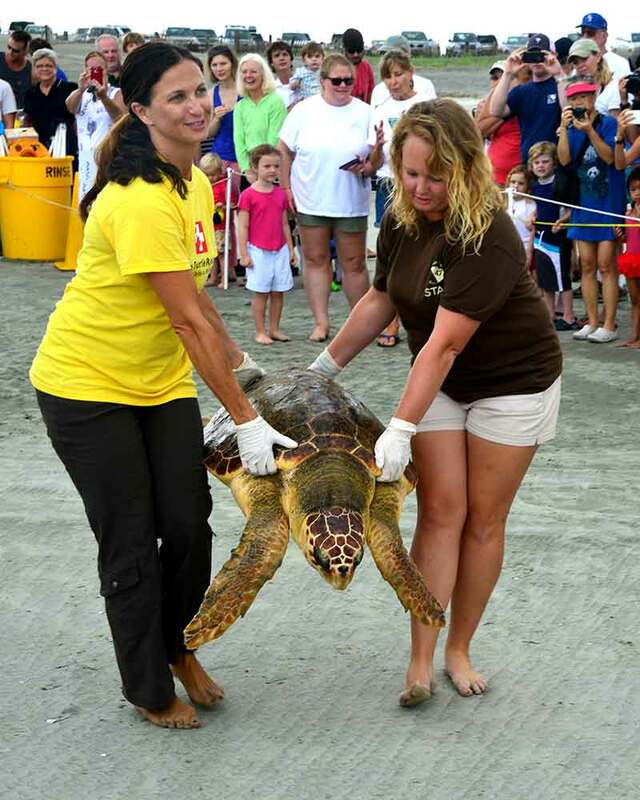 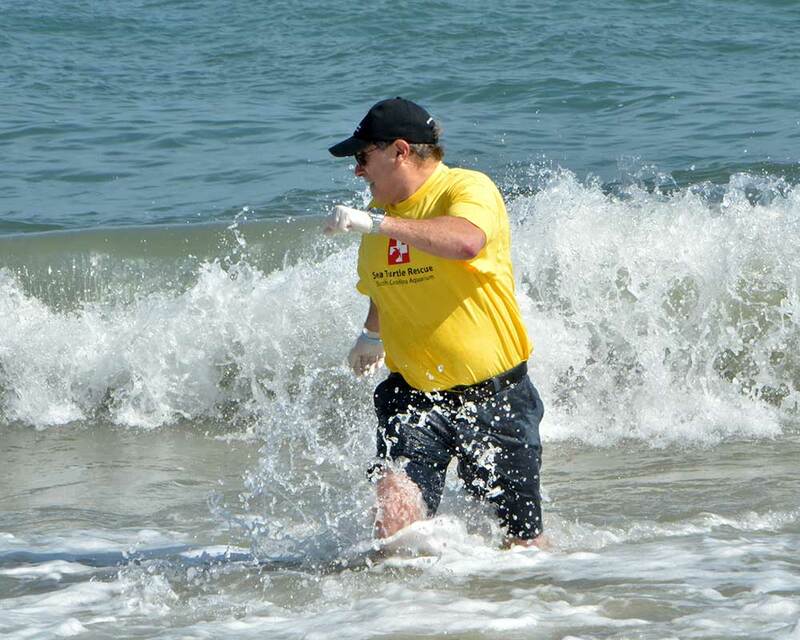 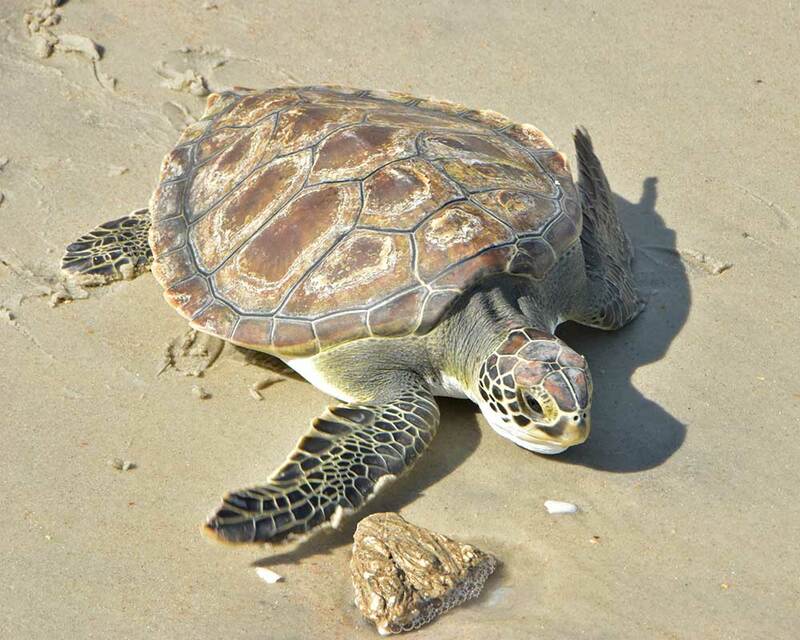 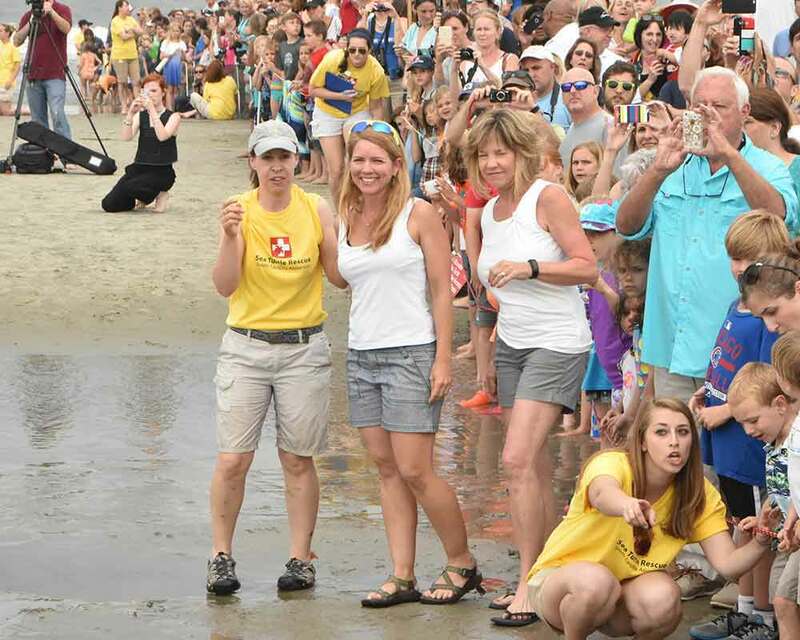 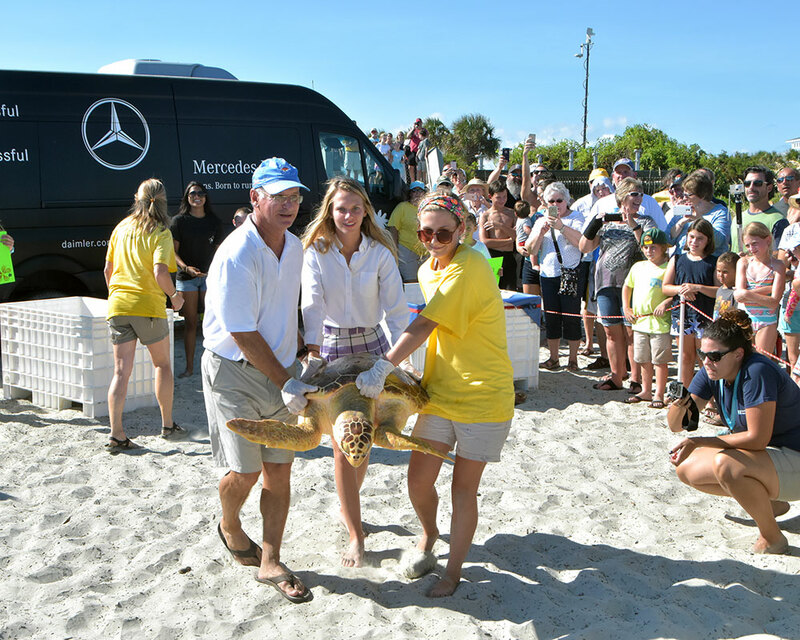 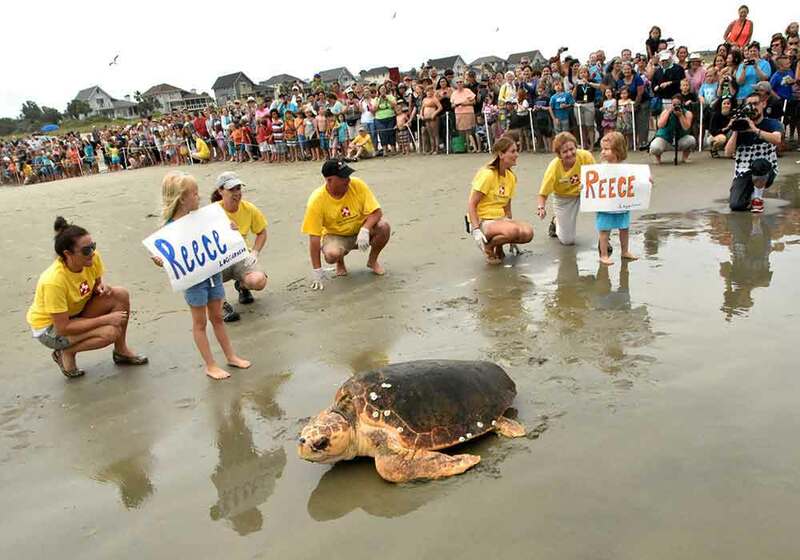 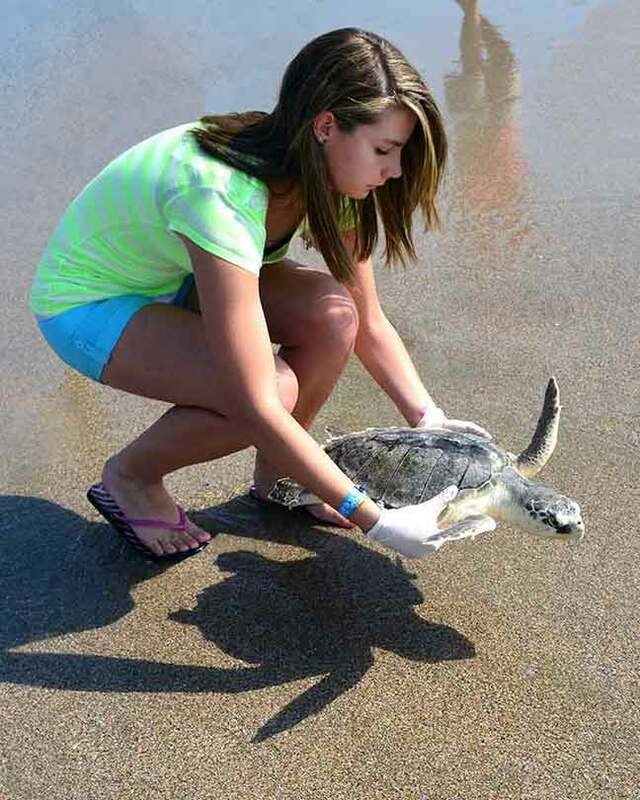 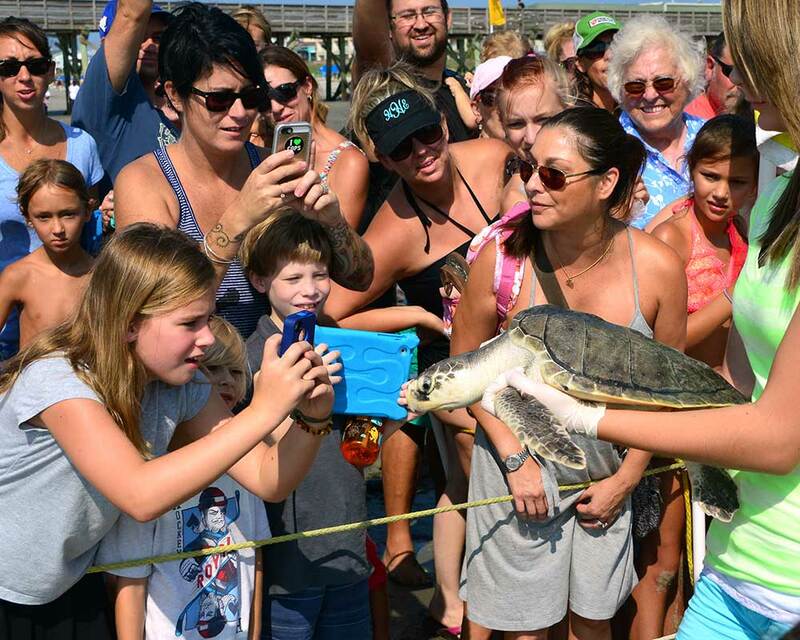 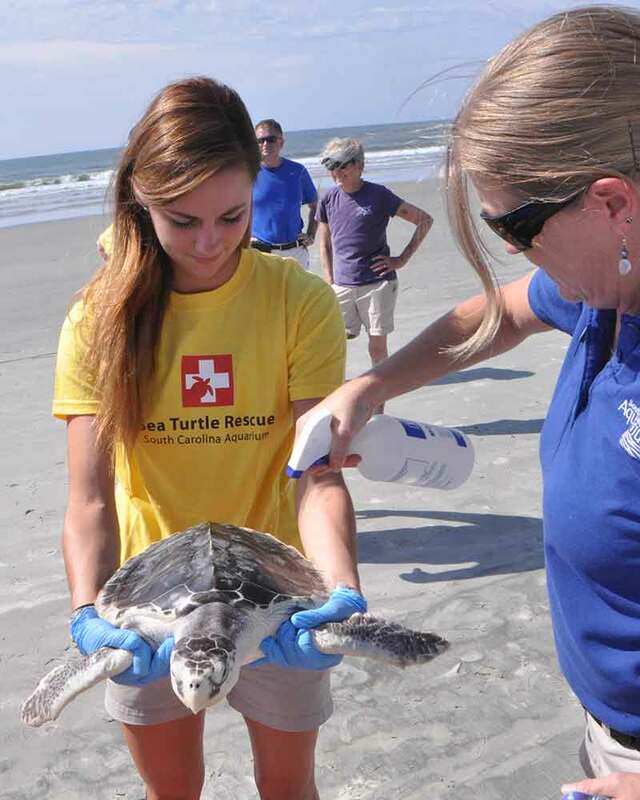 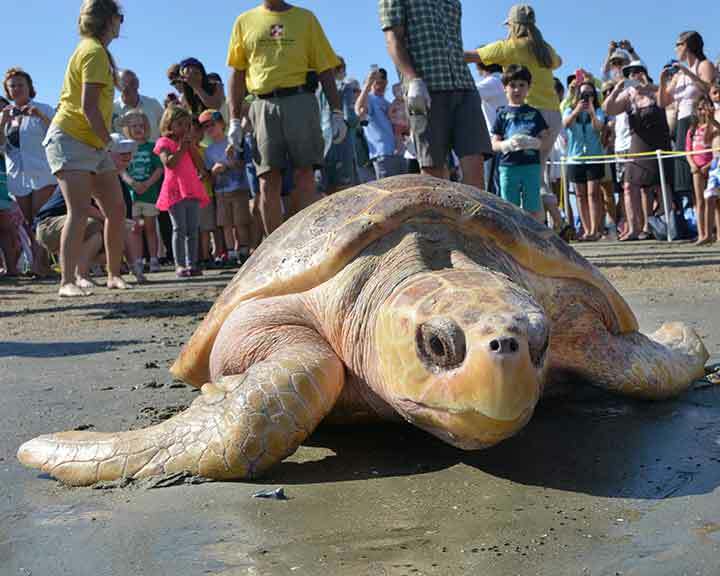 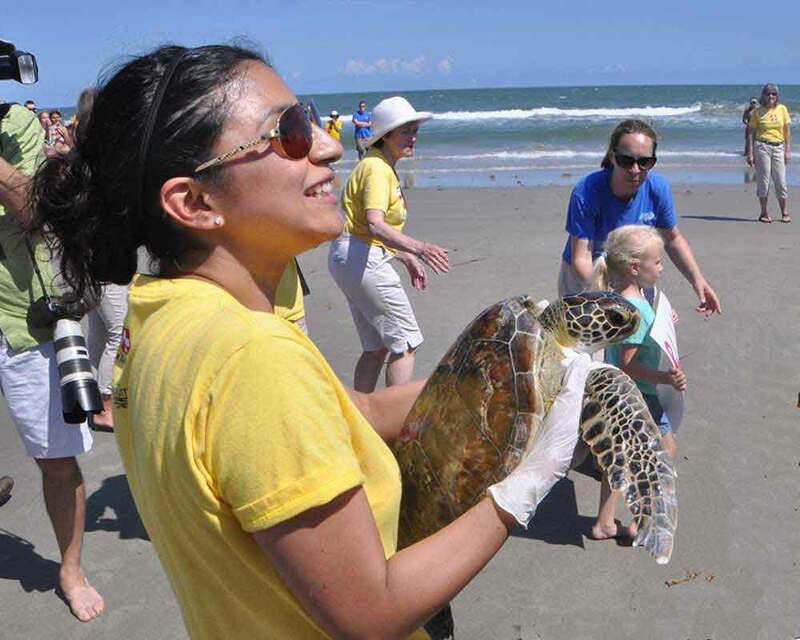 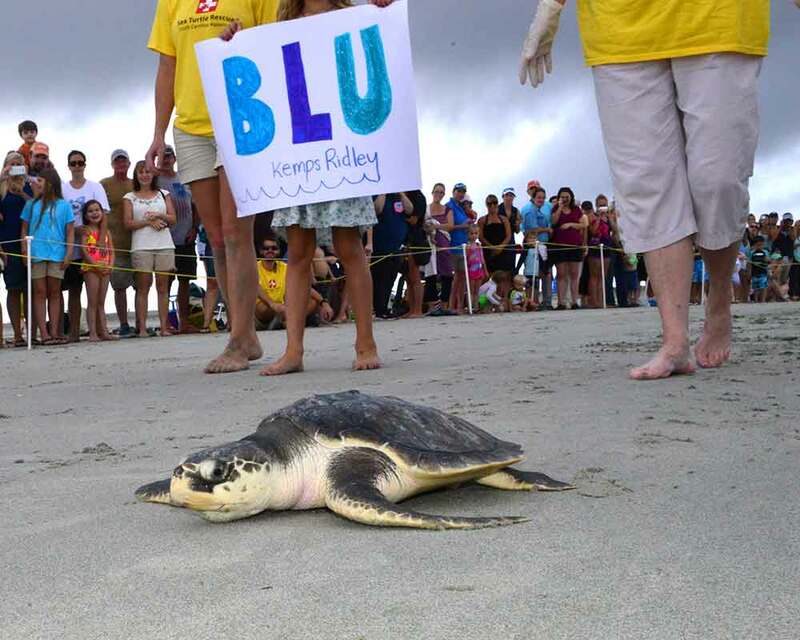 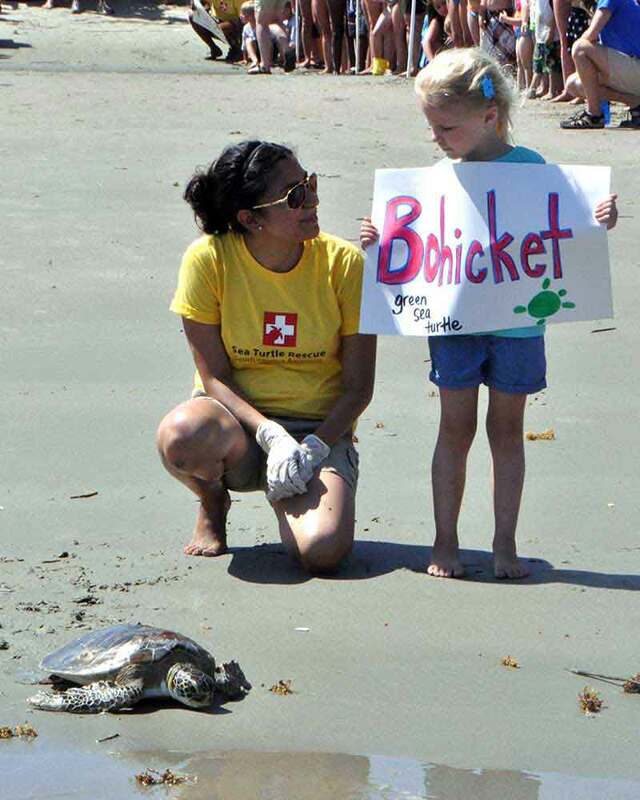 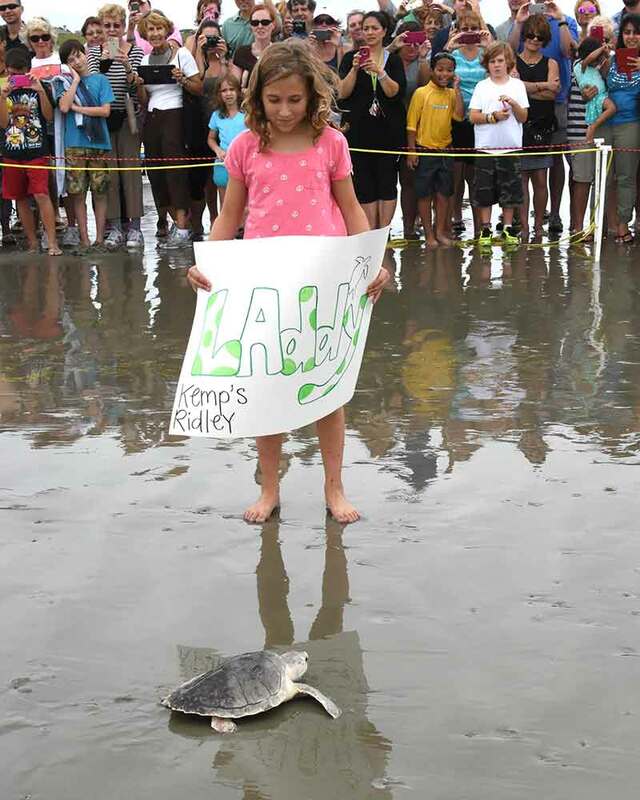 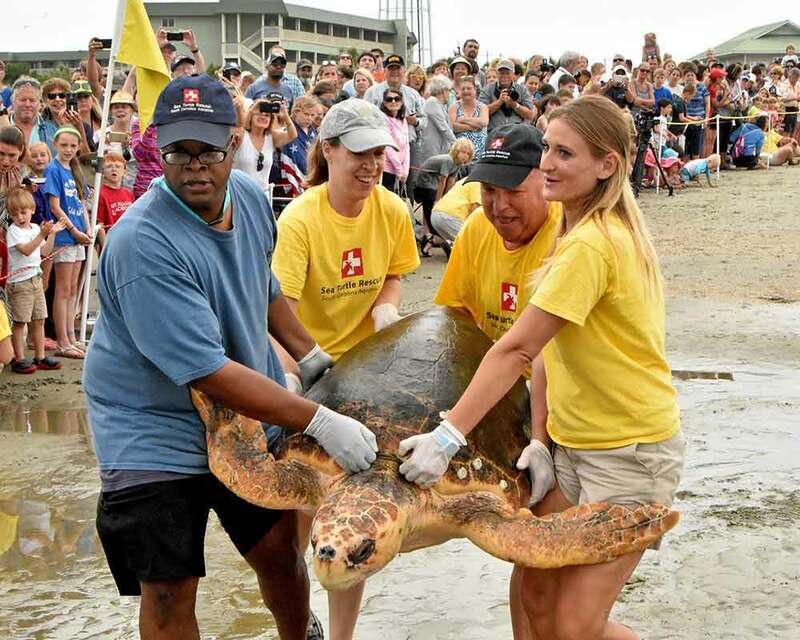 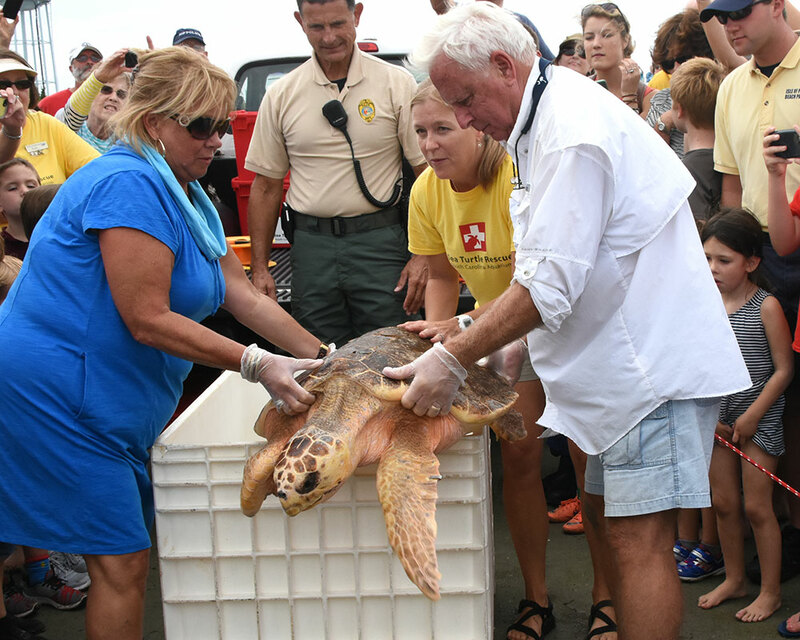 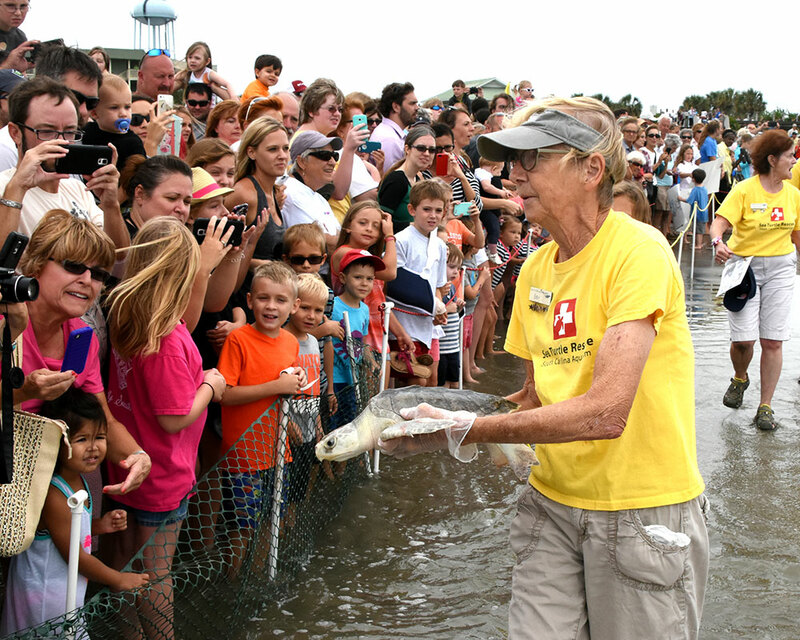 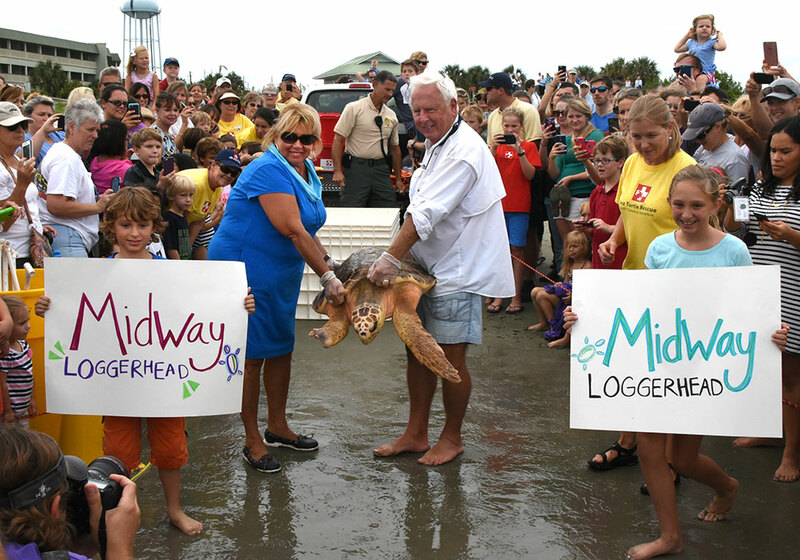 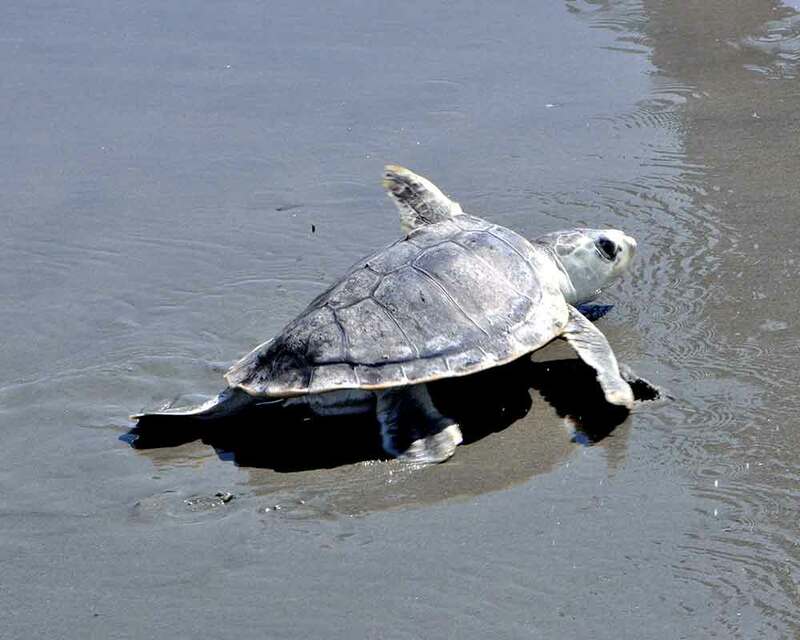 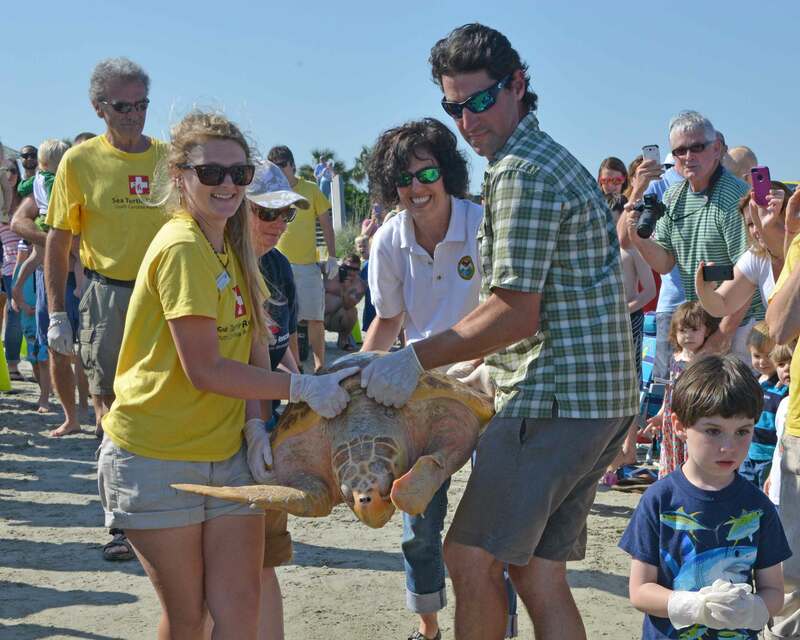 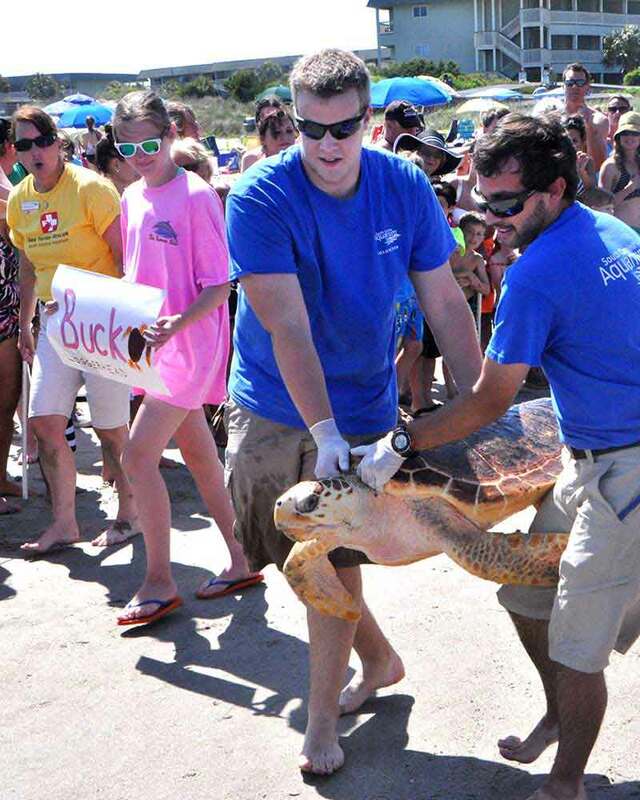 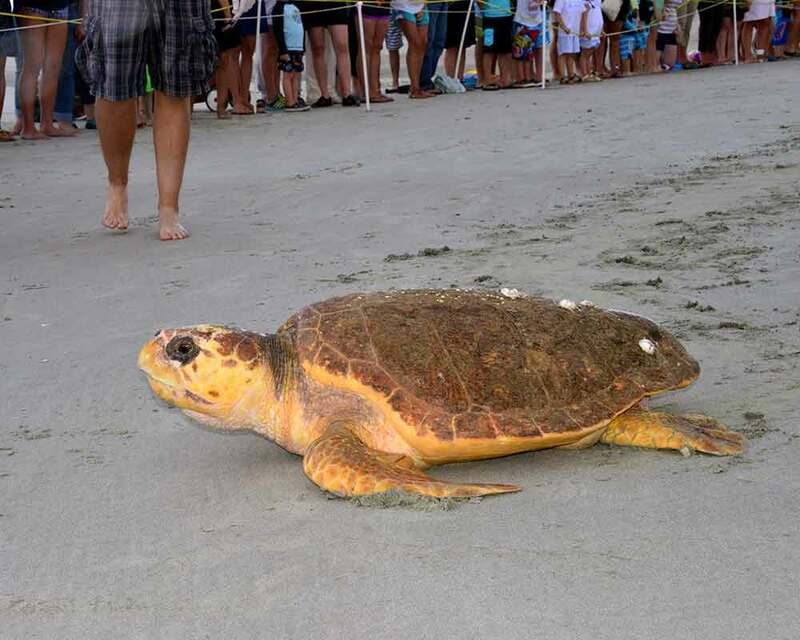 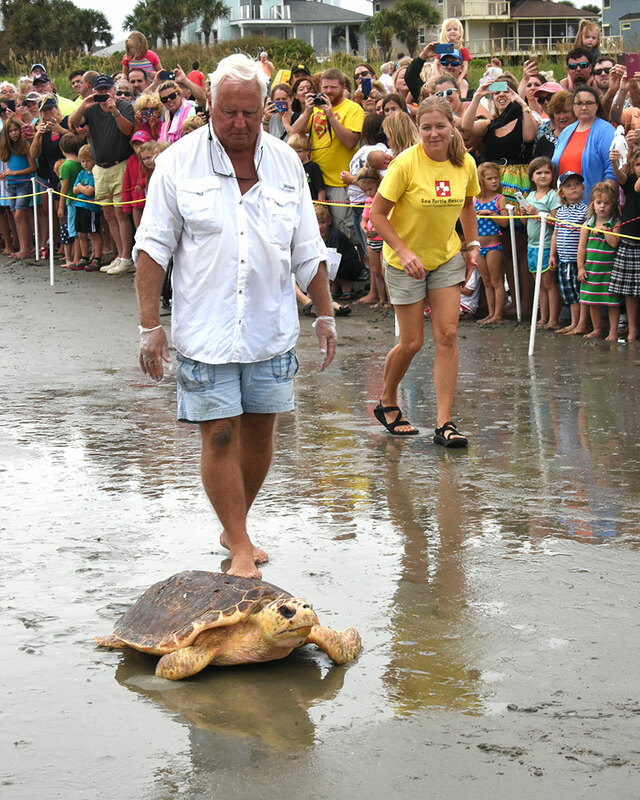 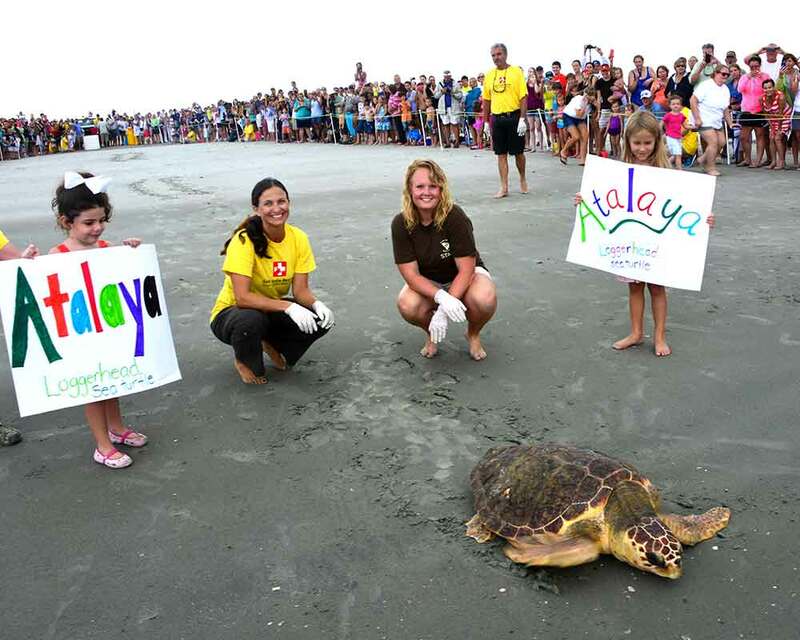 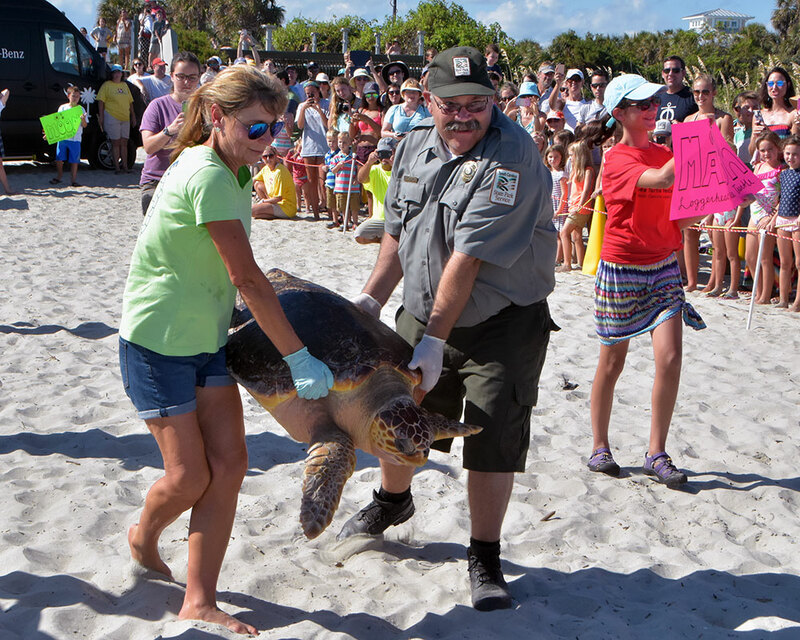 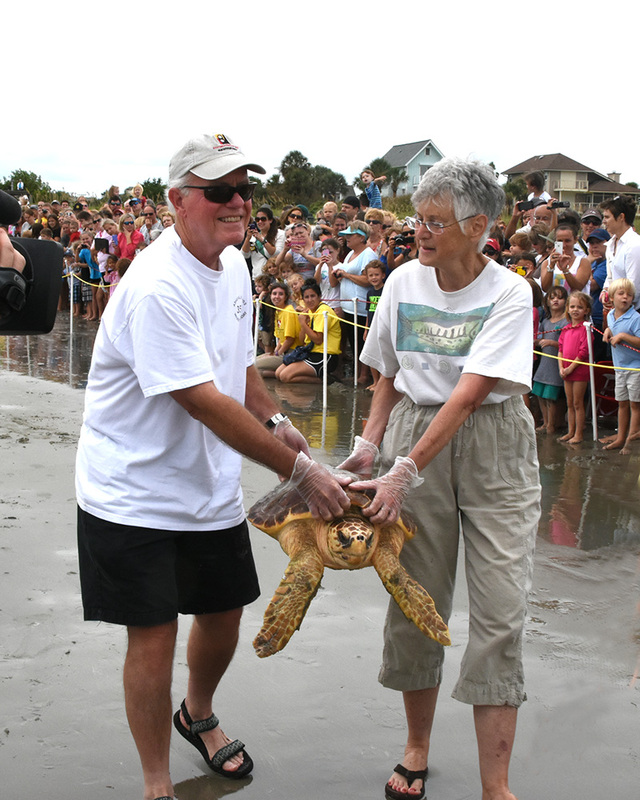 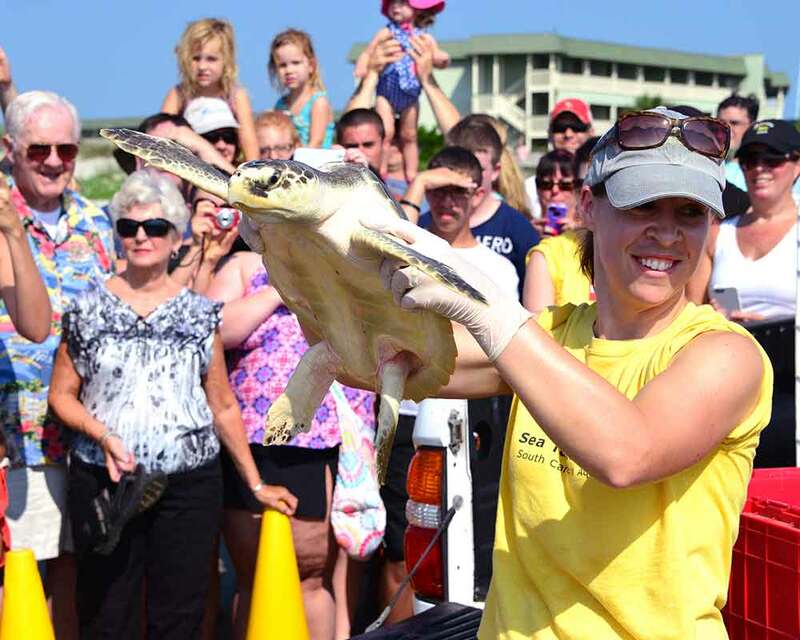 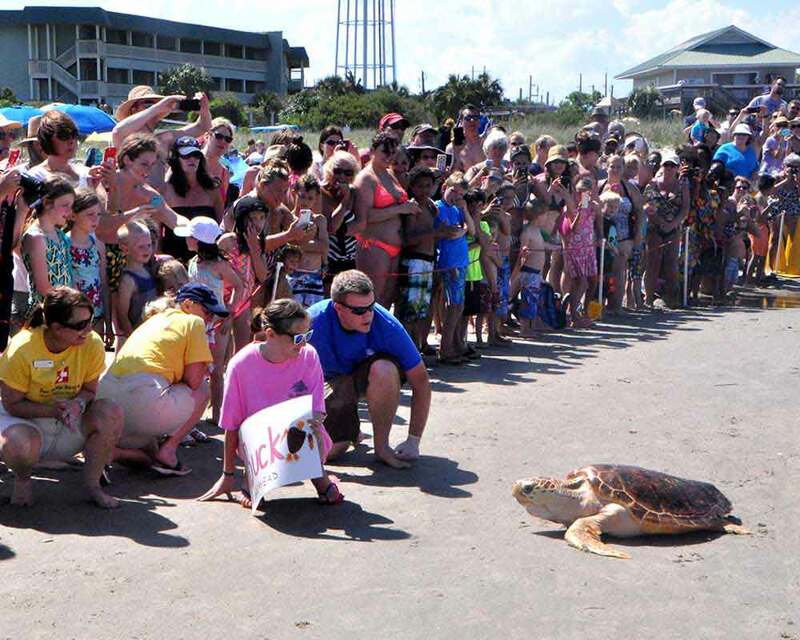 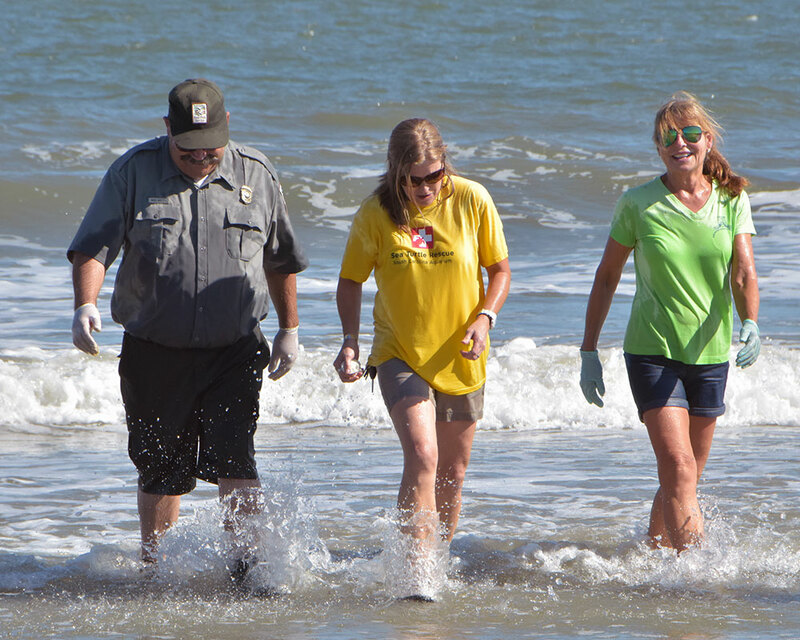 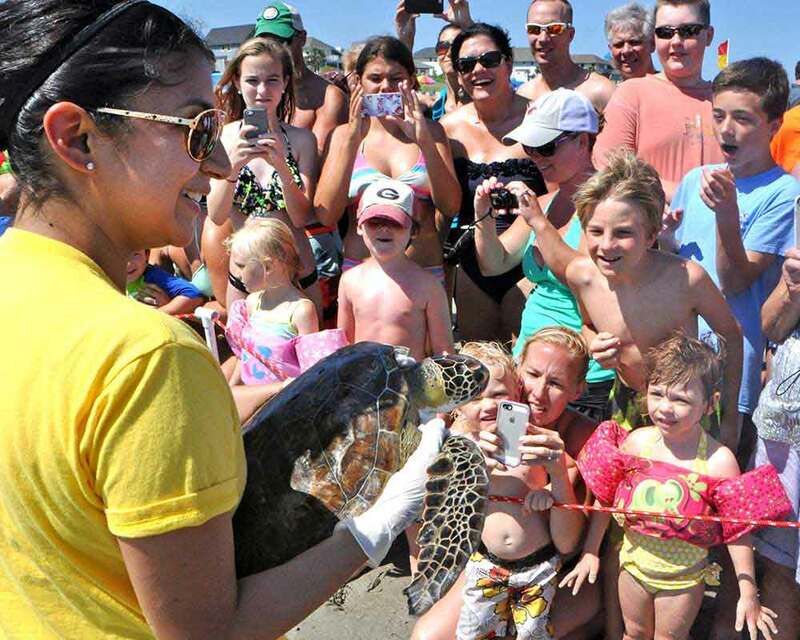 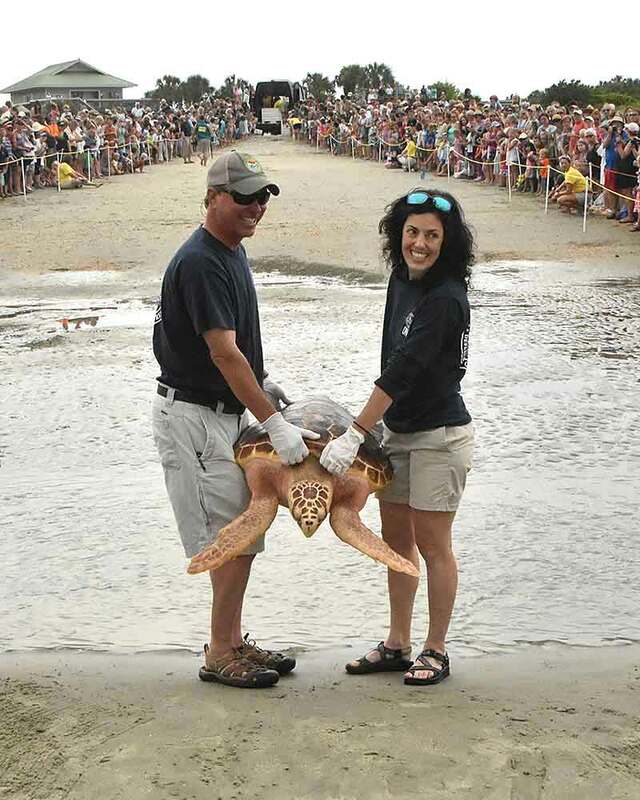 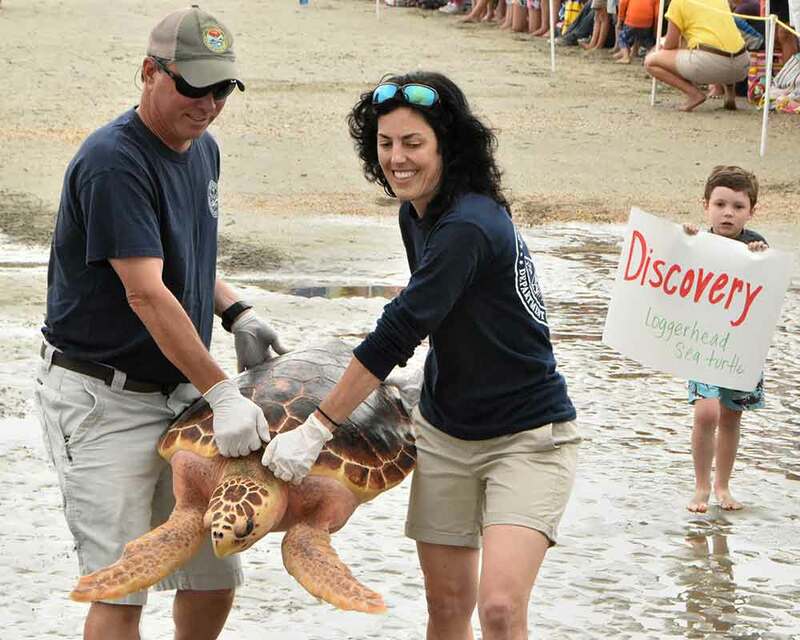 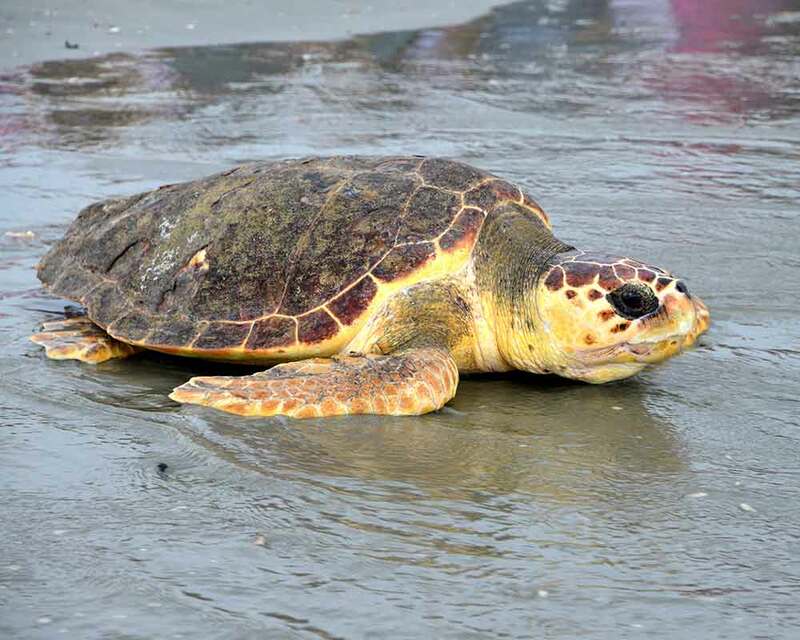 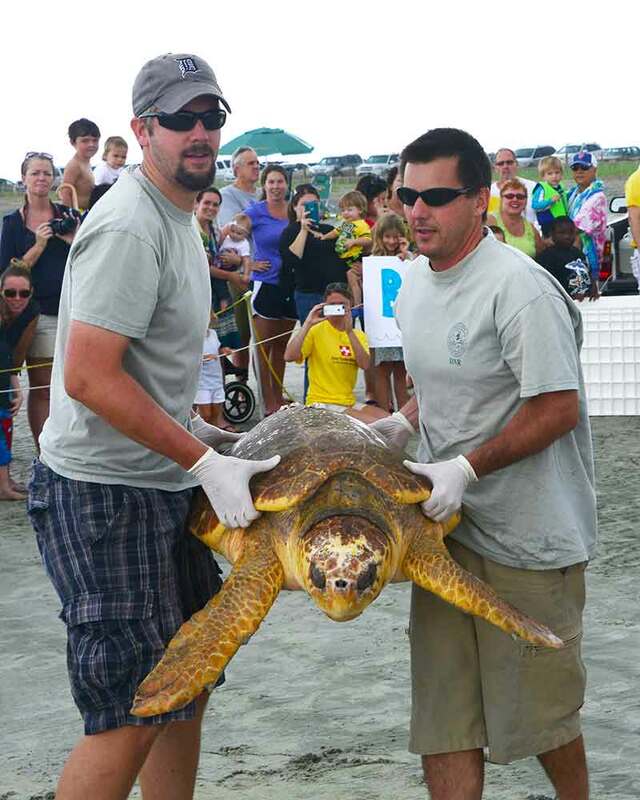 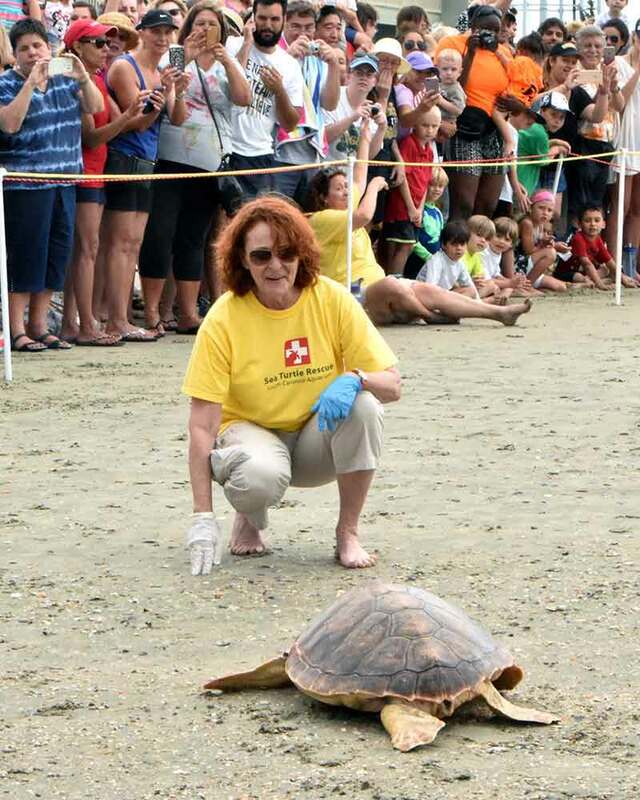 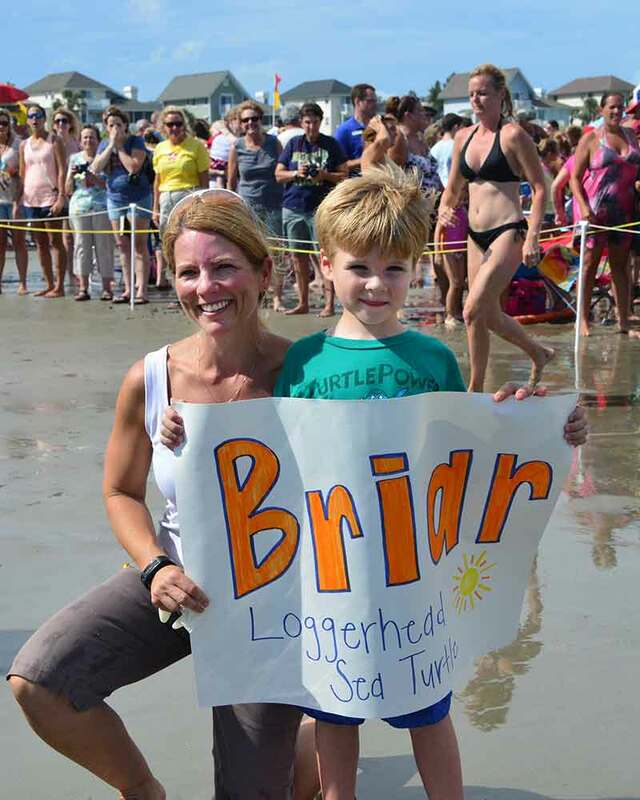 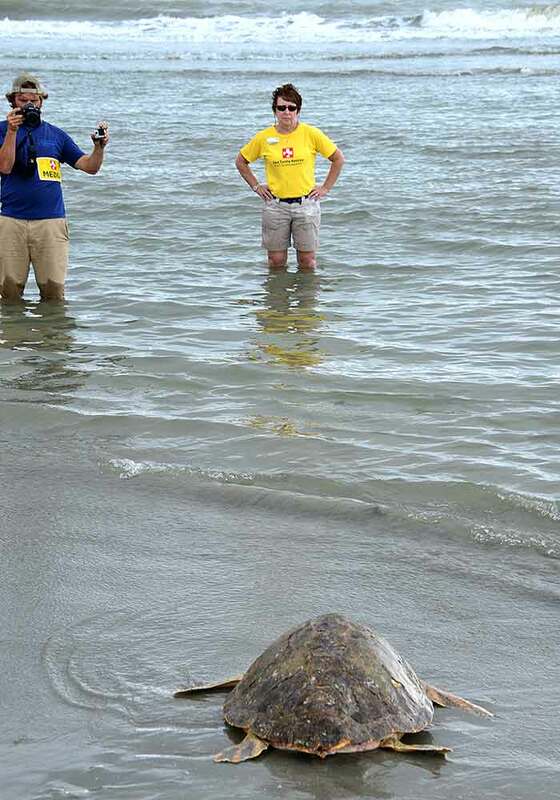 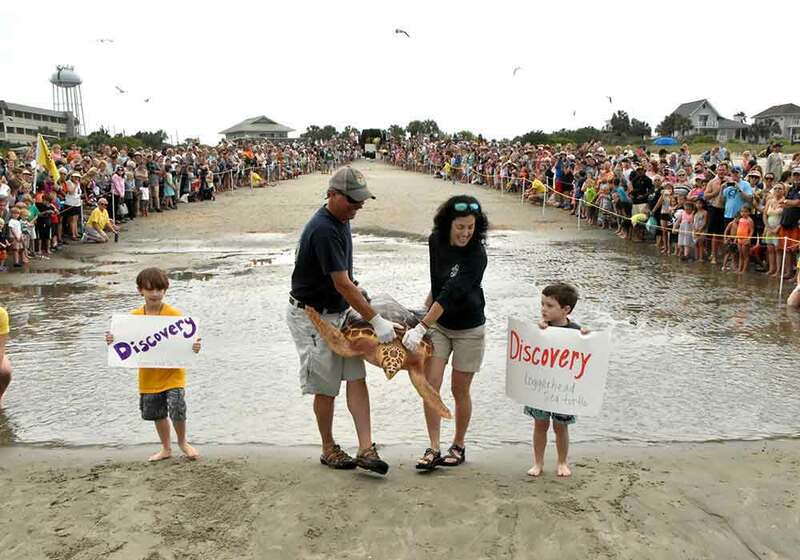 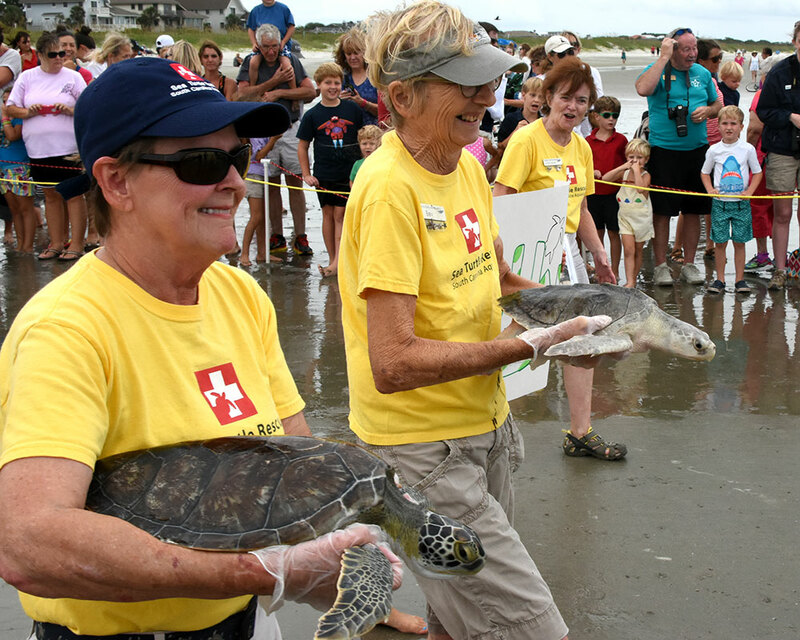 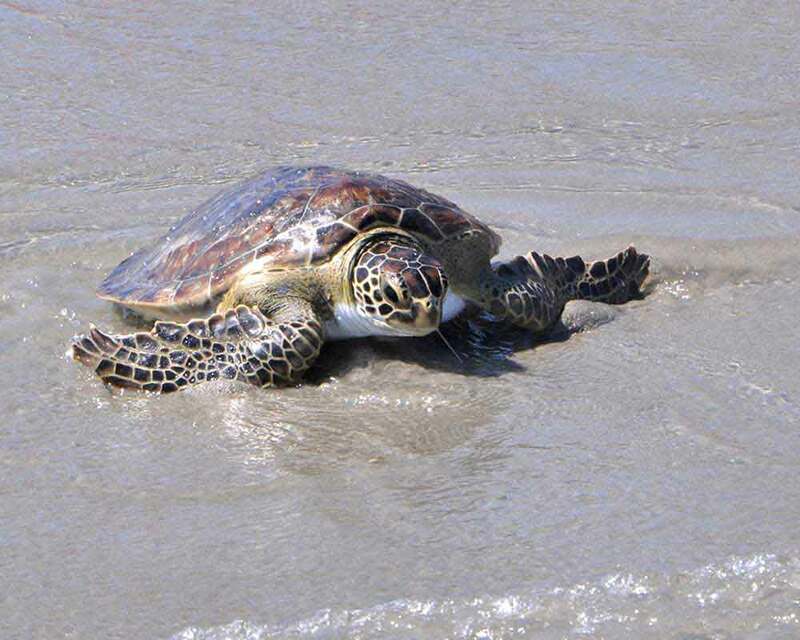 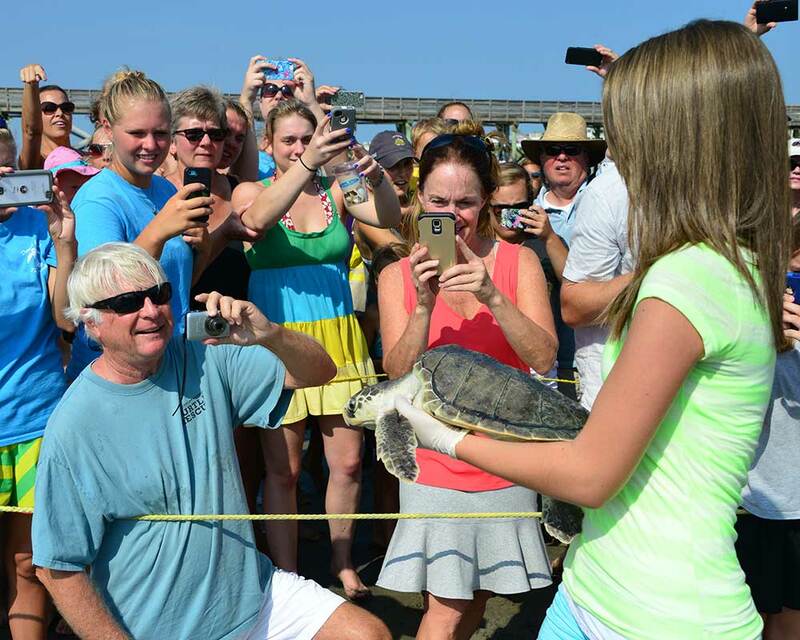 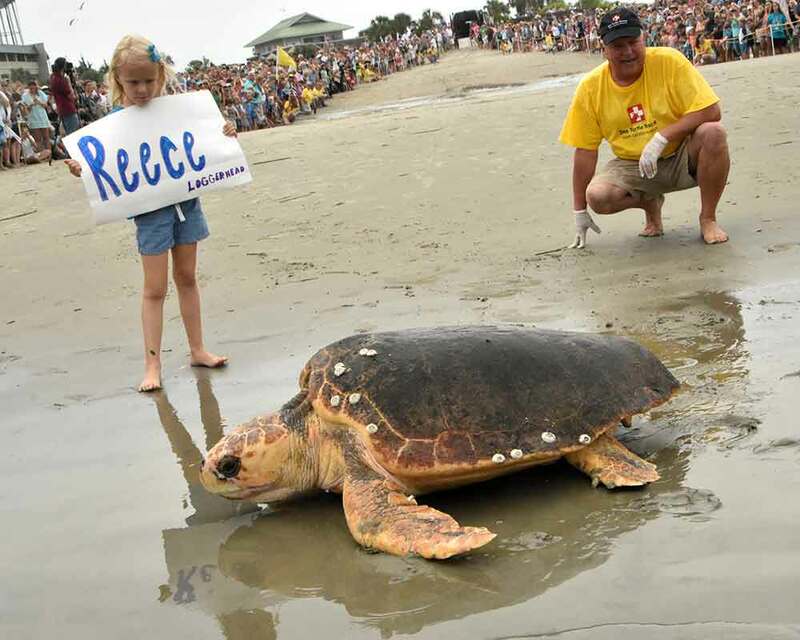 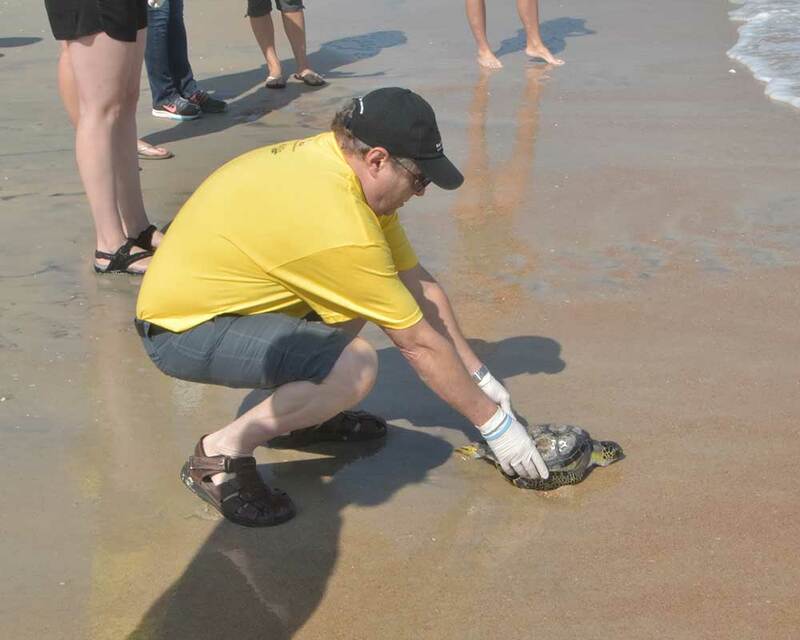 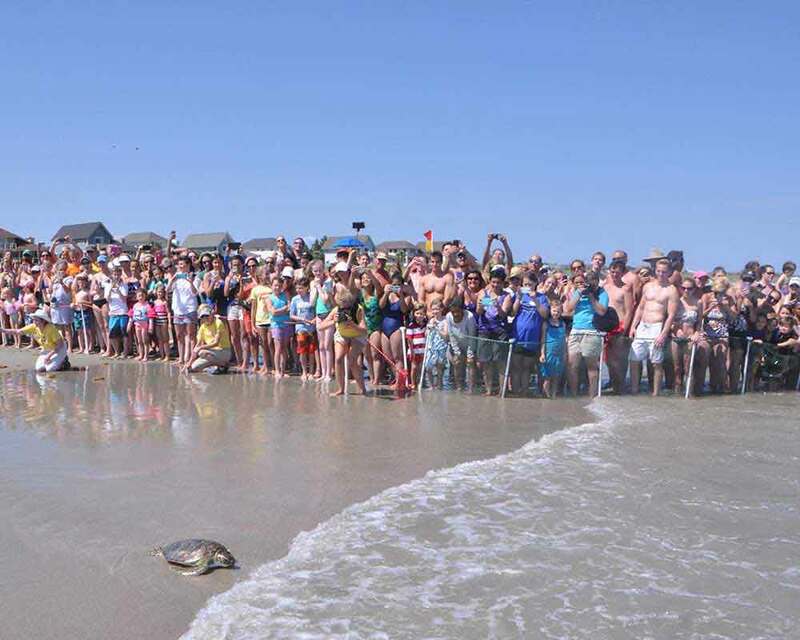 July 15 Briar was released from the County Park on the IOP with a crowd of over 2000 cheering her on. 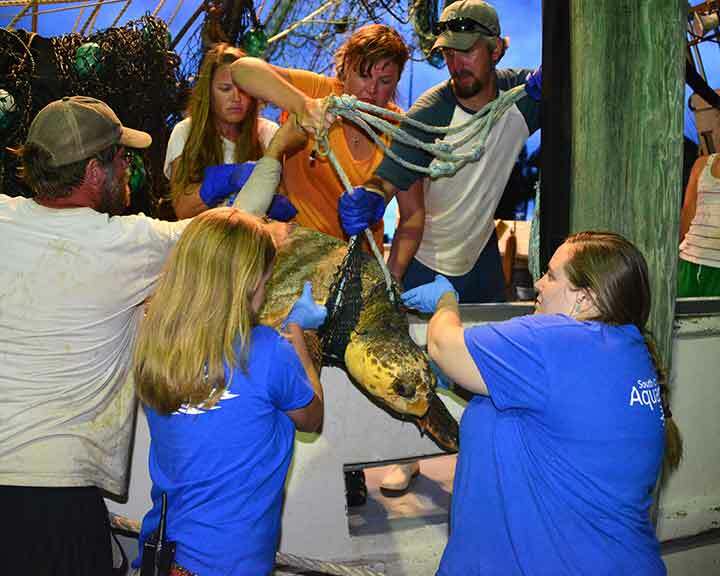 This 123-pound juvenile loggerhead was captured by the SCDNR trawling vessel, the R/V Lady Lisa, and had an unfortunate encounter with a stingray that was caught in the same net. 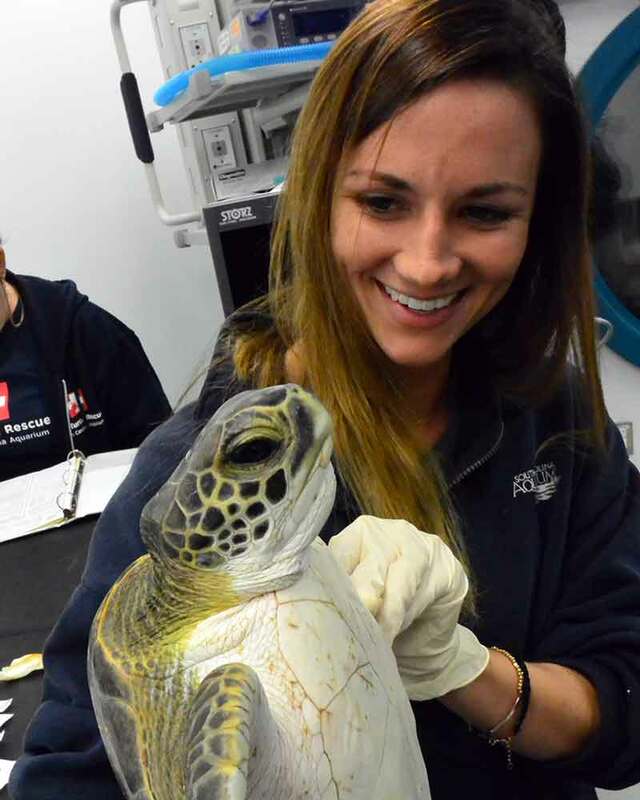 Although the stingray barb was small and did not break off into the turtle’s tissue as they sometimes do, it did puncture the body cavity of the turtle and necessitated this animal’s admittance into our Sea Turtle Hospital. 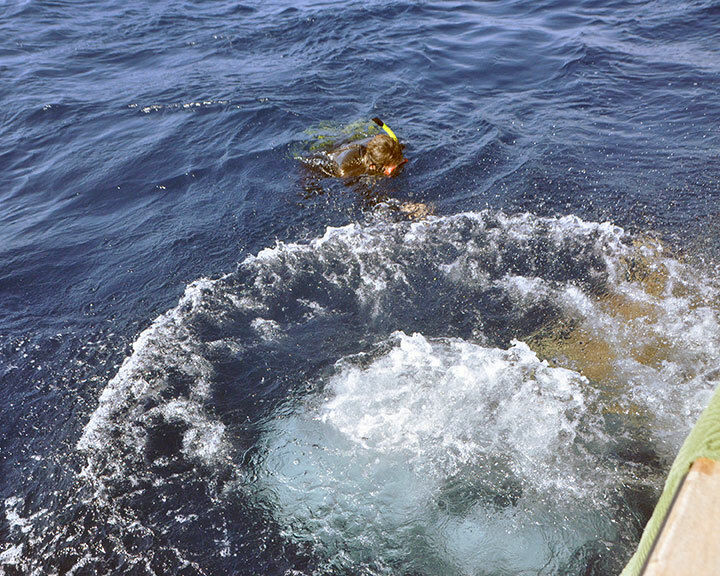 Dexamethasone, an anti-inflammatory steroid, was administered onboard the trawler to minimize the effects of the venom dispersed from the stingray barb. 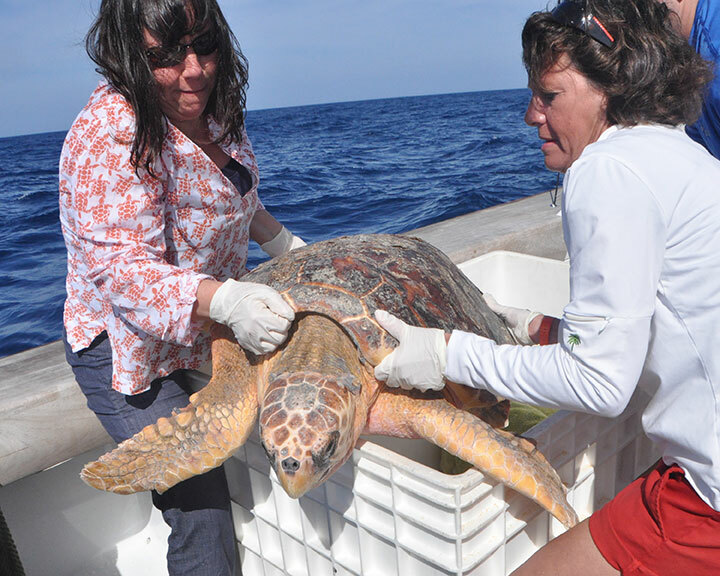 The Sea Turtle Rescue Team, Kelly and Whitney met the R/V Lady Lisa at approximately 8:30 p.m. to transfer “Trawler” to the Aquarium’s Sea Turtle Hospital. 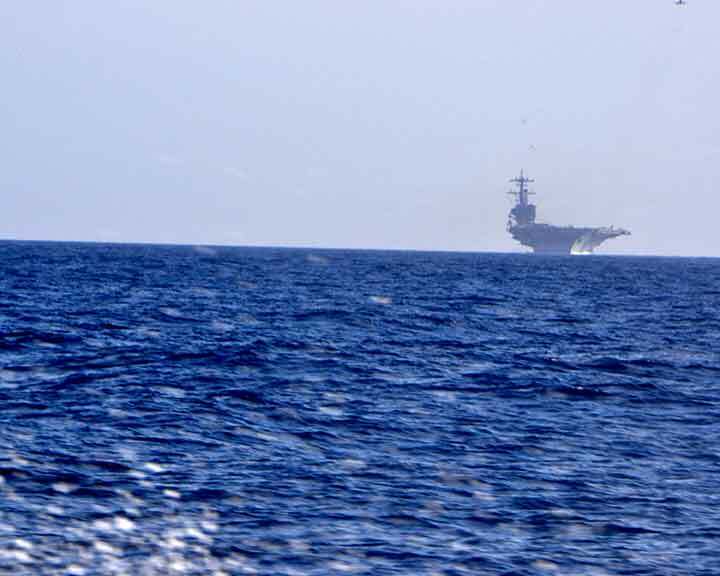 About a week ago this web page was hacked and over two years of stories disappeared. 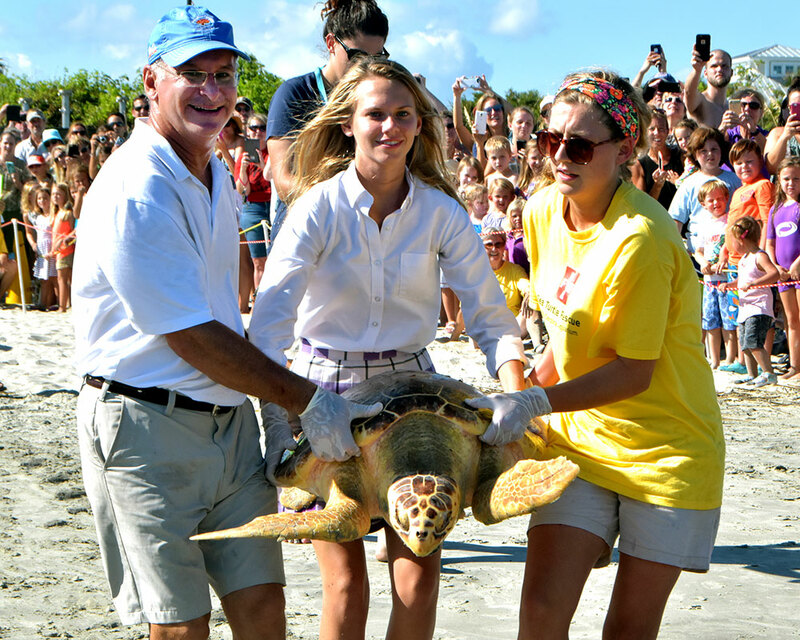 What I have done is give you a taste of the day to day work of the Turtle Hospital...I hope you enjoy it. 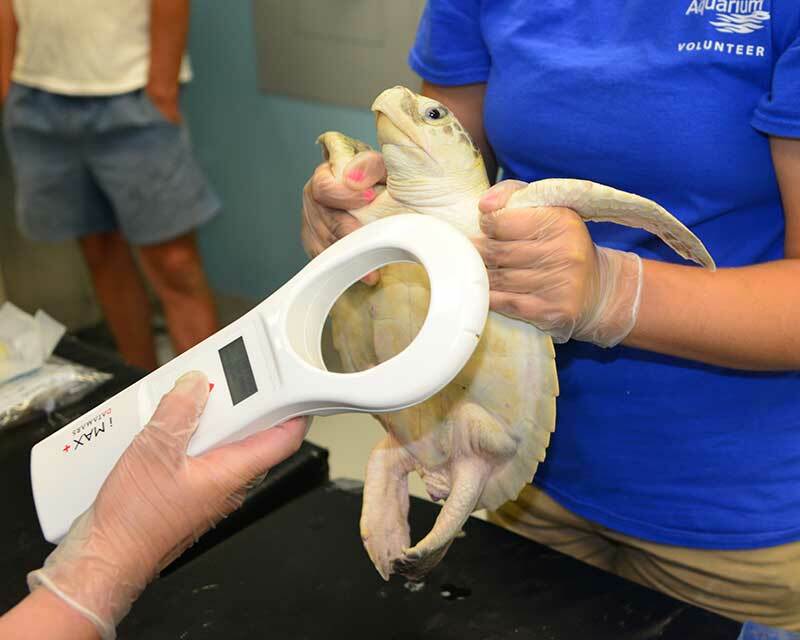 This little guy came in at 6.5 lbs and is now 21 lbs. 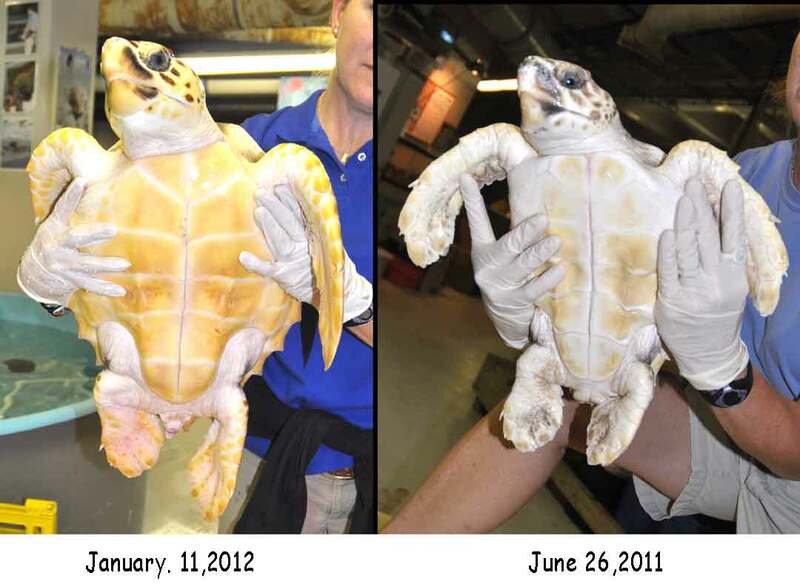 What a difference a good diet has made.